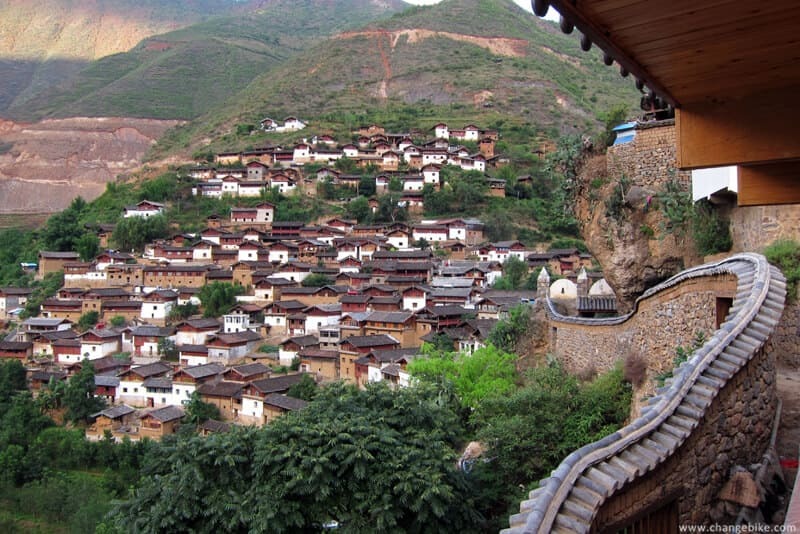 The Baoshan Stone City in the early morning. 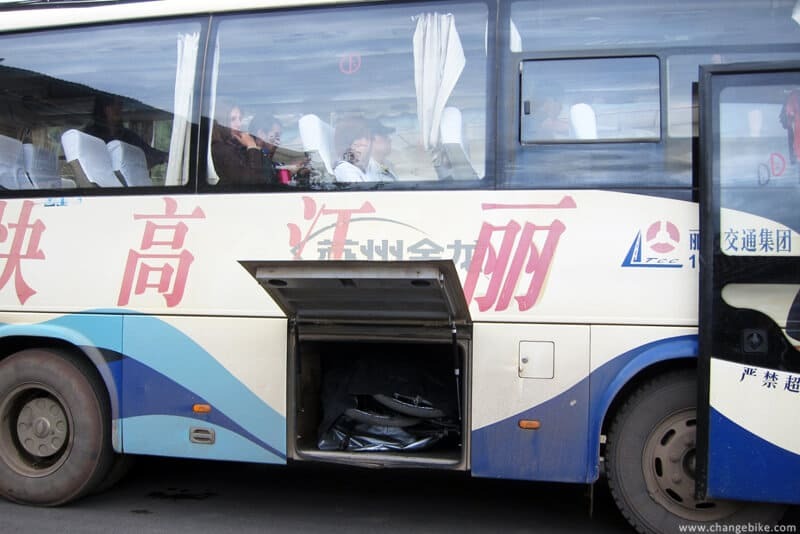 We decided to charter a bus (RMB400) to go back to Lijiang first because we did not want to miss Jade Dragon Snow Mountain. 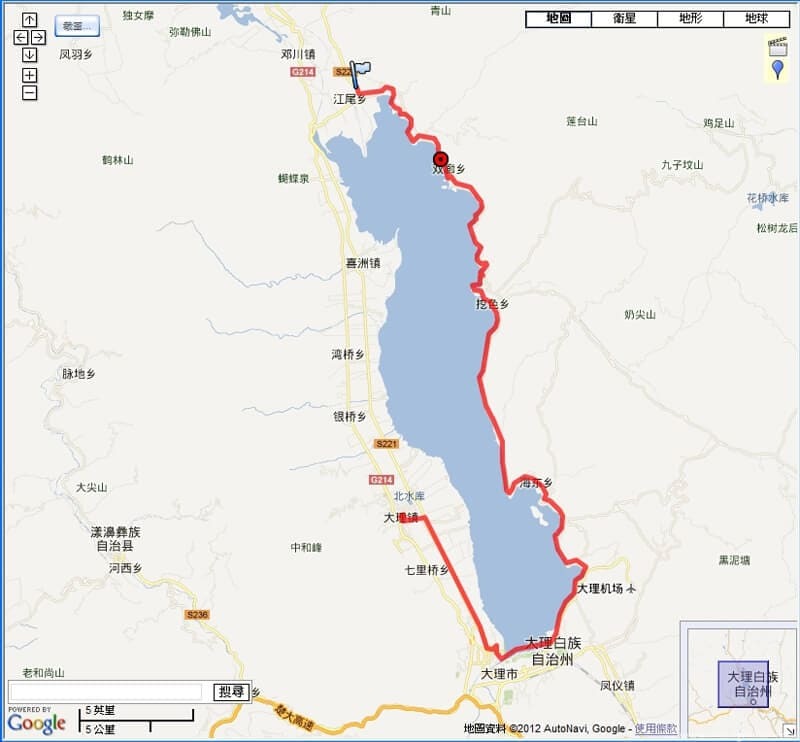 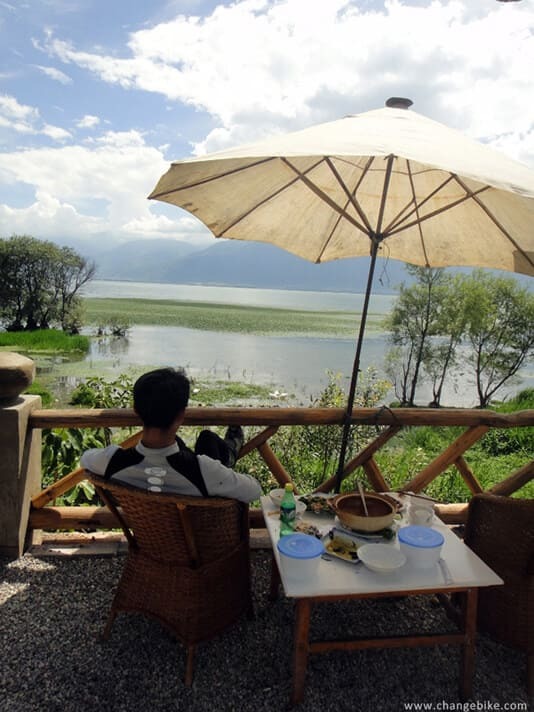 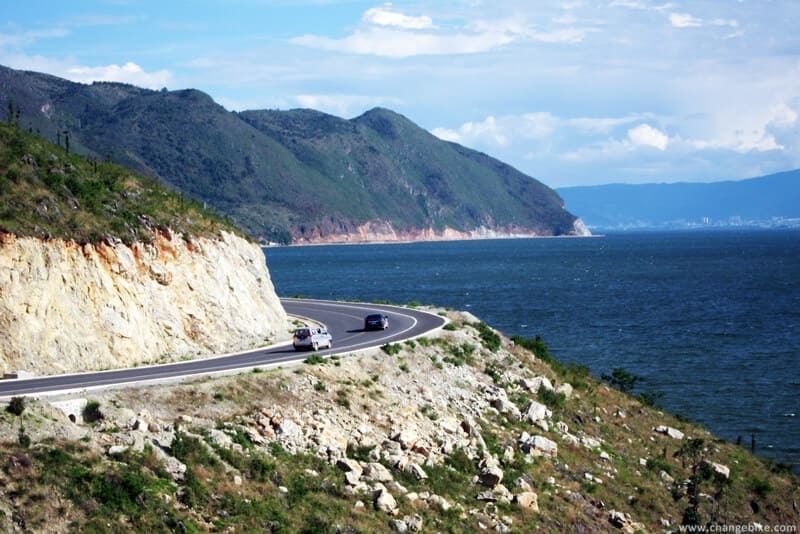 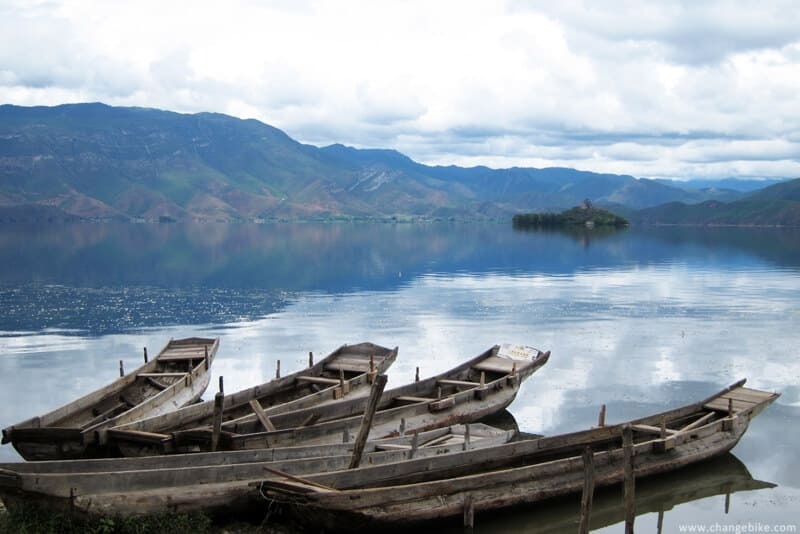 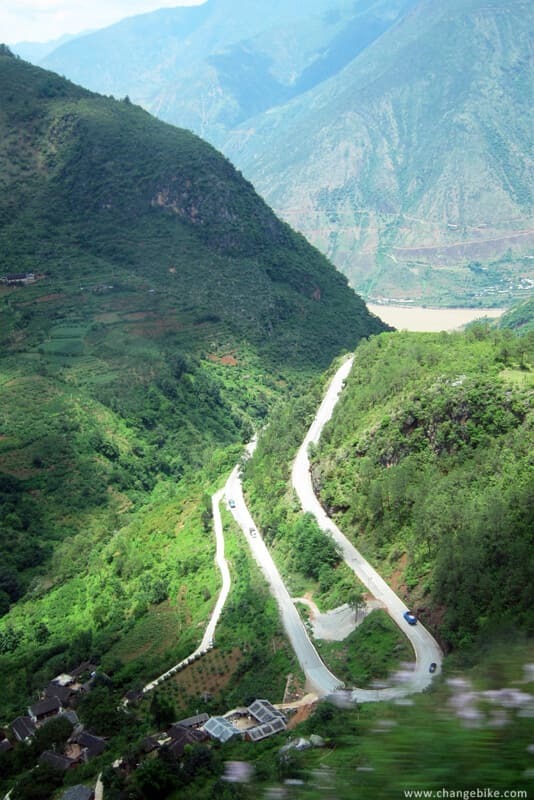 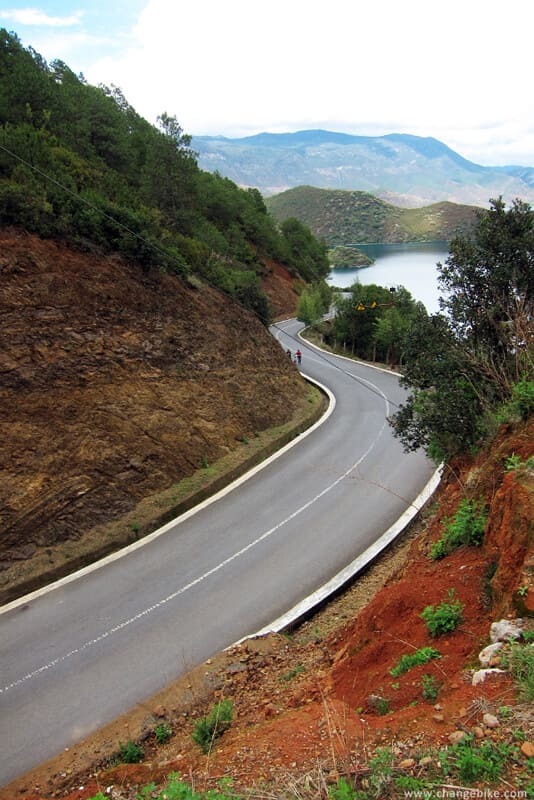 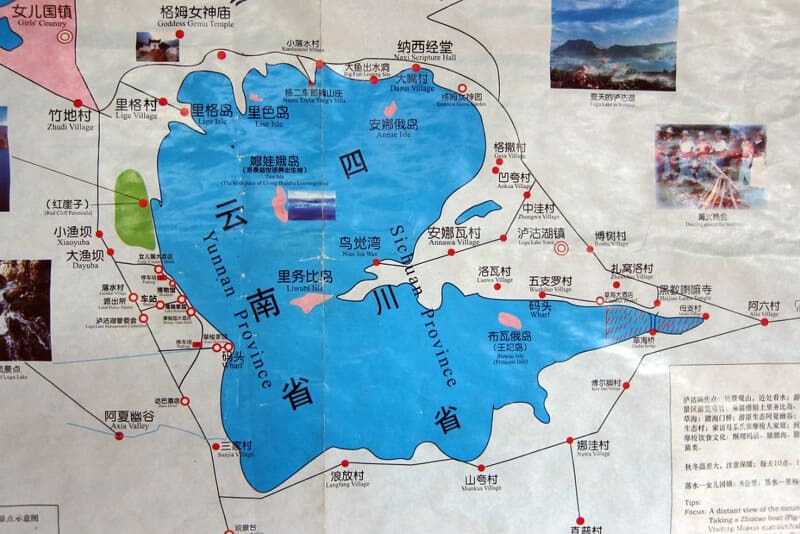 We would get a ride to Lugu Lake tomorrow. 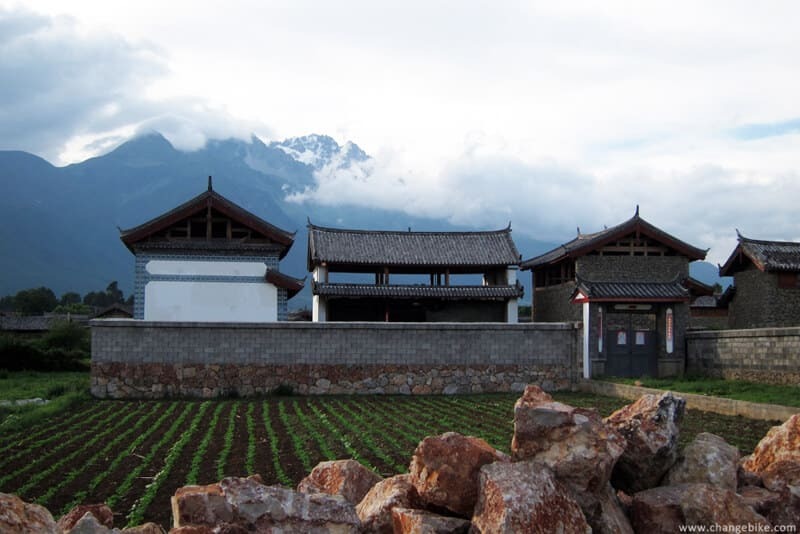 There were many clouds today, and we were sorry about hardly seeing the mountaintop of the Jade Dragon Snow Mountain. 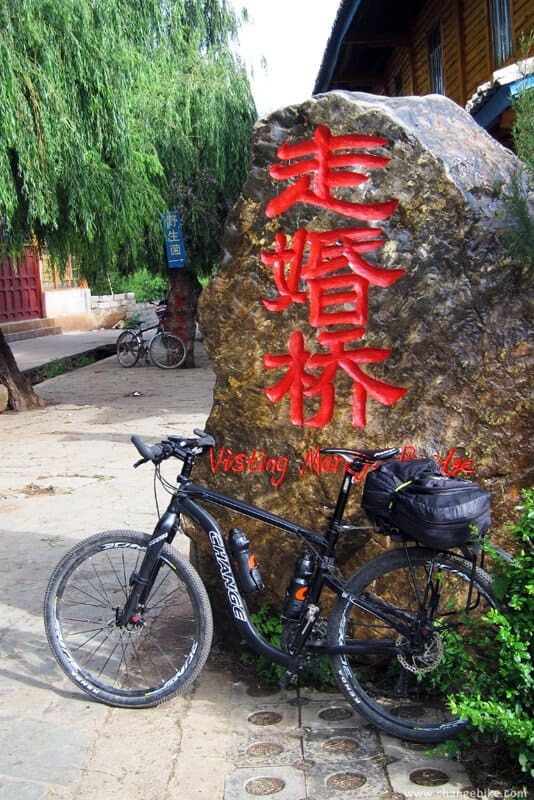 We stopped to take pictures at Blue Moon Valley and White Water River in the middle of ridding. 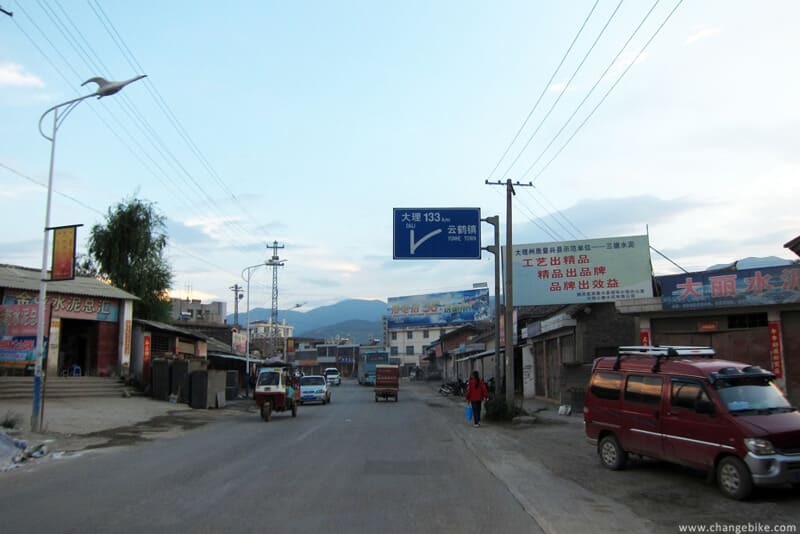 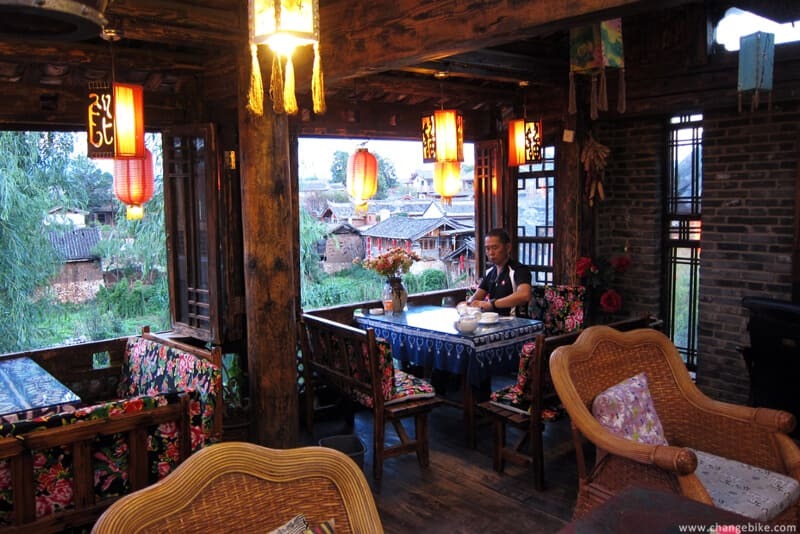 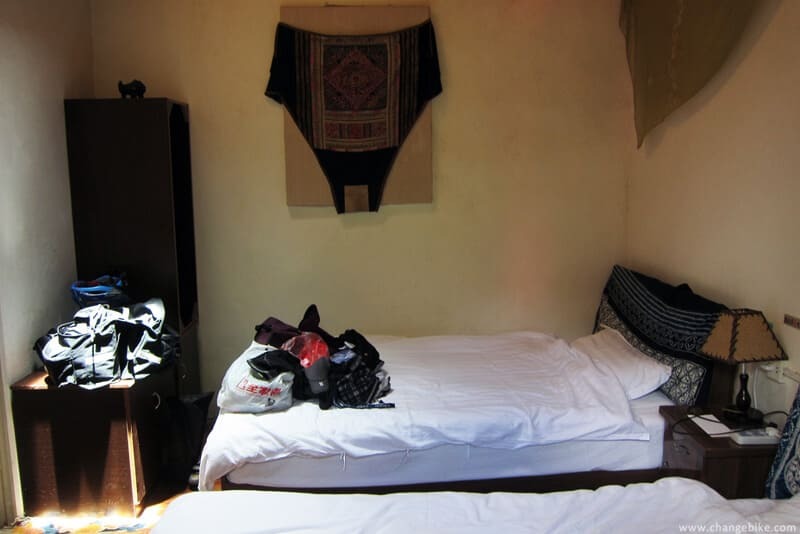 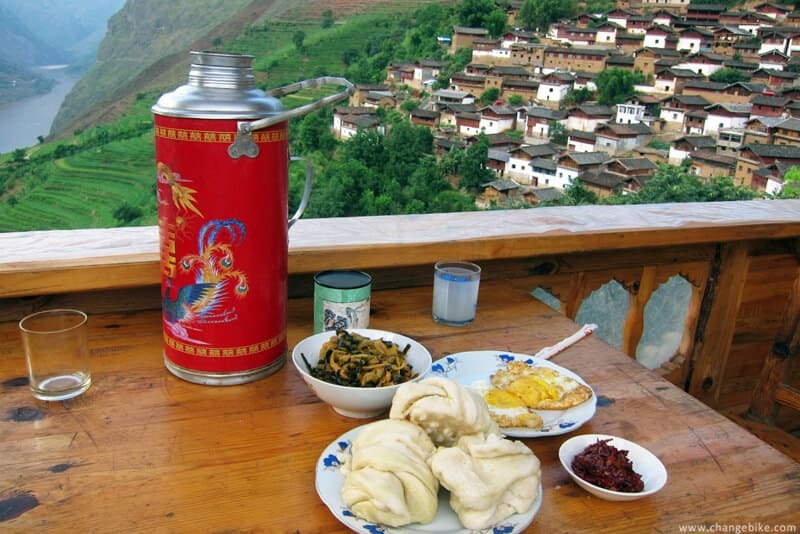 We arrived in Shuhe Town at 1:00 pm, and stayed at Freeshuhe Inn. 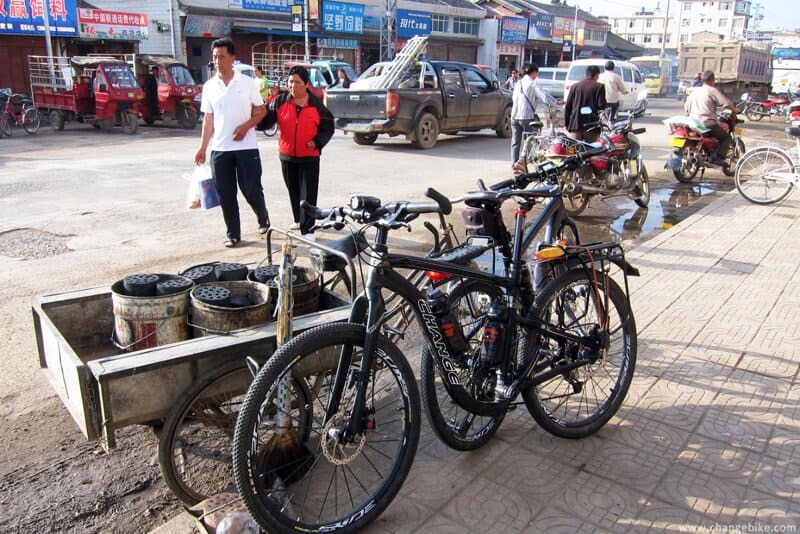 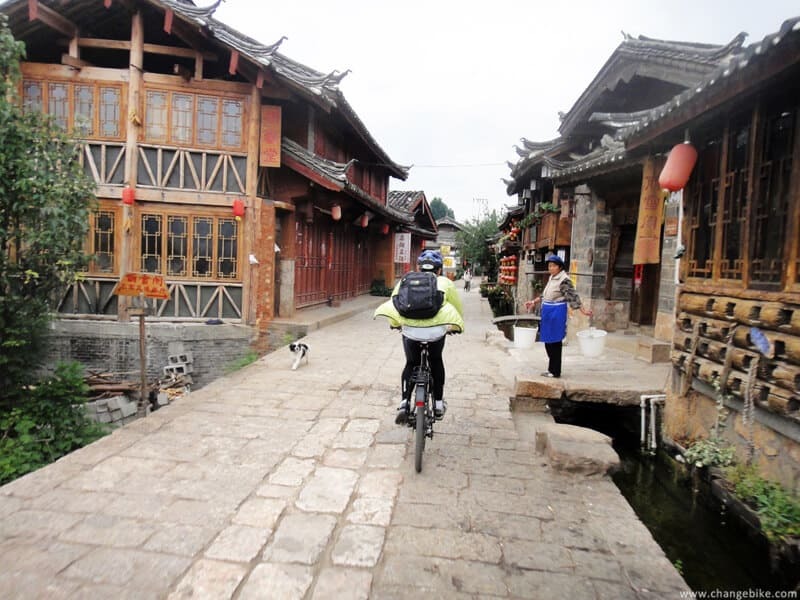 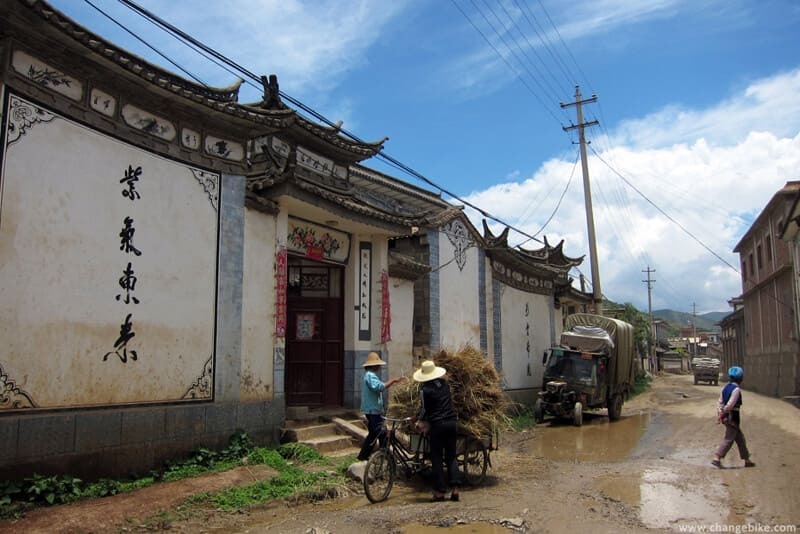 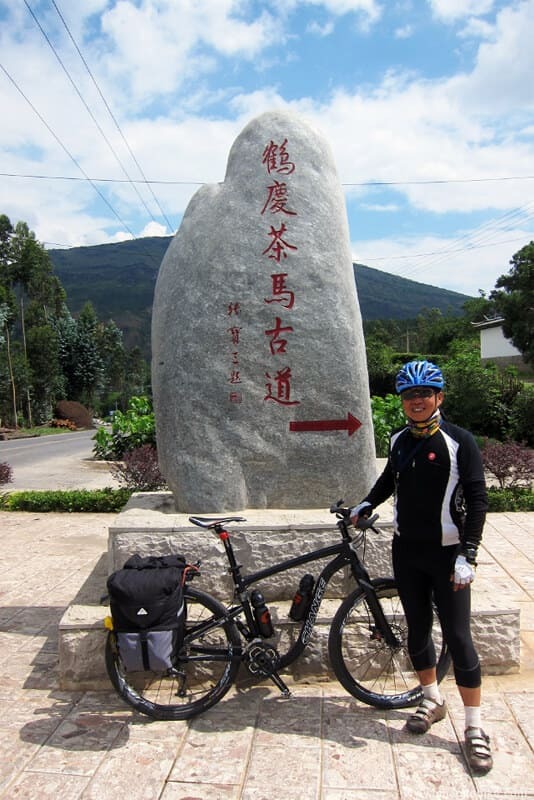 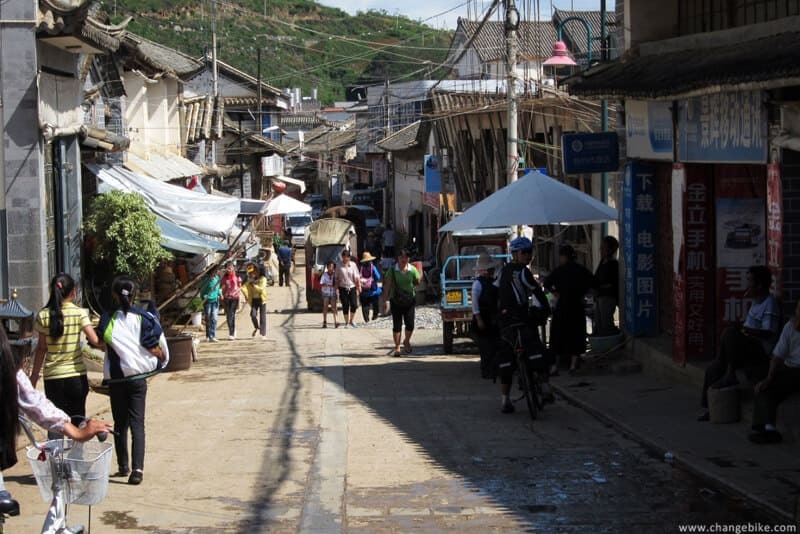 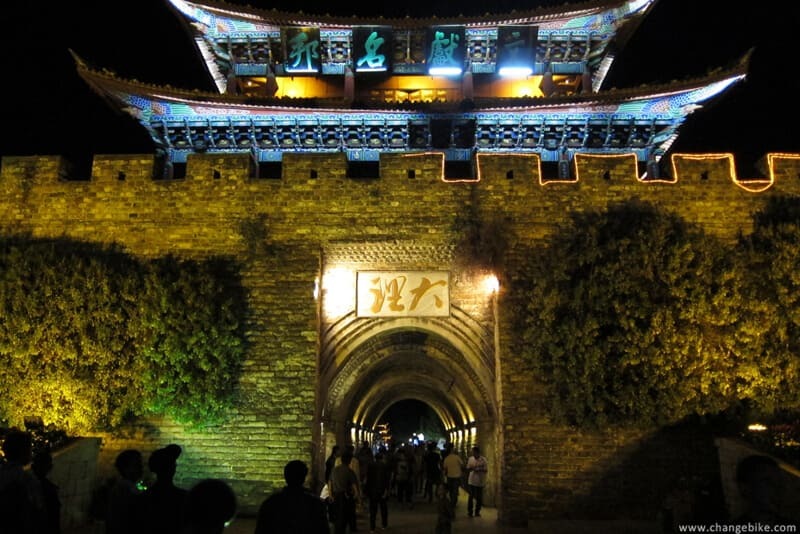 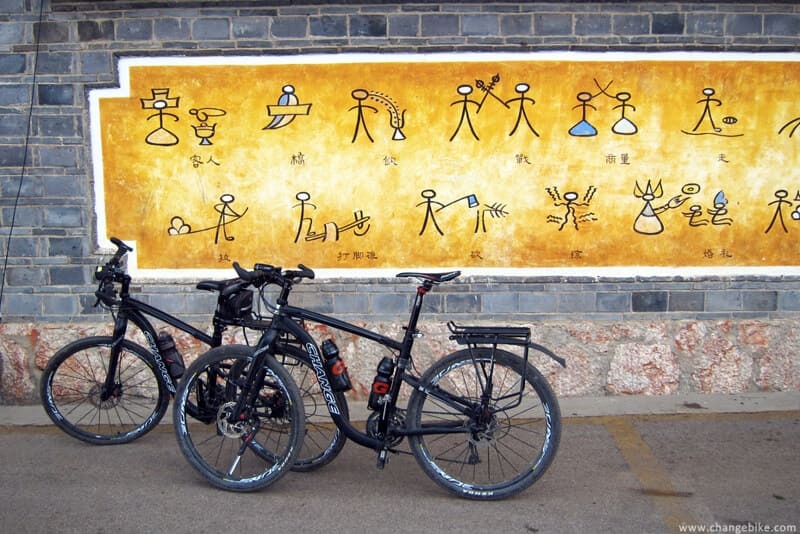 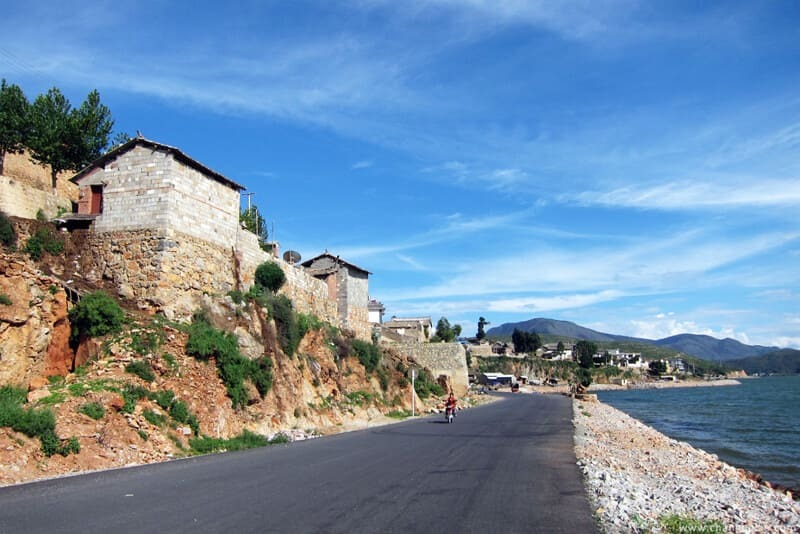 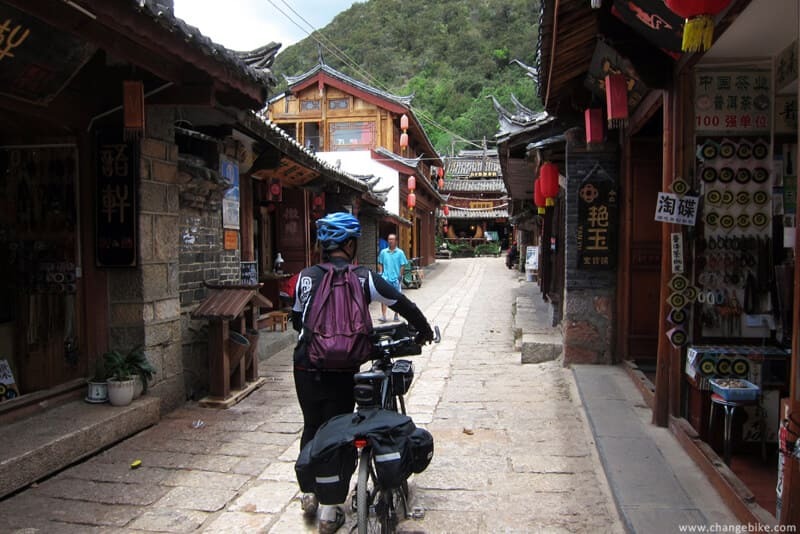 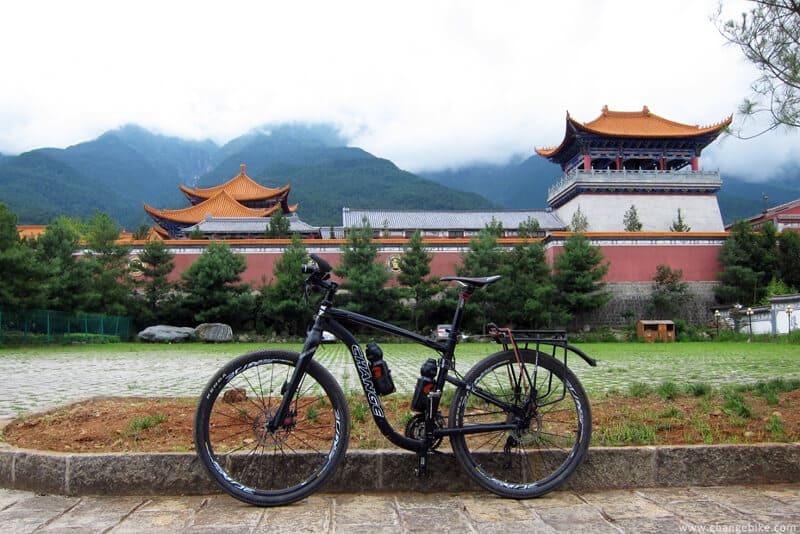 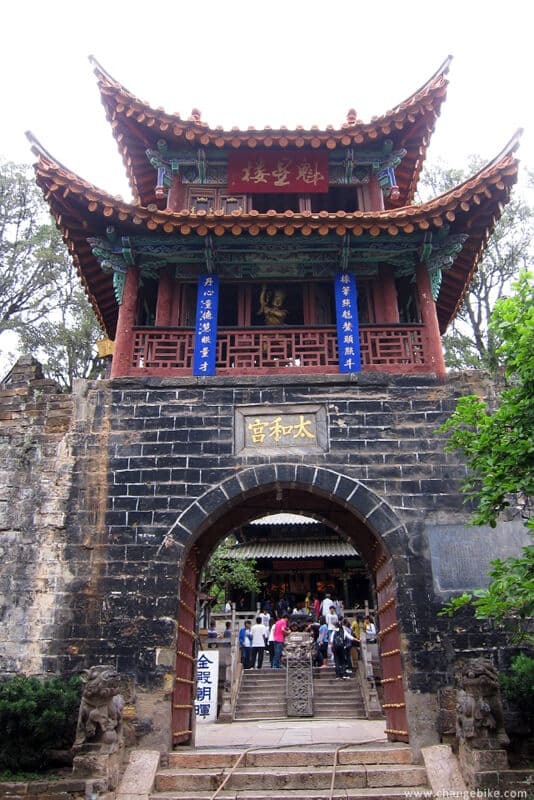 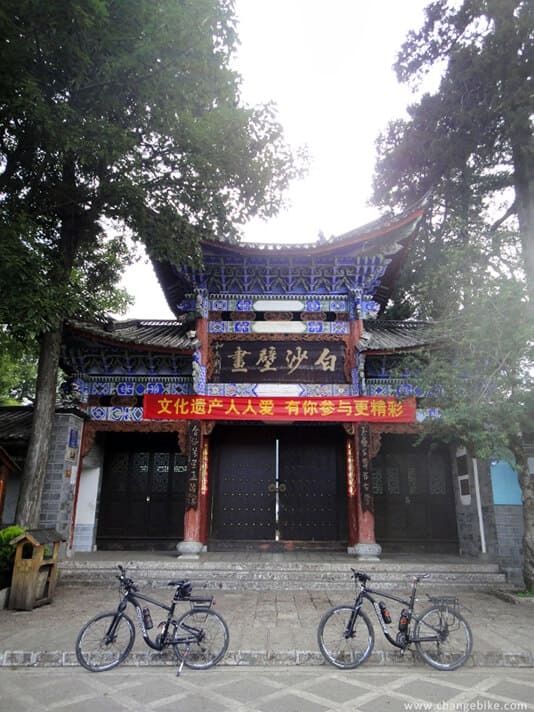 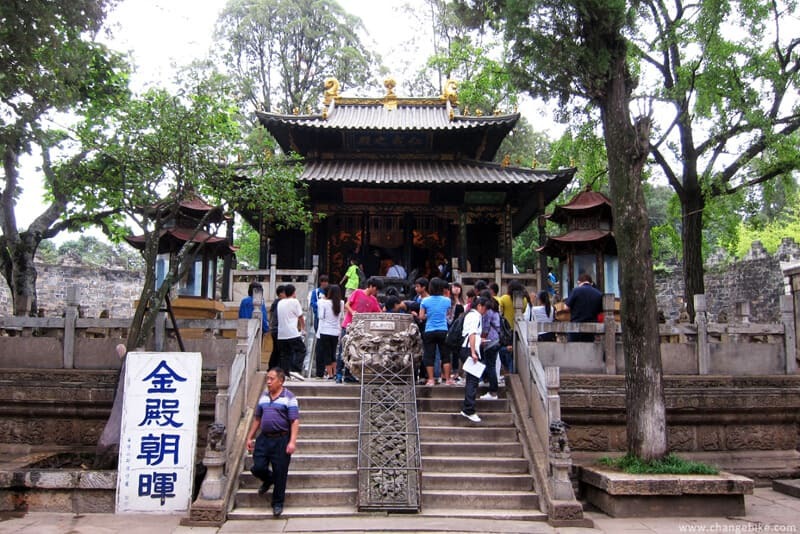 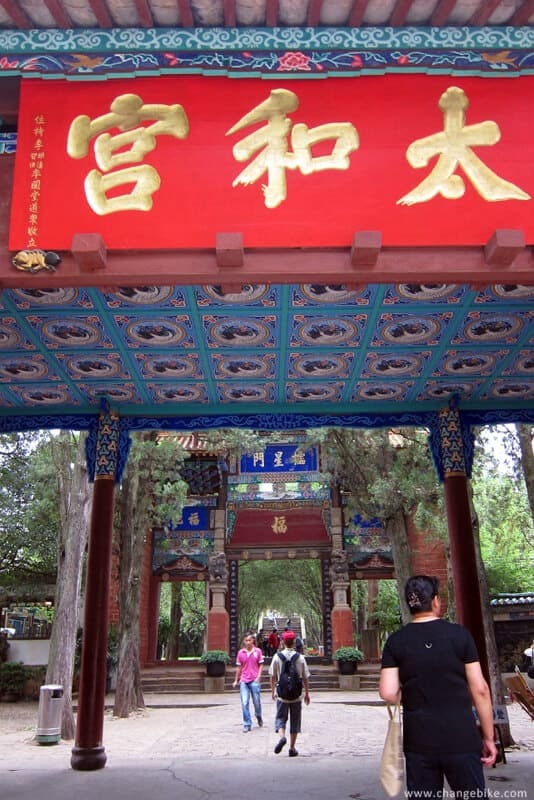 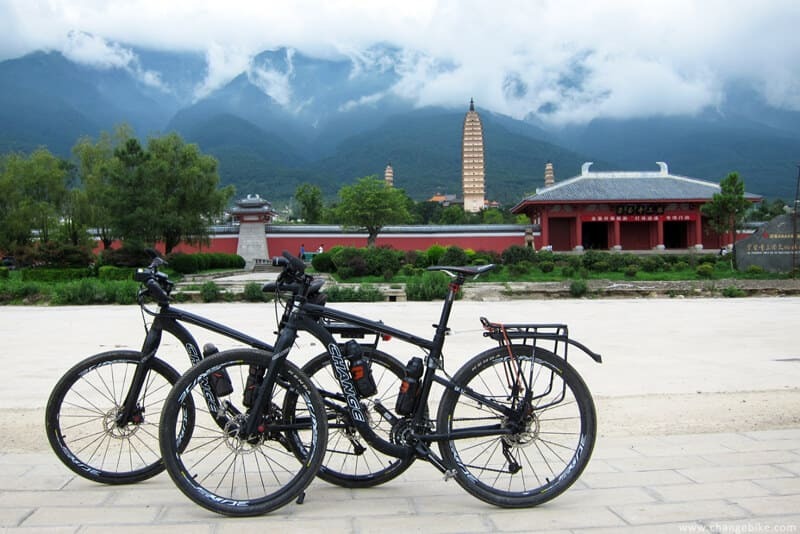 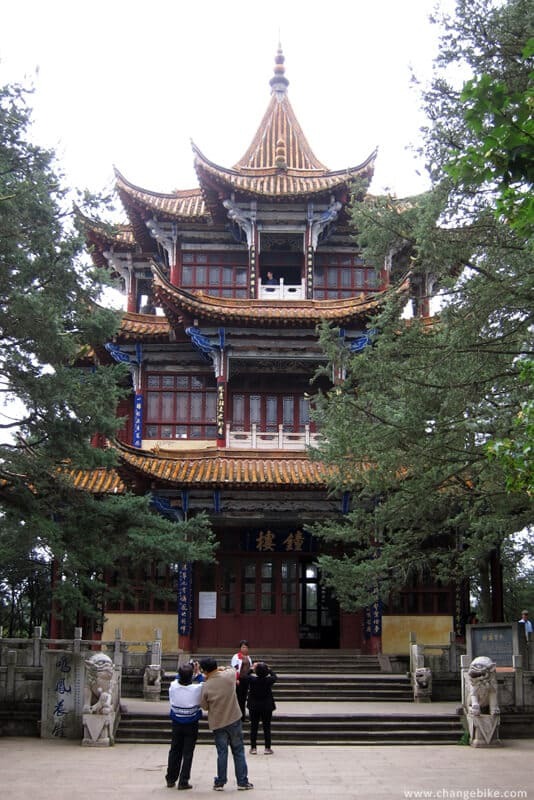 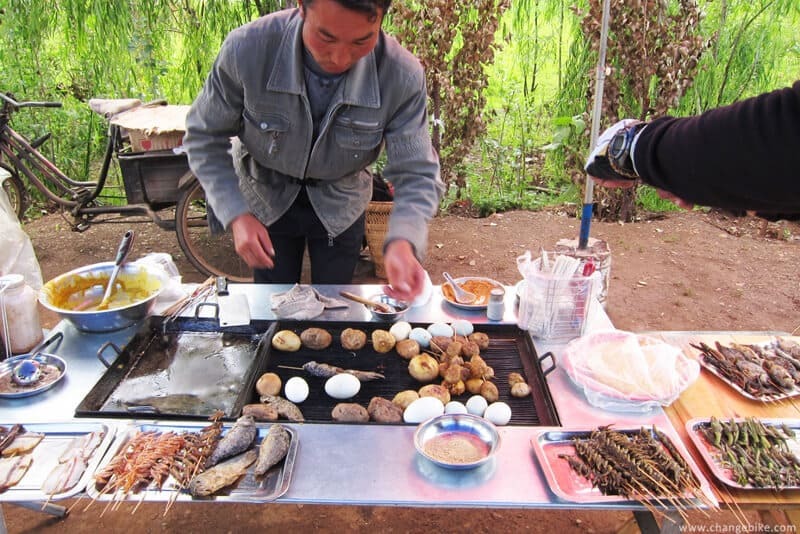 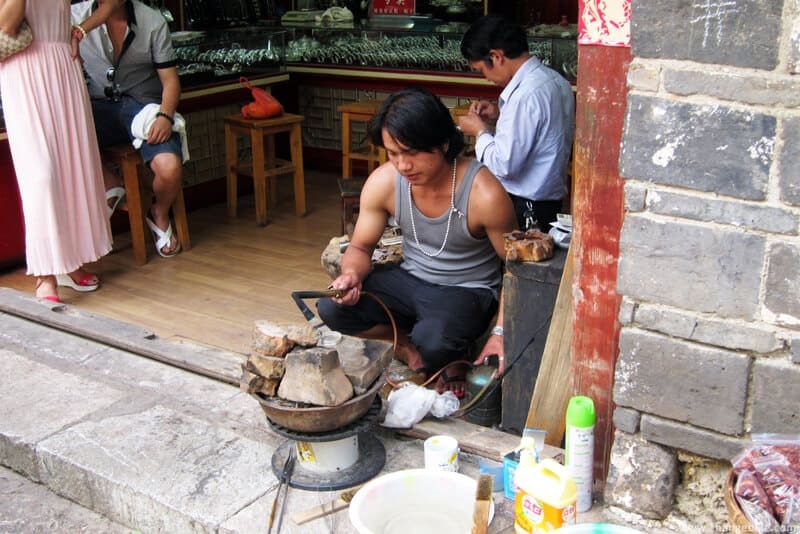 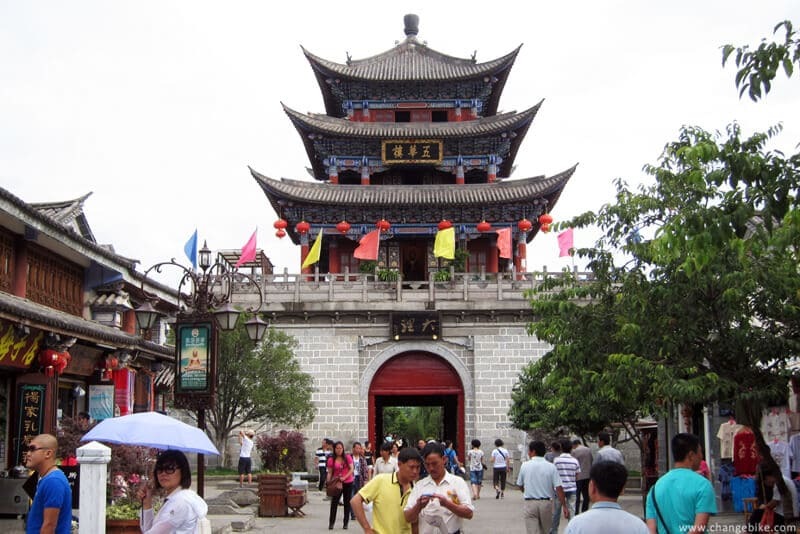 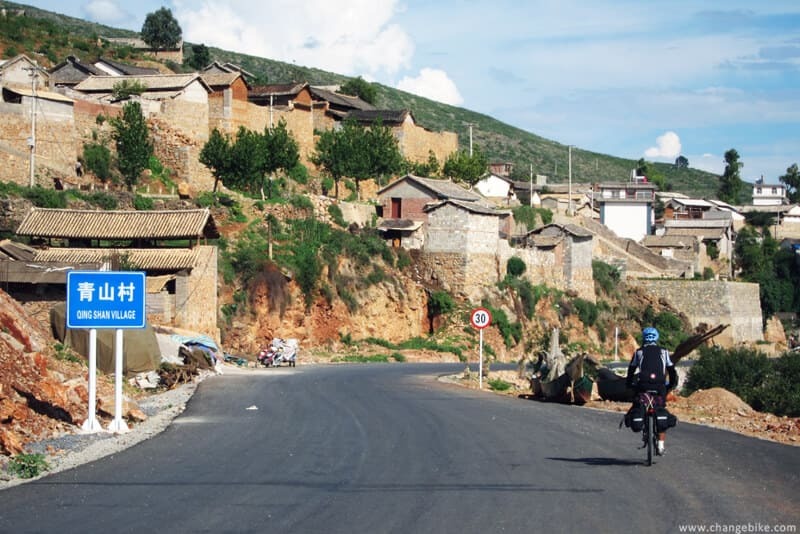 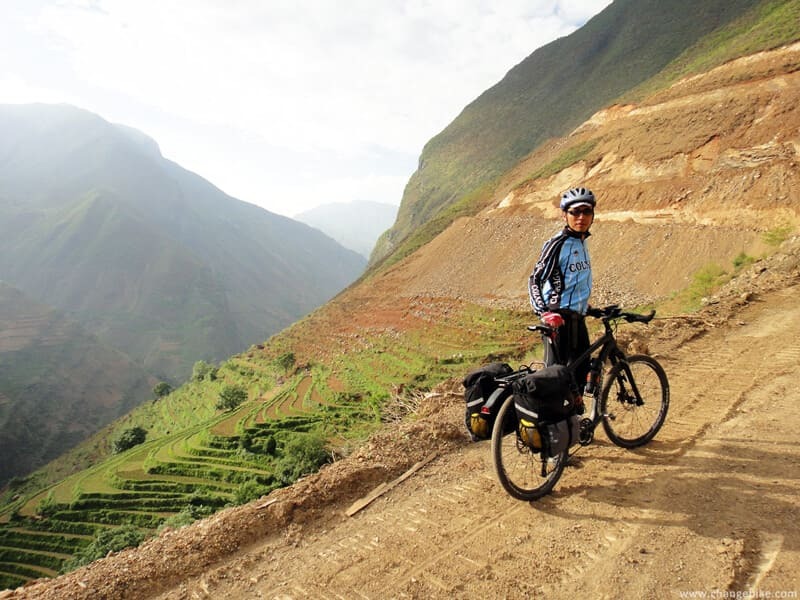 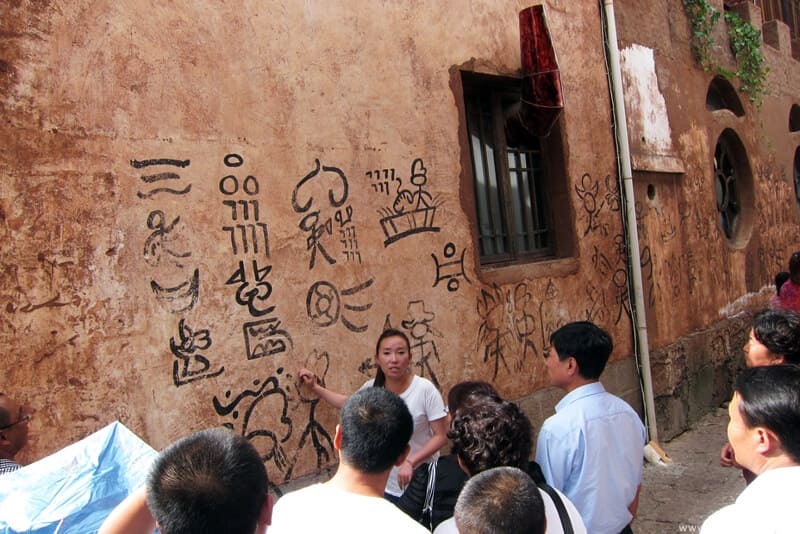 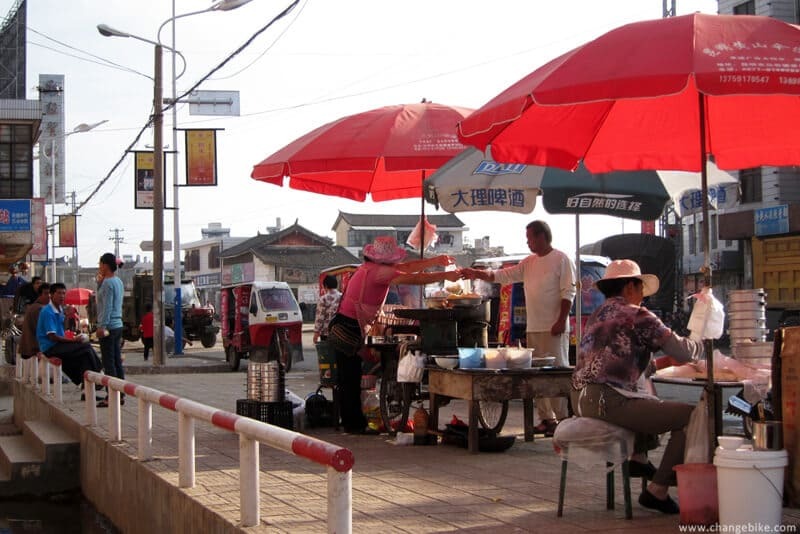 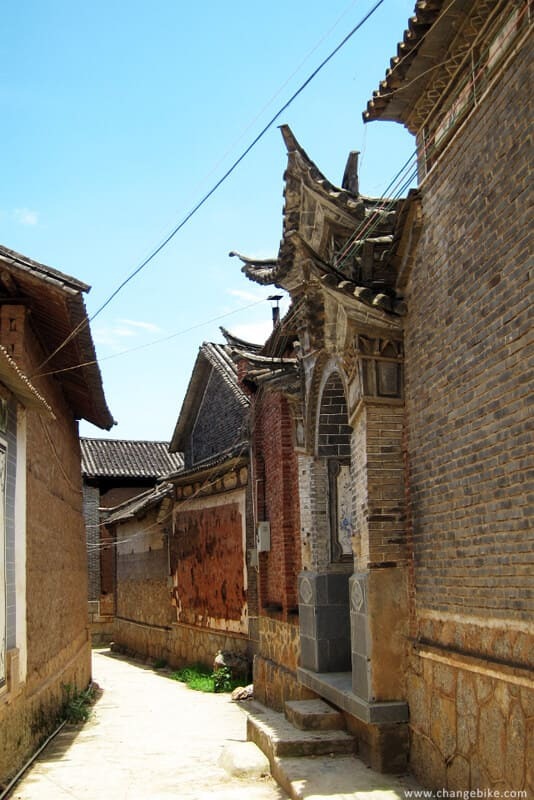 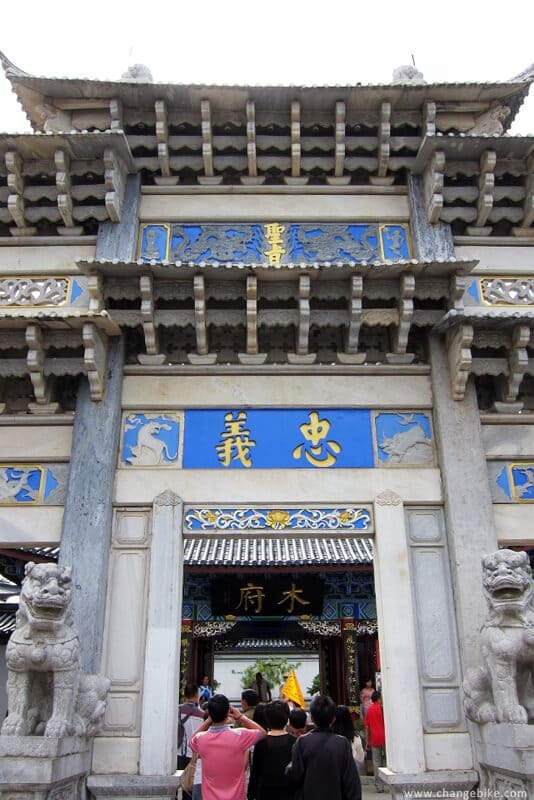 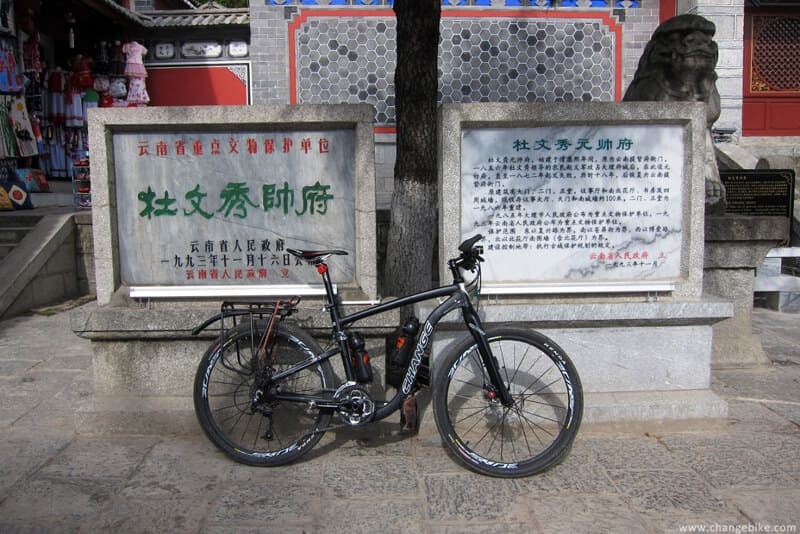 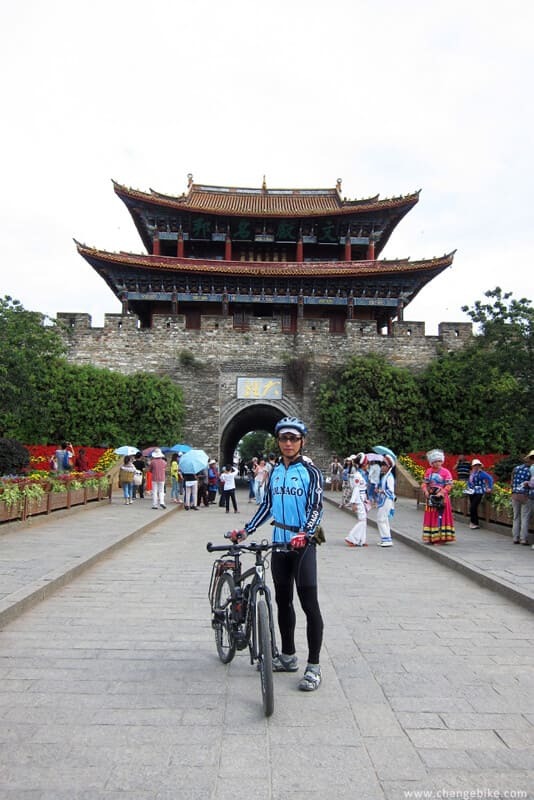 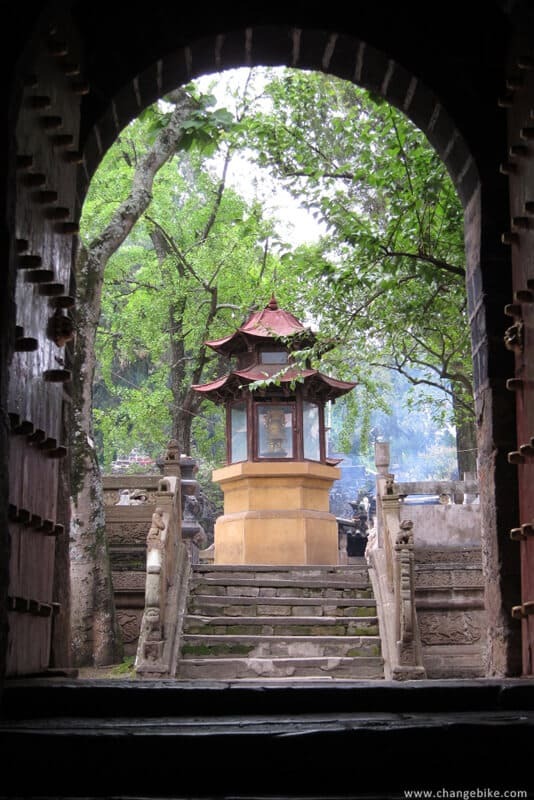 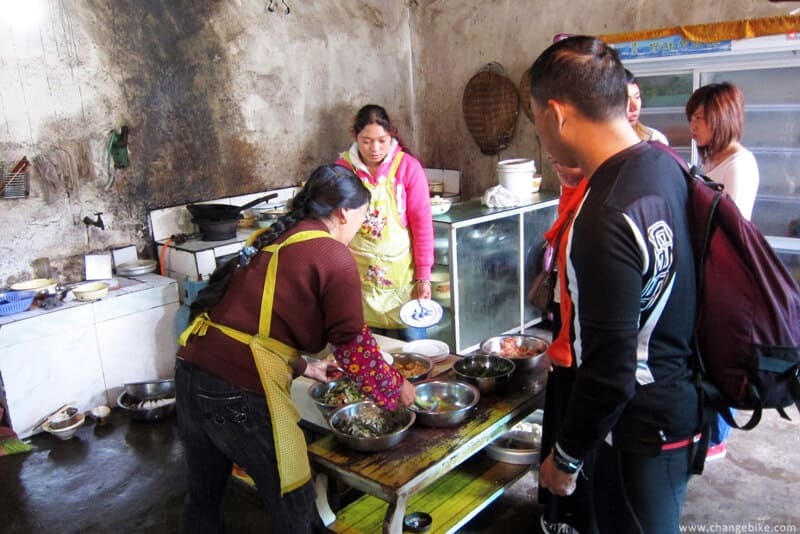 We spent over four hours cycling around three ancient towns, which are Shuhe, Dayan, and Baisha. 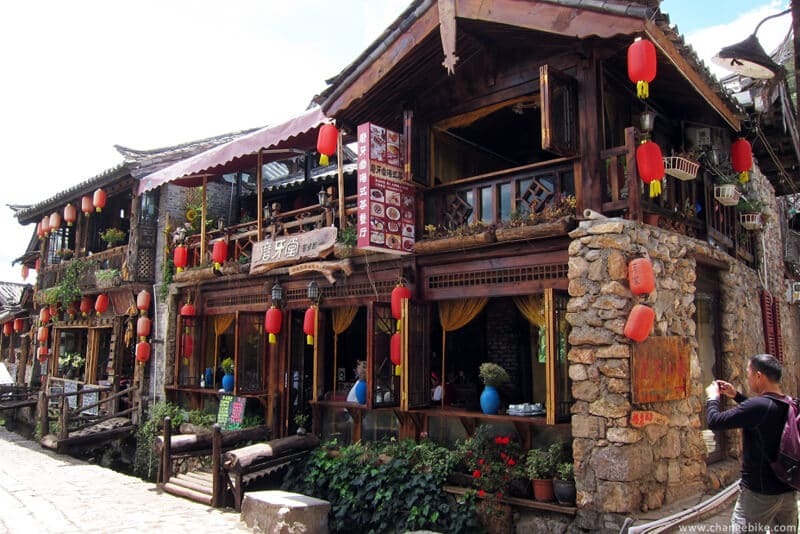 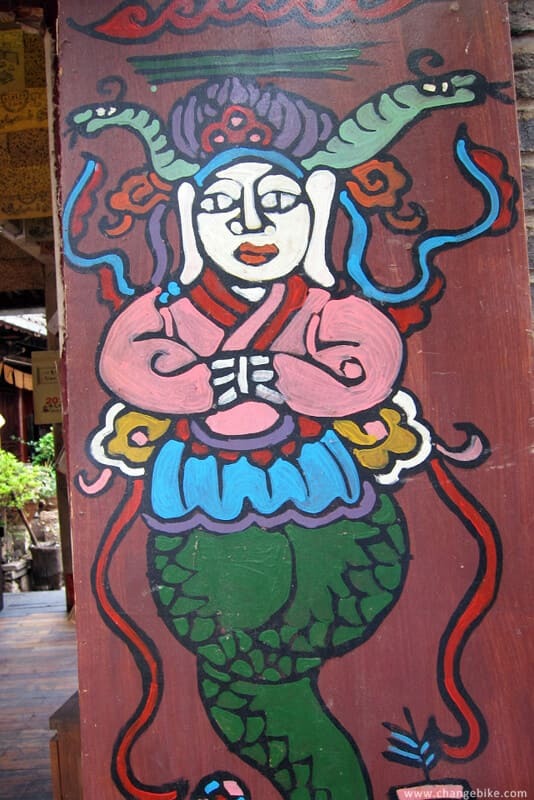 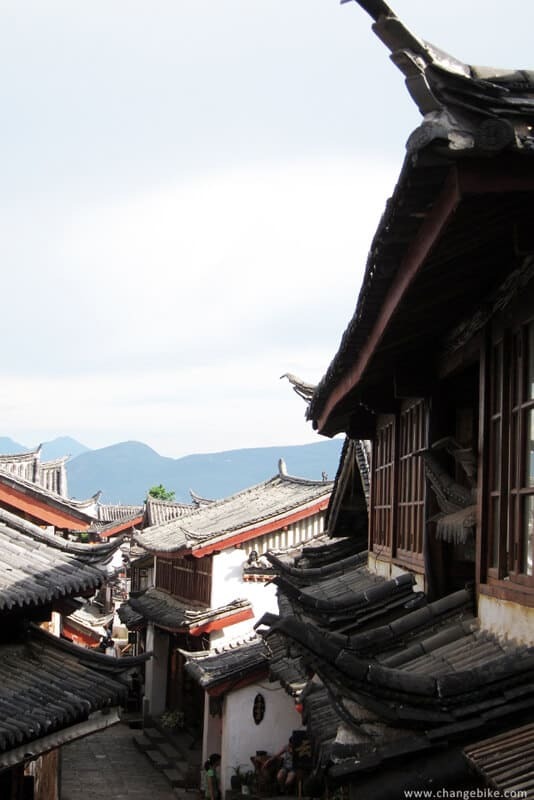 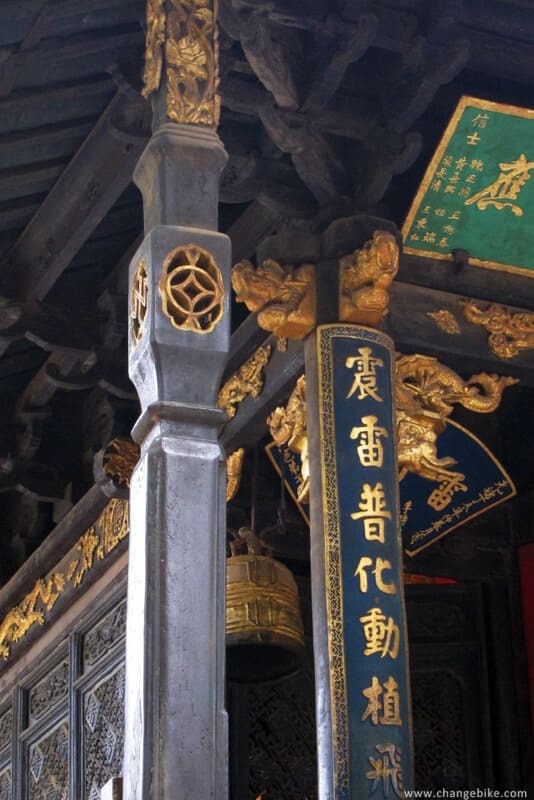 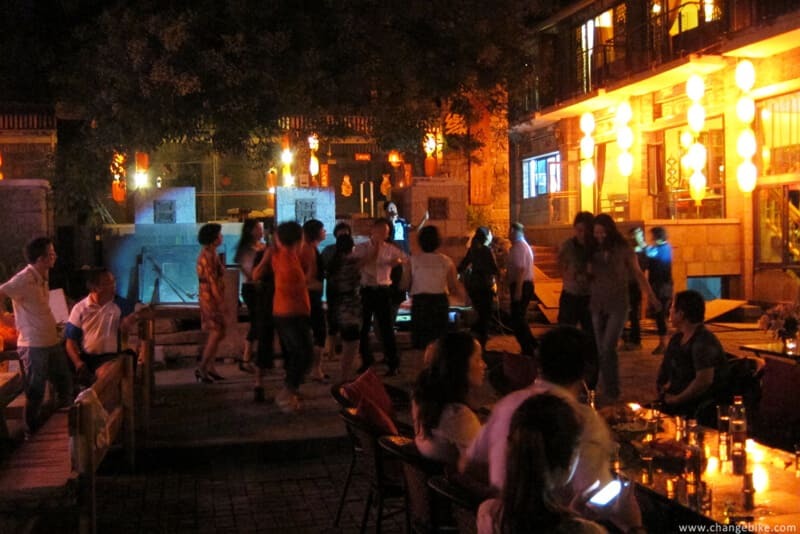 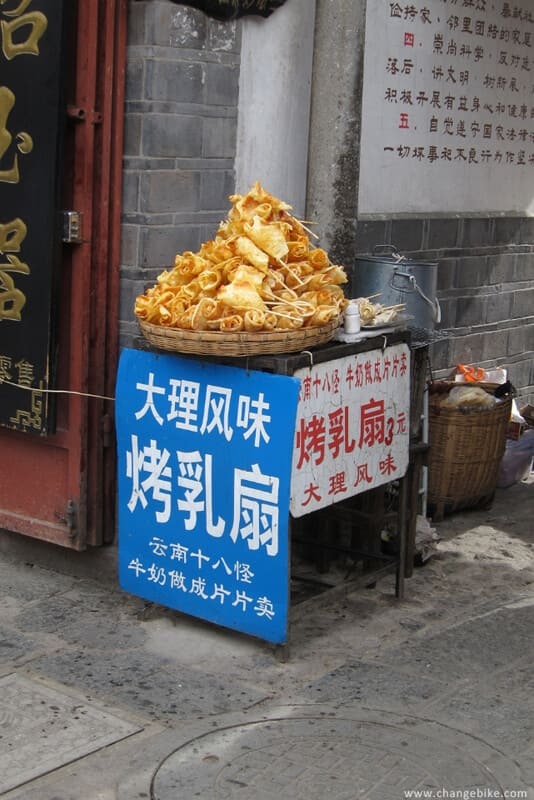 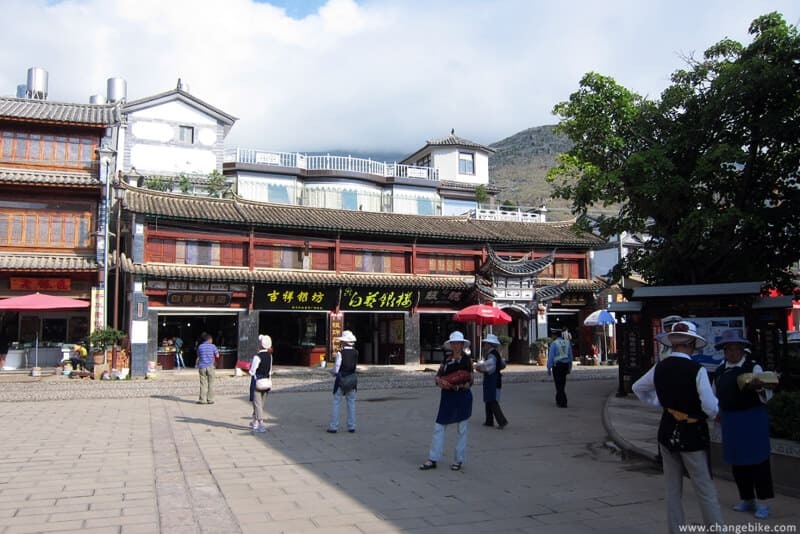 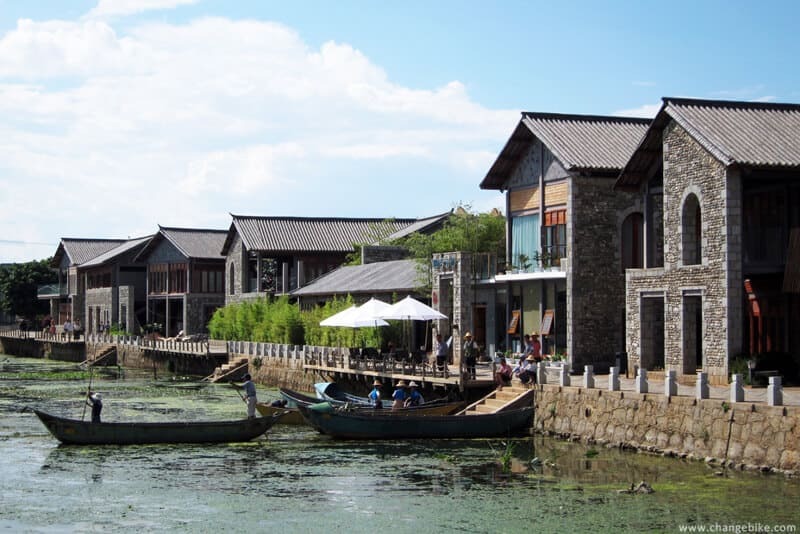 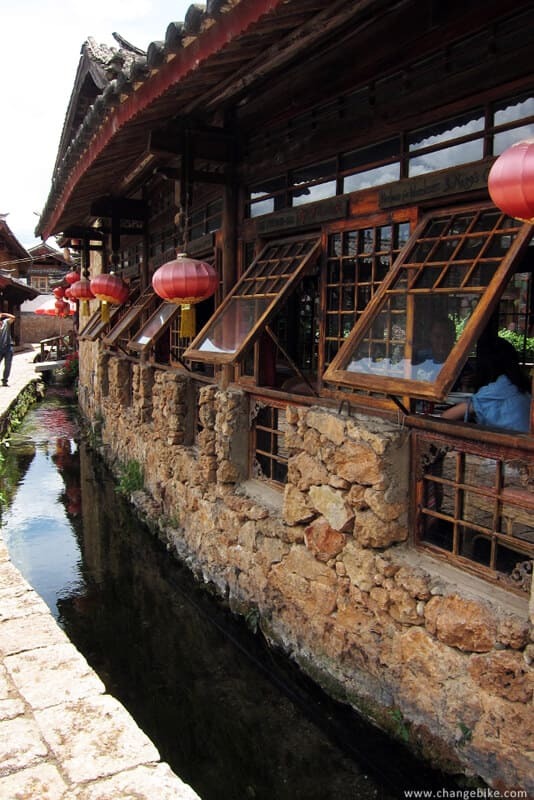 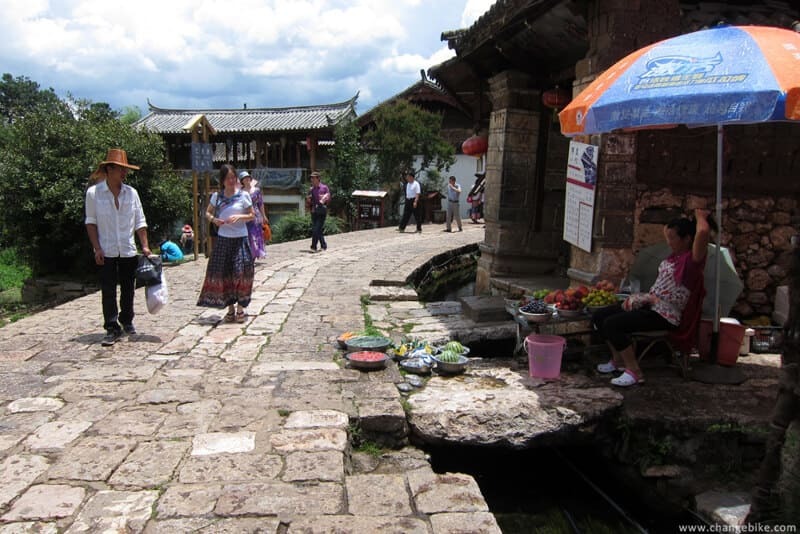 Like most people’s saying, it is excessive commercialization in Lijiang because shops, restaurants, and inns are everywhere. 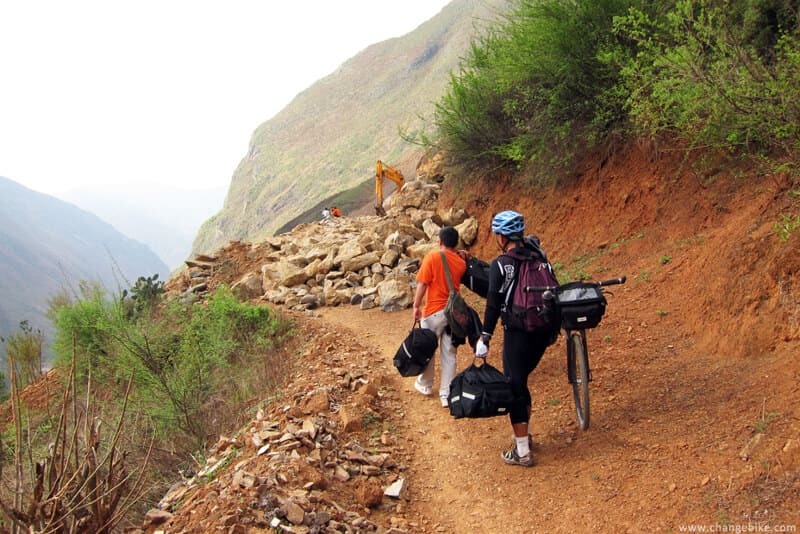 burdens, and the pressure of the destination. 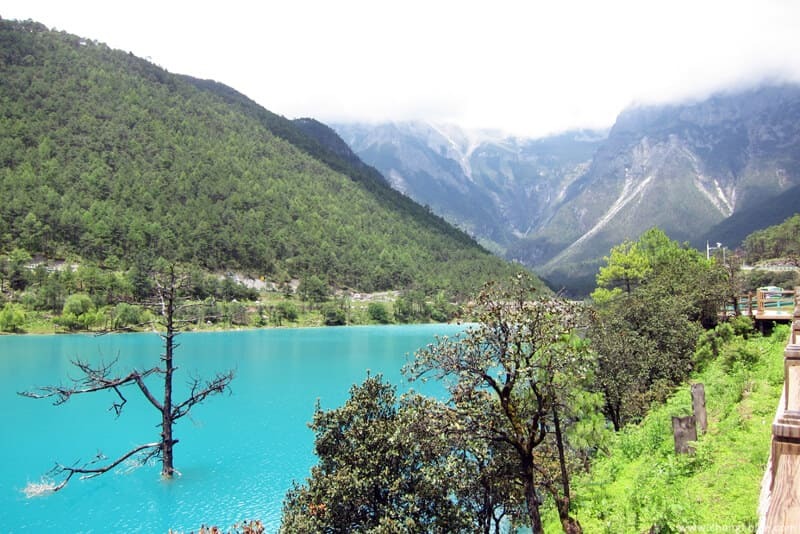 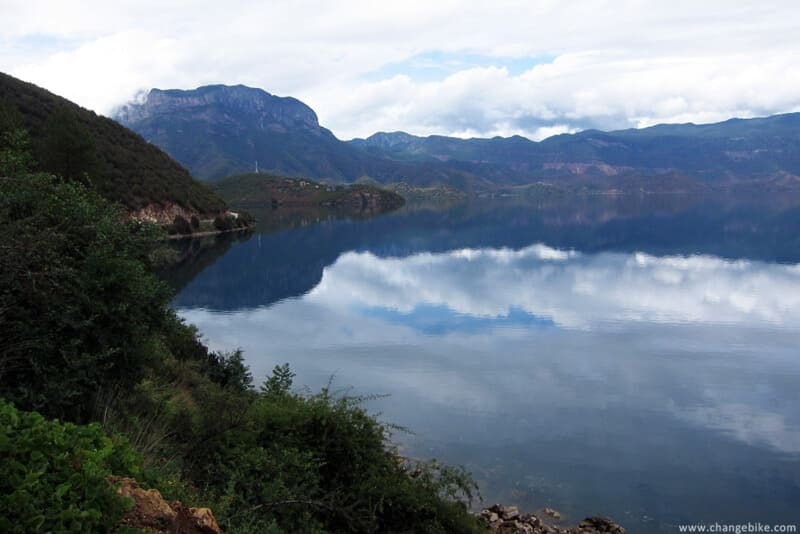 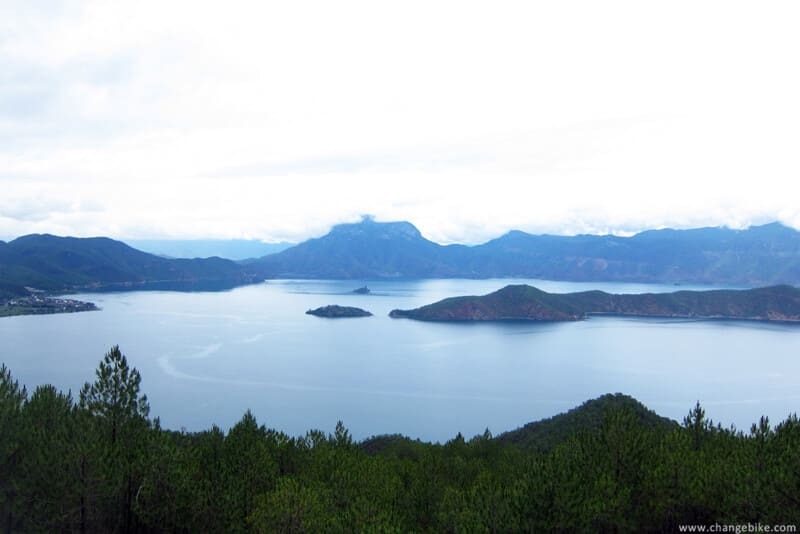 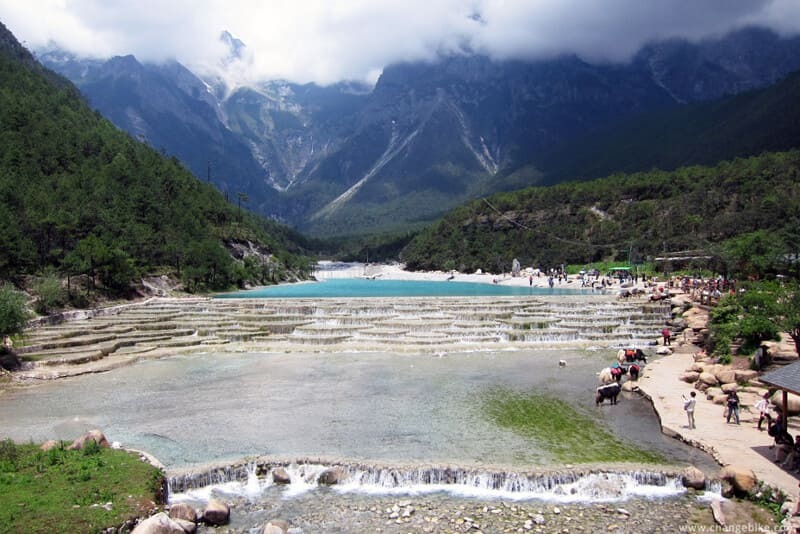 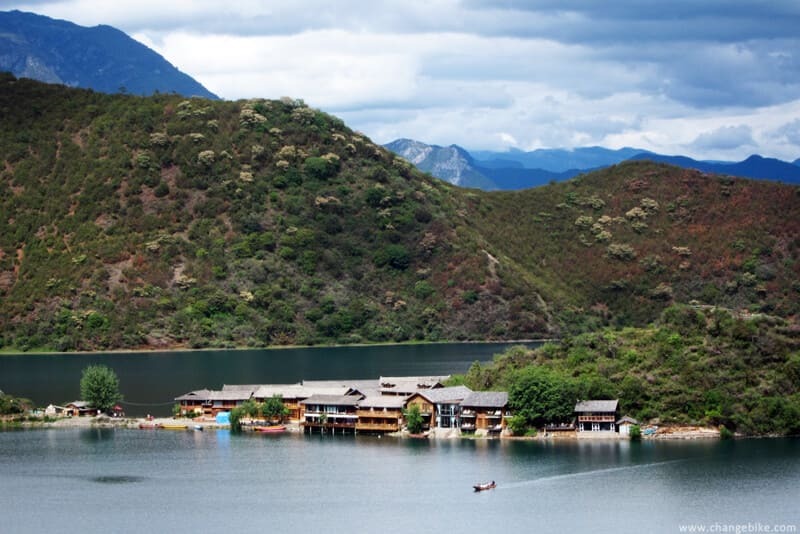 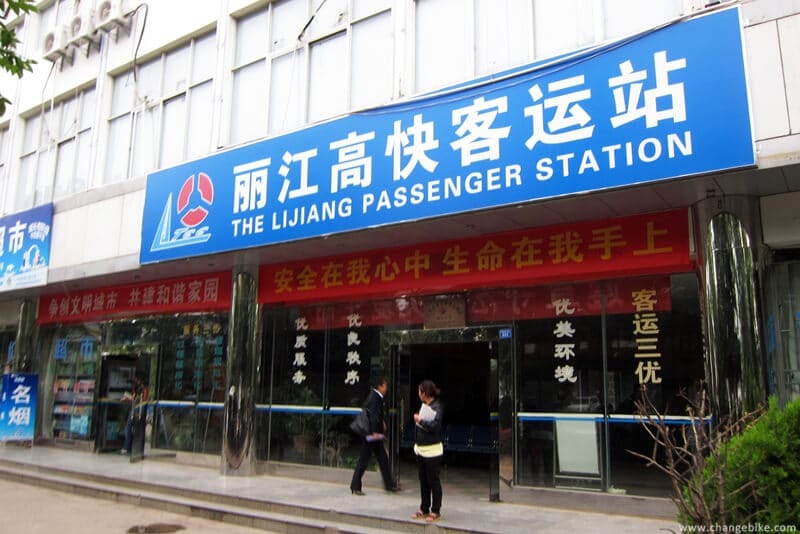 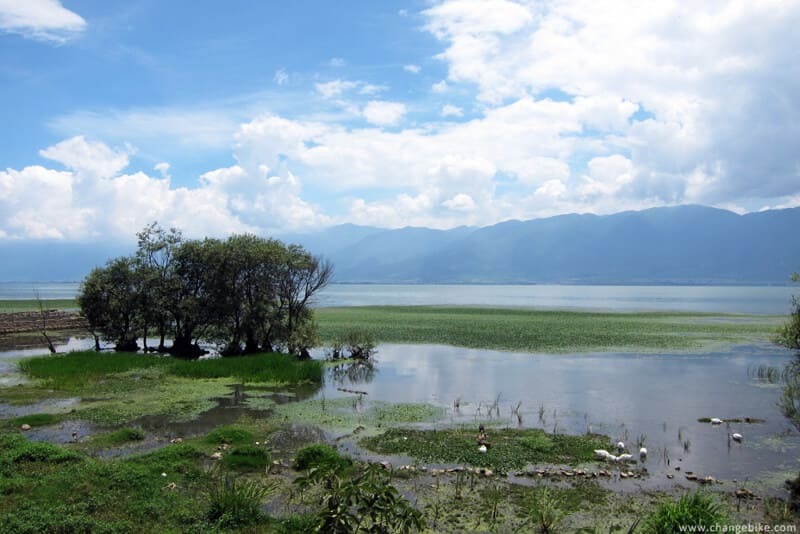 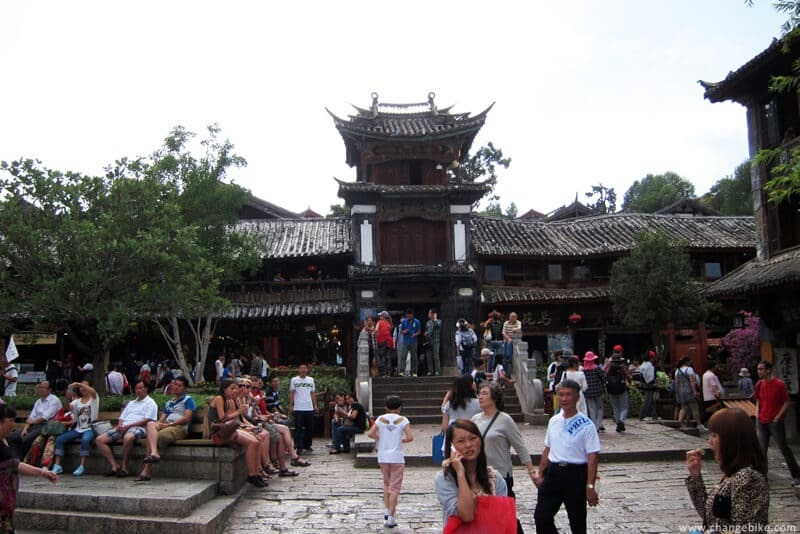 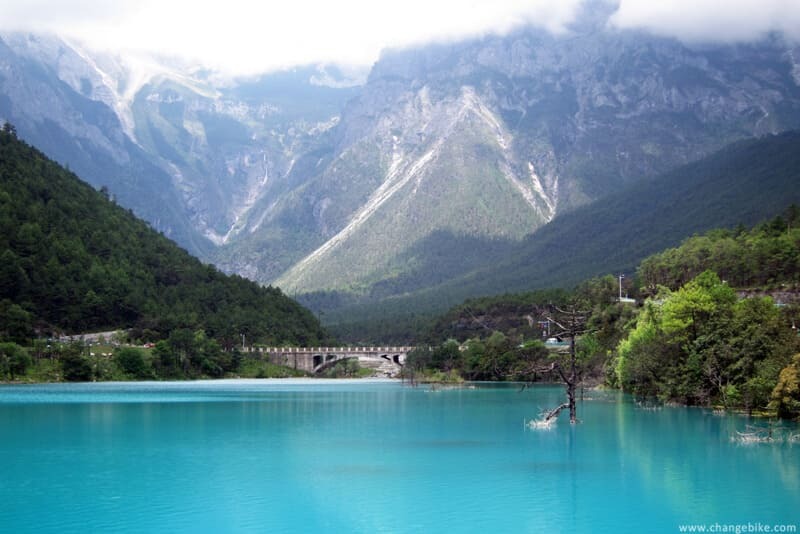 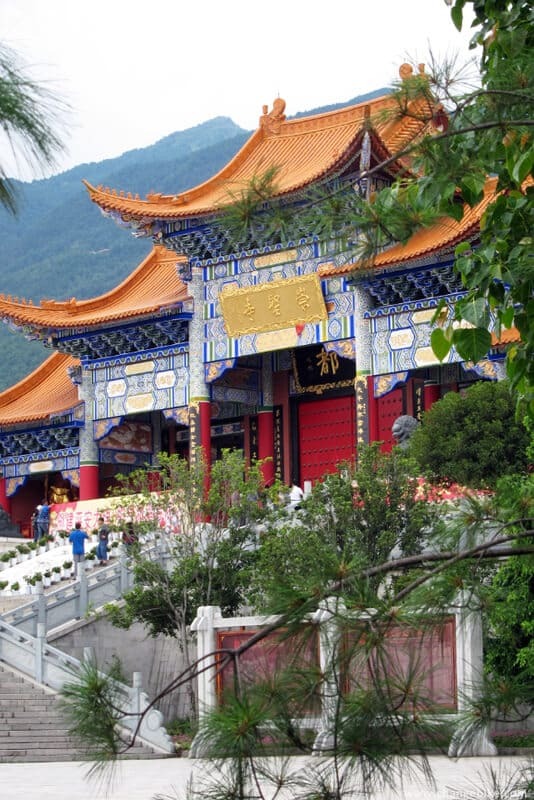 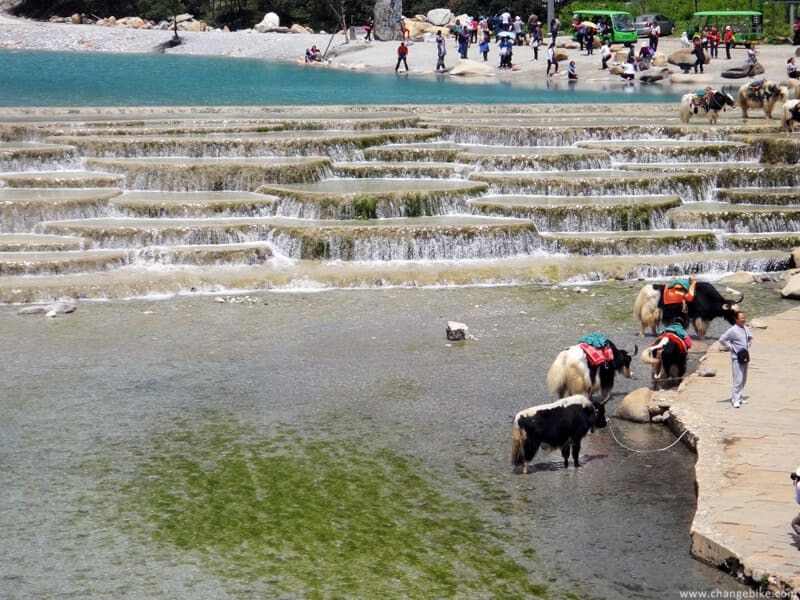 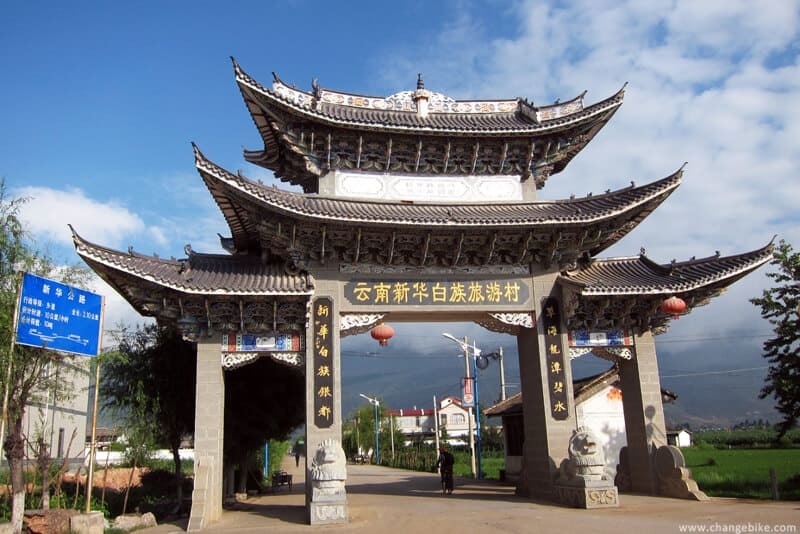 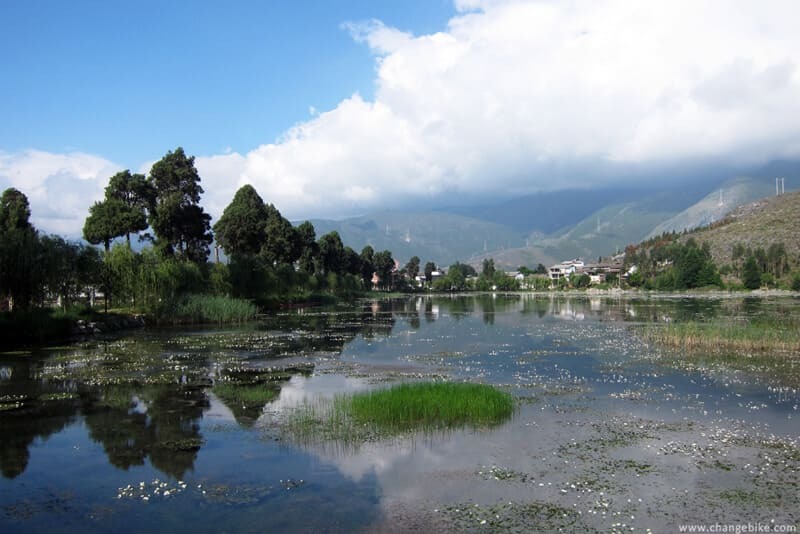 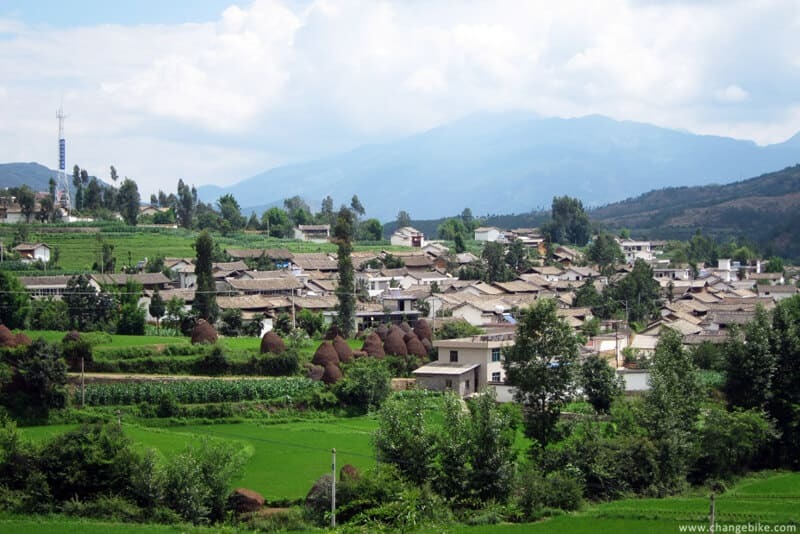 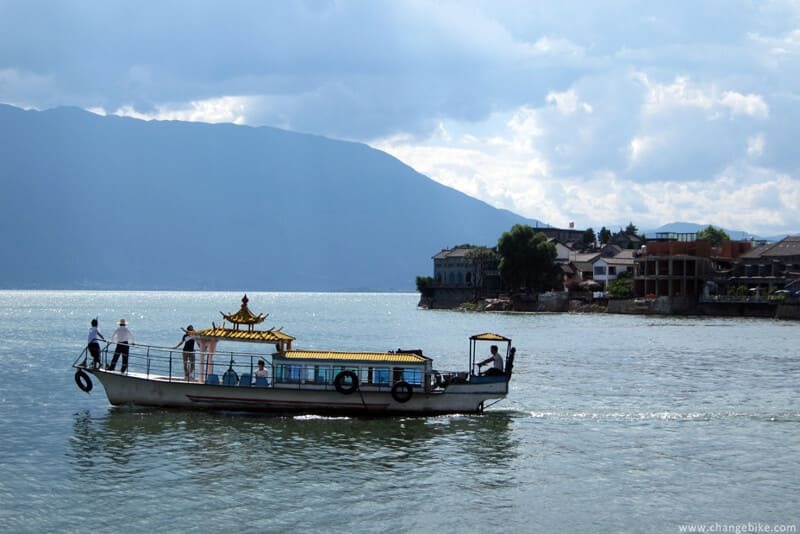 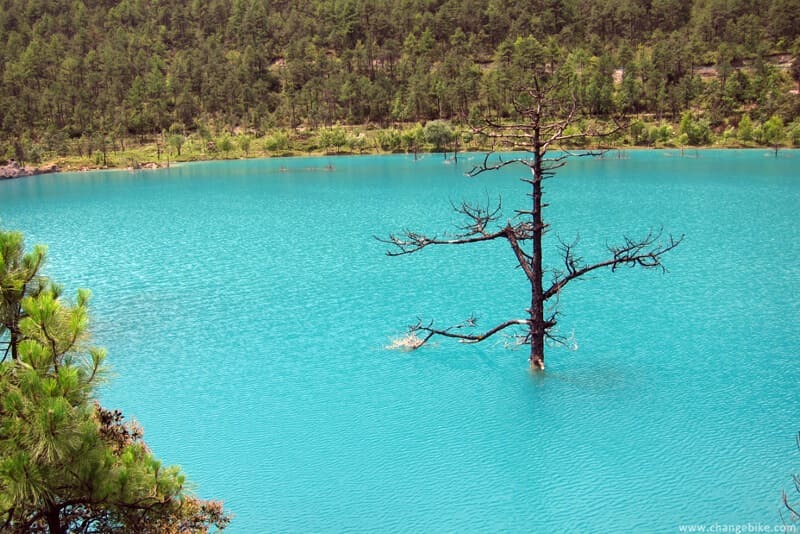 We took a bus at Lijiang High-speed Bus Station at 8:30 am and the destination was Lugu Lake. 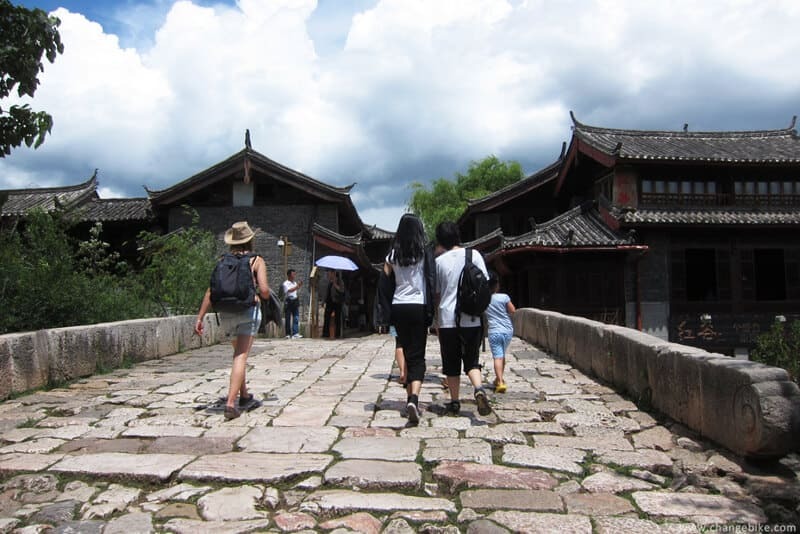 Each of us was charged an extra freightage of RMB70. 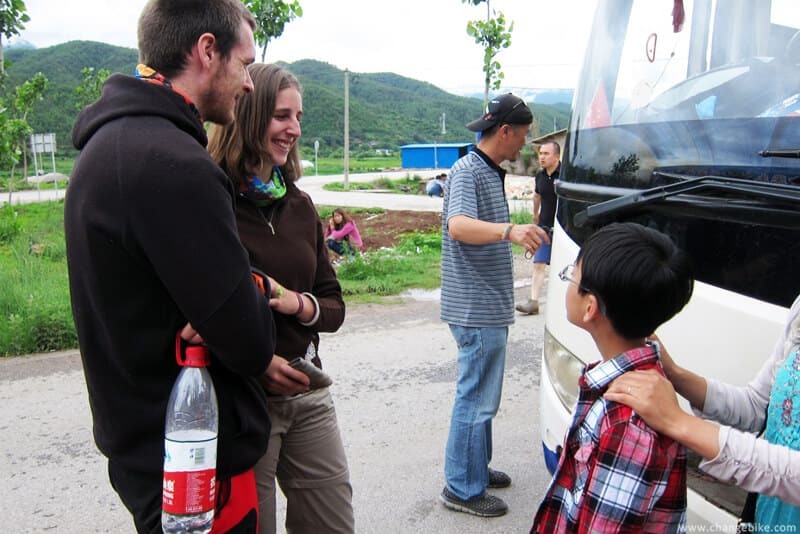 We ran into a couple from France, and they planned to travel in China for two months. 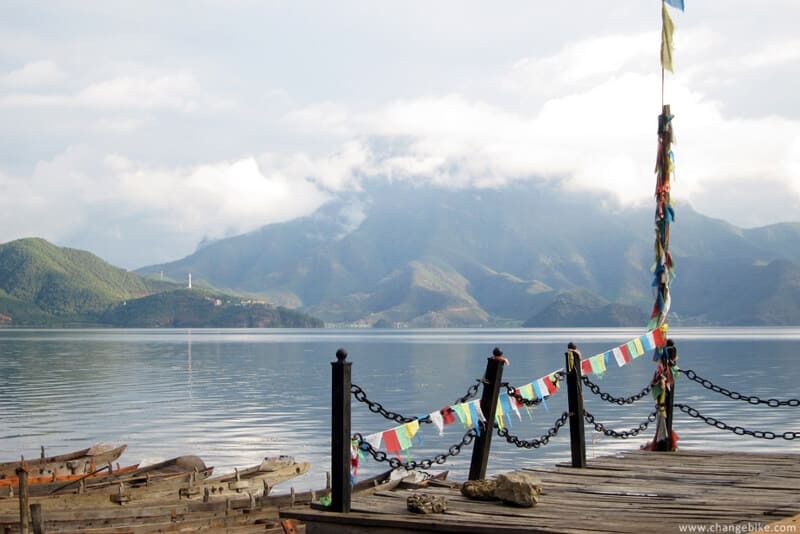 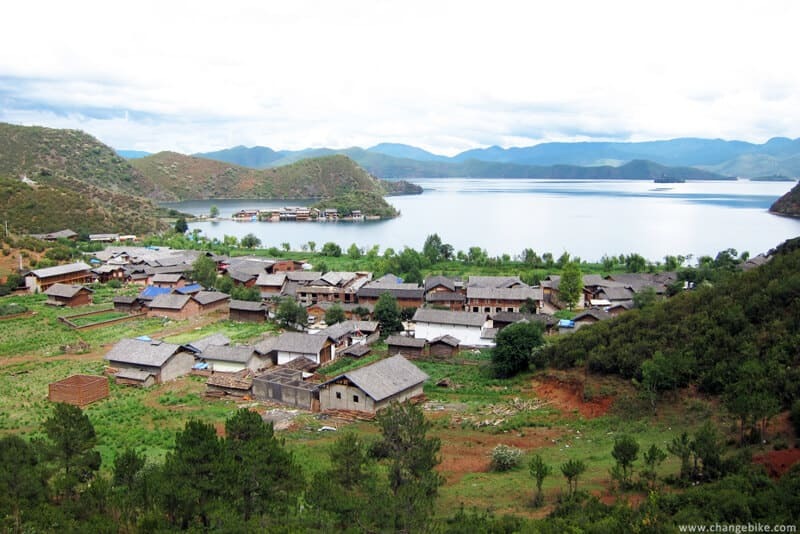 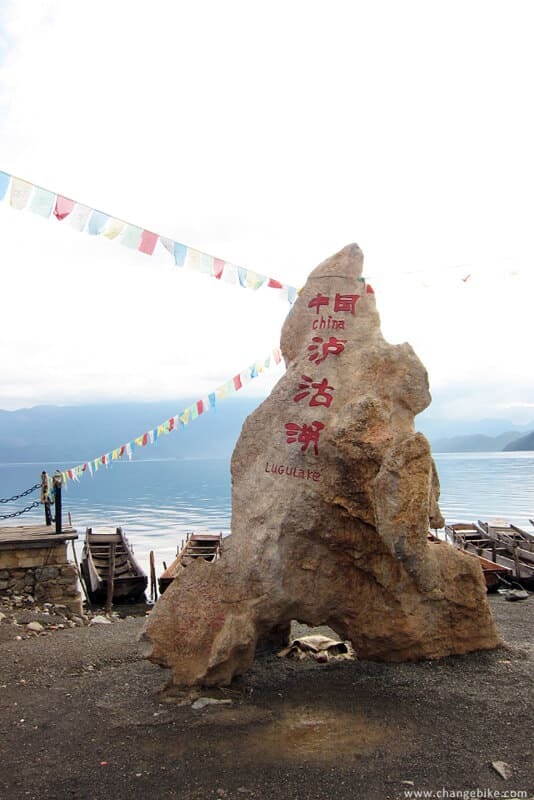 We arrived in Lugu Lake at 2:45 pm, and my first impression (looked down) was that it was so wide like a wonderland! 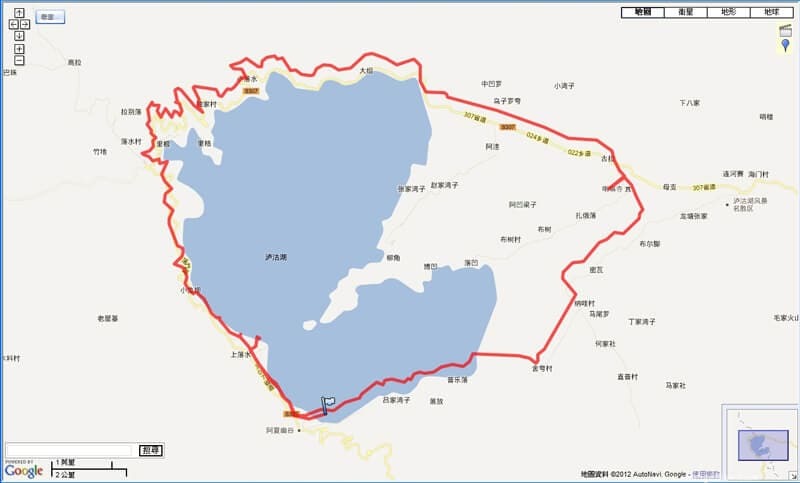 The route map for going around the lake. 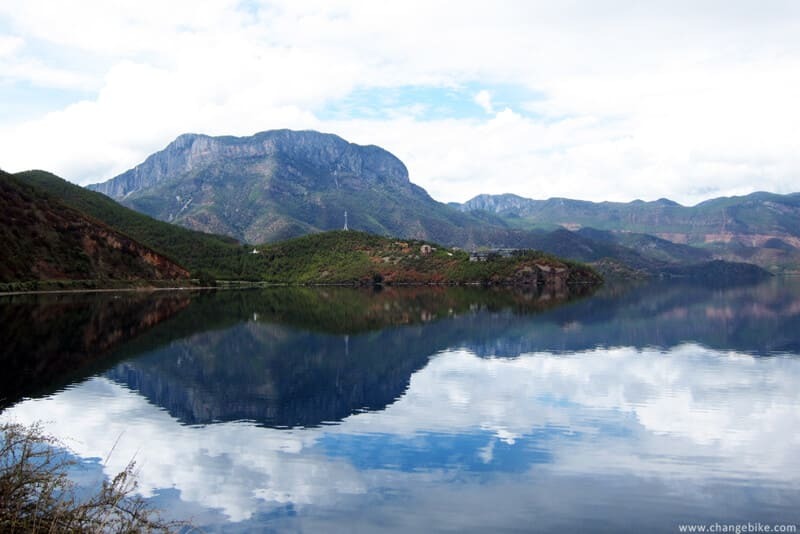 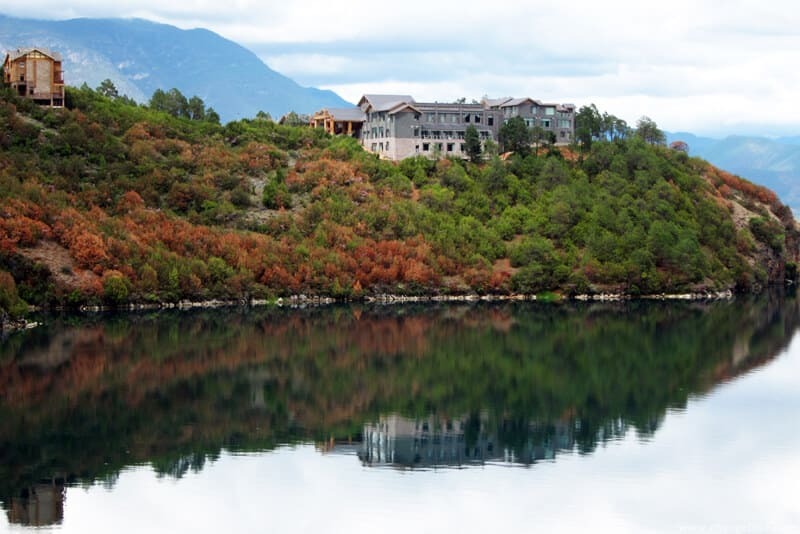 The rippling water was on the lake, and reflection from mountains and clouds was like an oil painting that I had never seen. 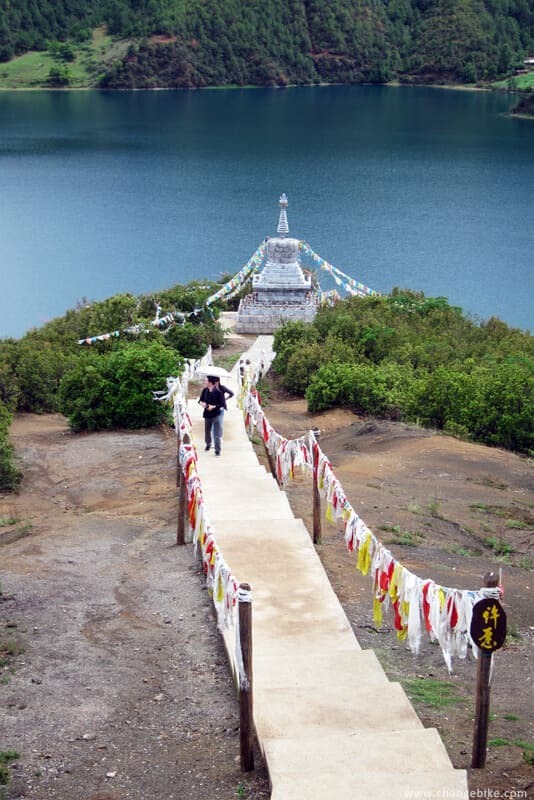 The Holy Mountain seemed to float over a whole sea of clouds, and it was so beautiful. 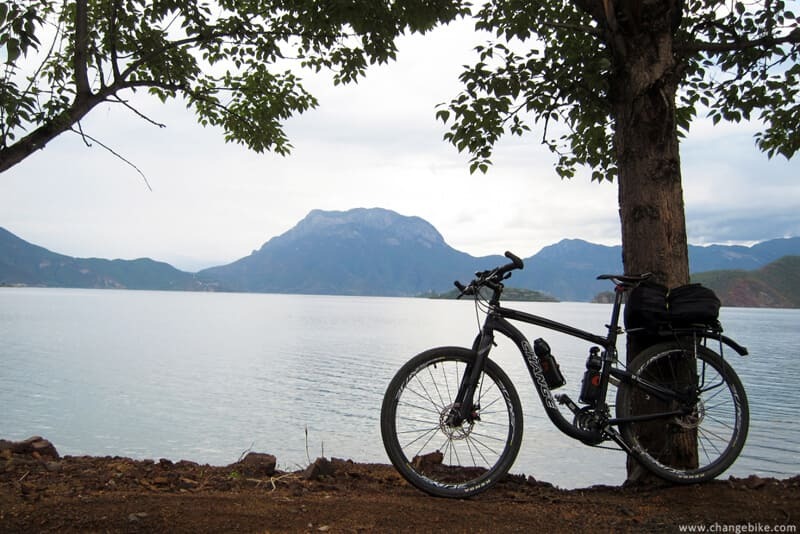 Riding around the lake for a round was 50 km, and we spent 4.5 hours (including taking pictures, the real time of riding was about 3 hours). 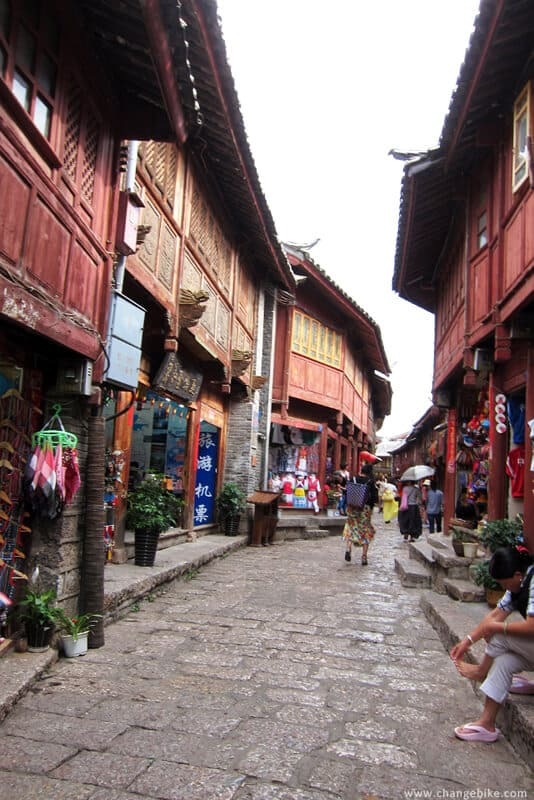 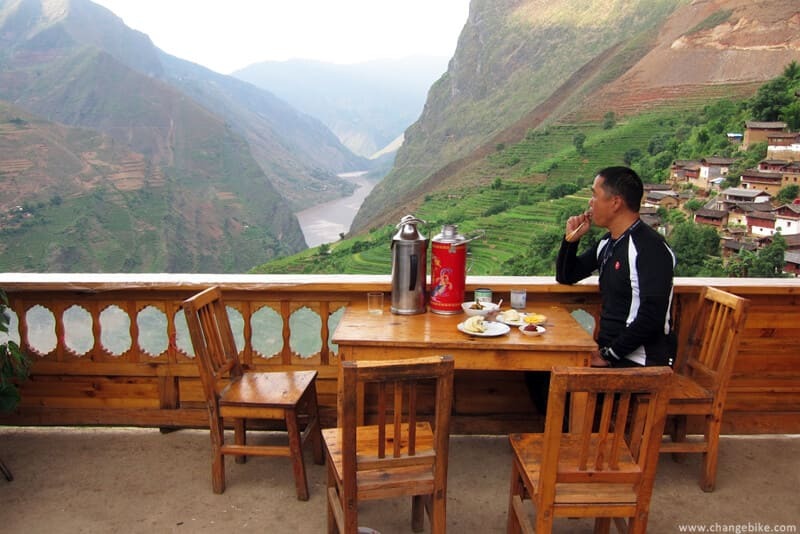 and he said that he traveled to Lijiang by chance. 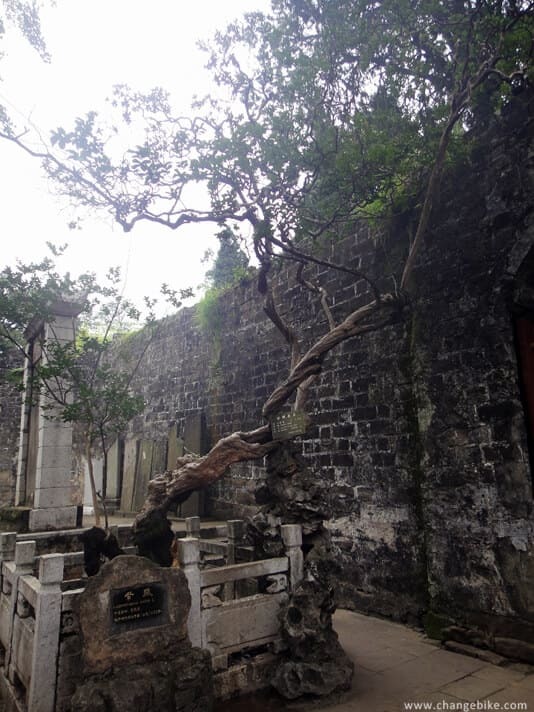 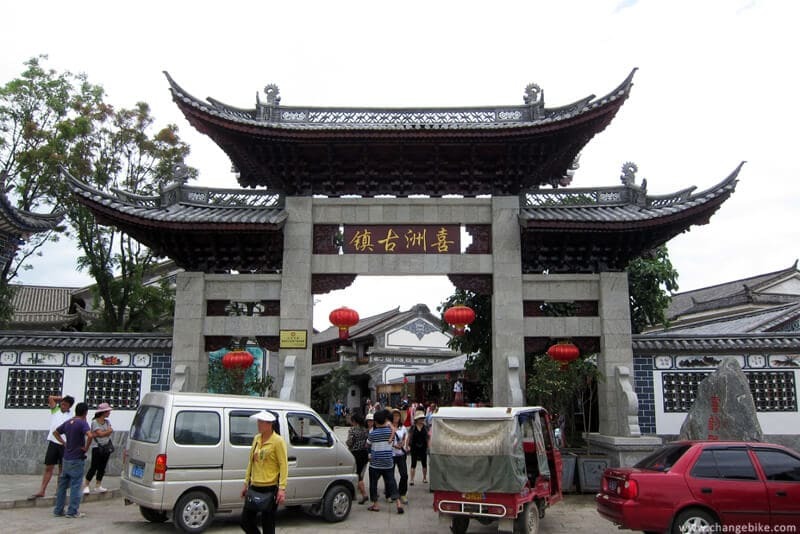 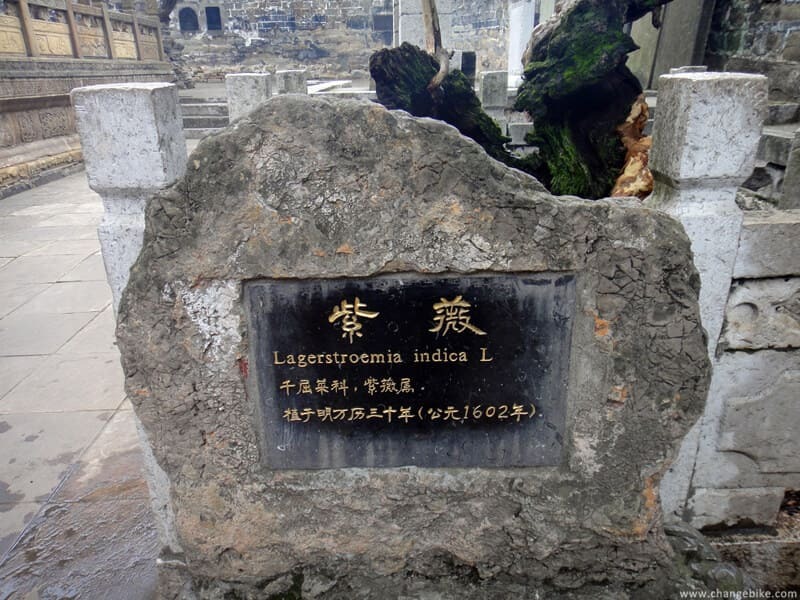 We made an appointment at the south entrance of the ancient town. 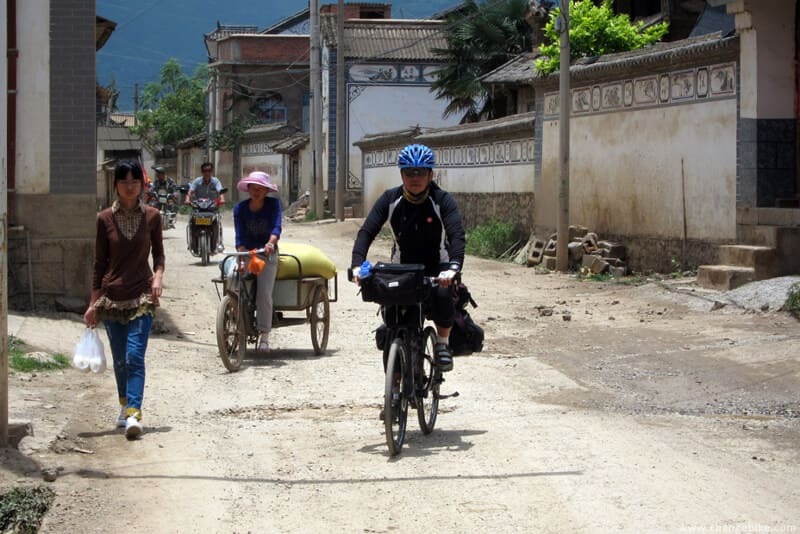 We rode fast from Da Li Road to Dali City in the afternoon, and it rained cats and dogs on the way. 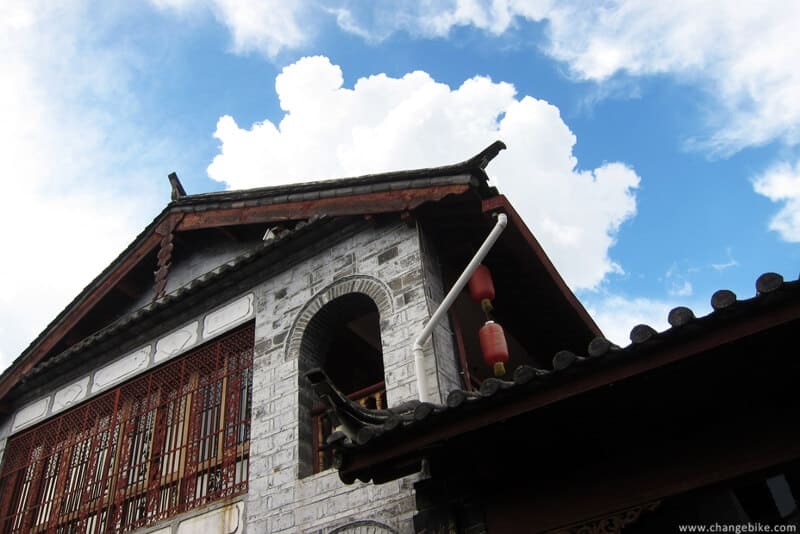 Luckily, it did not rain for a long time. 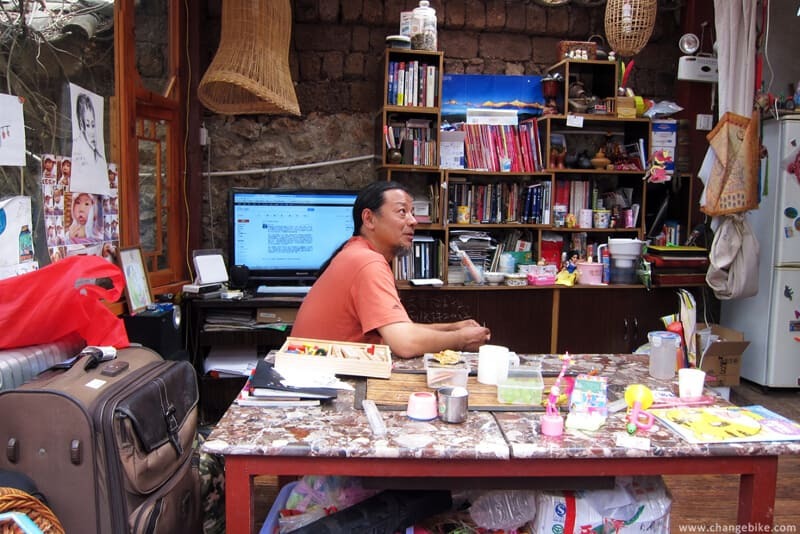 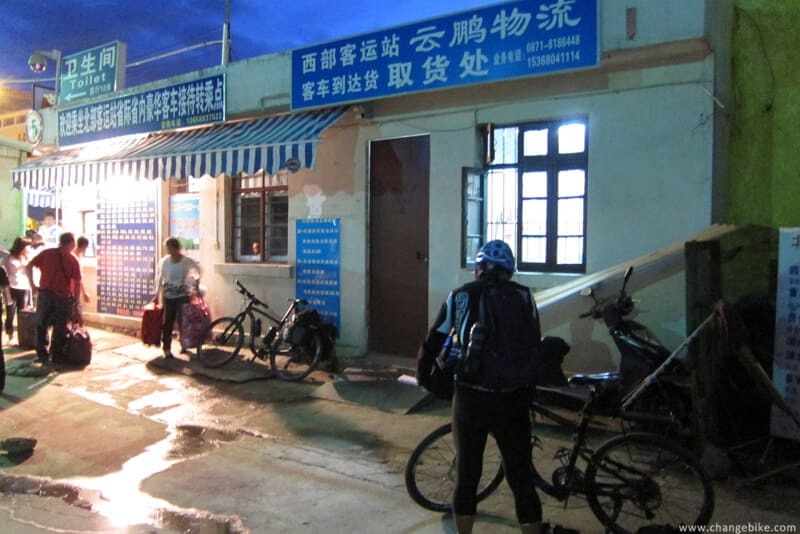 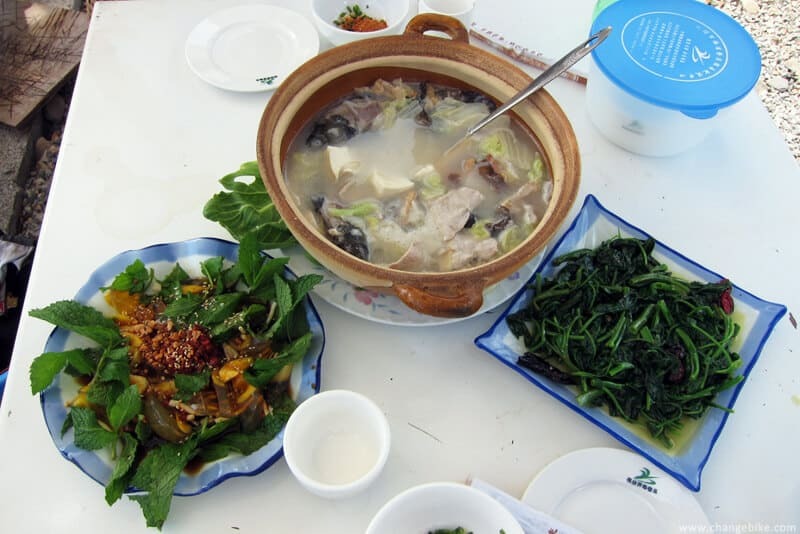 At 8:05 pm, we arrived in Heqin, and stayed the night. 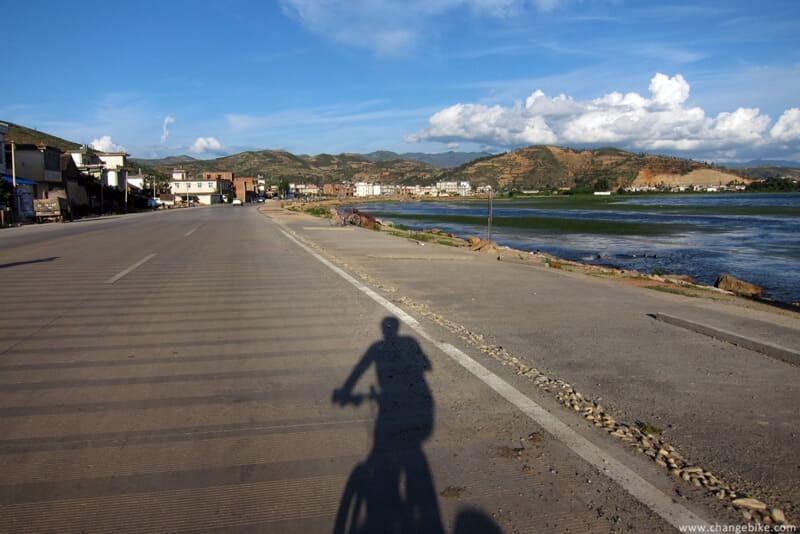 We rode to Xinhua town near Heqin in the morning first, and then rode south along Dali Highway. 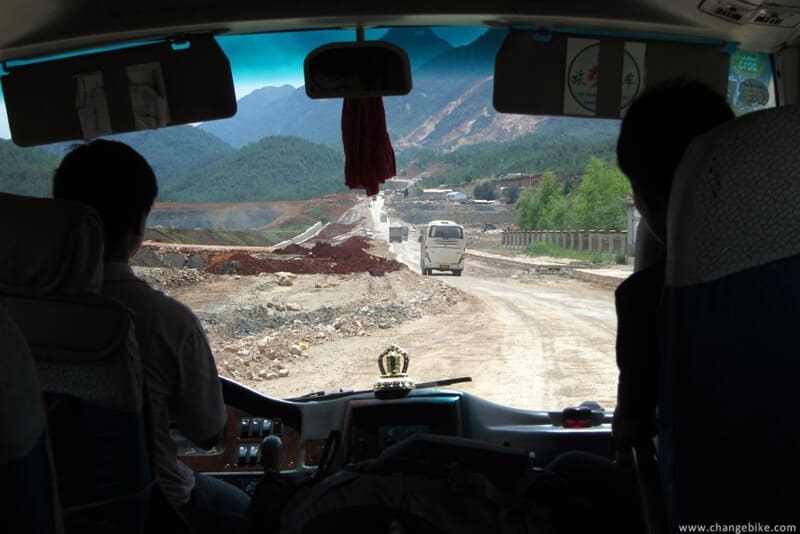 Trucks blew dust, and the sound of horns was uninterrupted along the way. 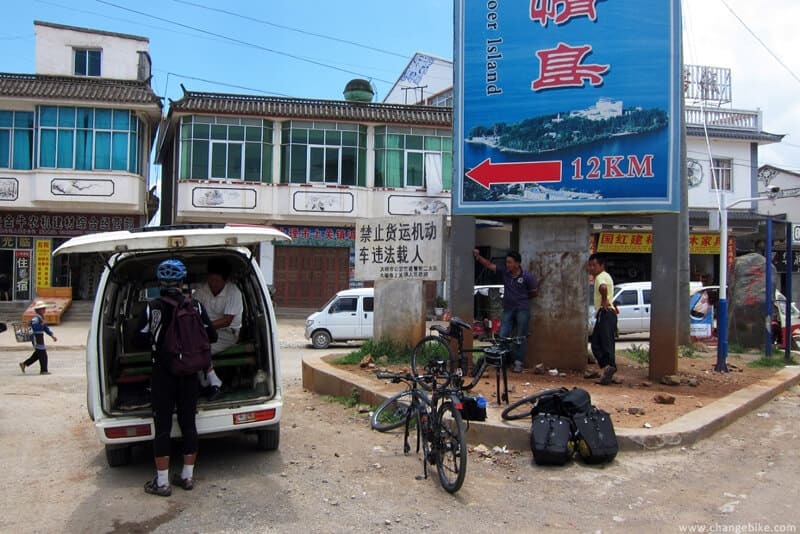 Finally, we decided to charter a bus in Songgui Town to Jiang Wei Township (about 60km, RMB120). 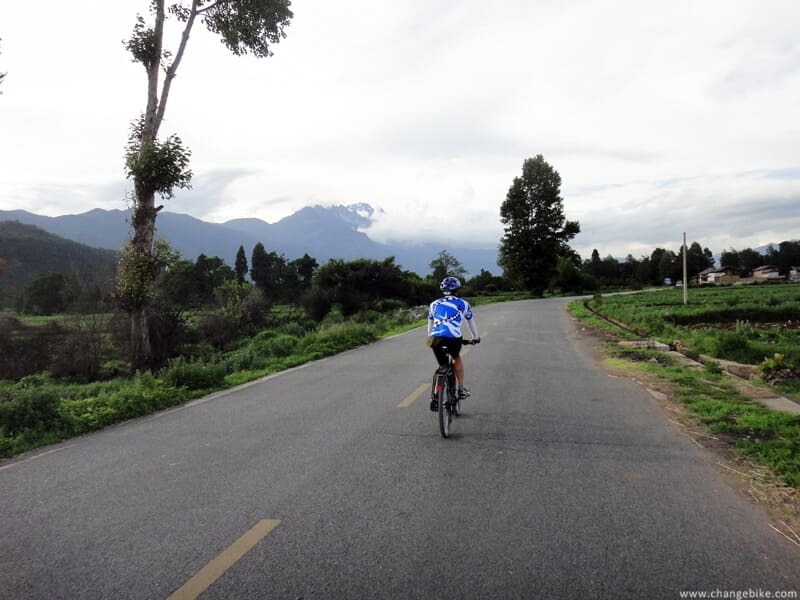 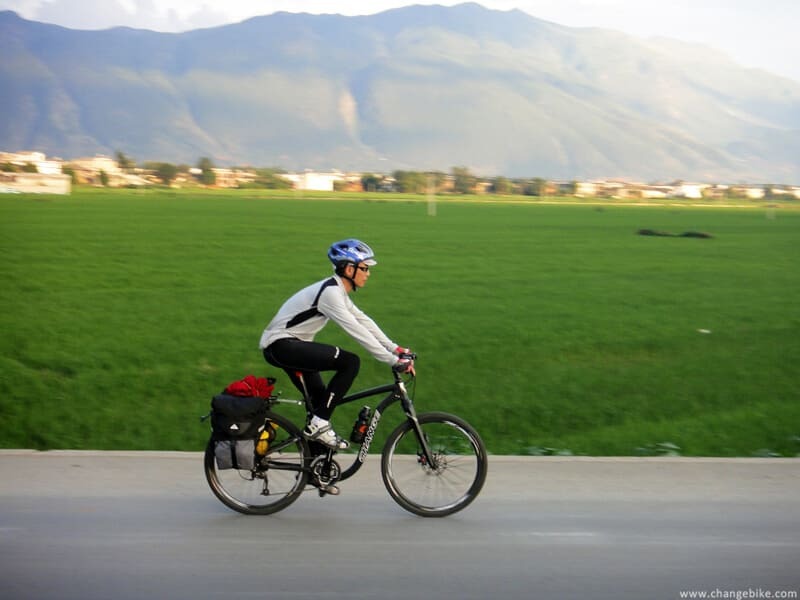 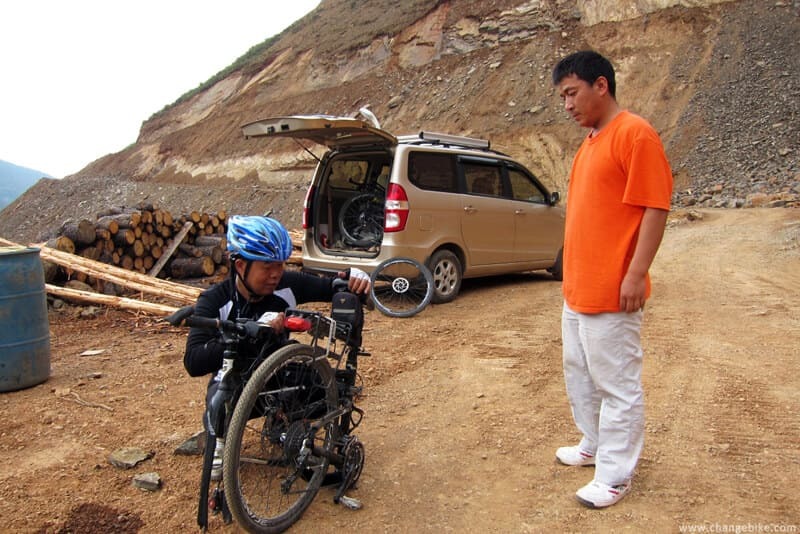 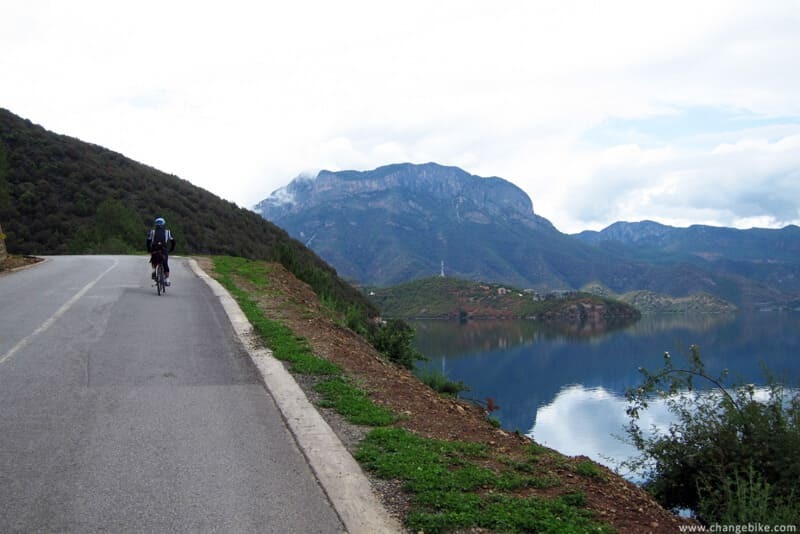 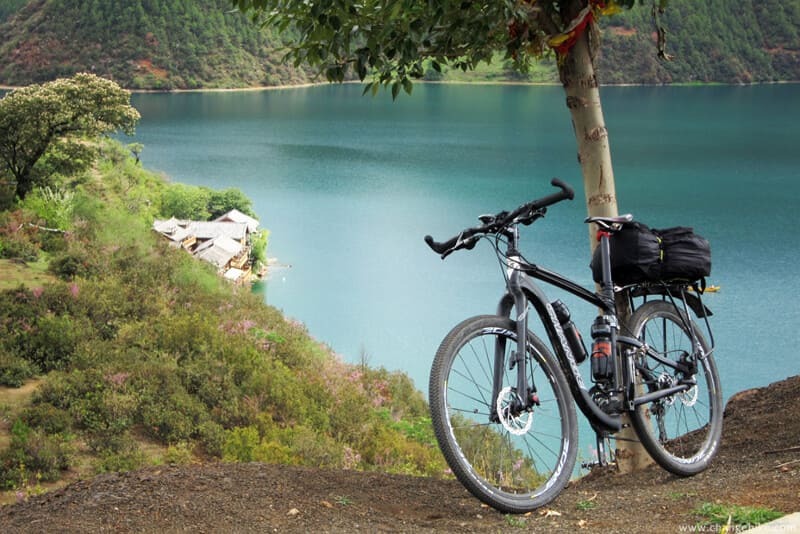 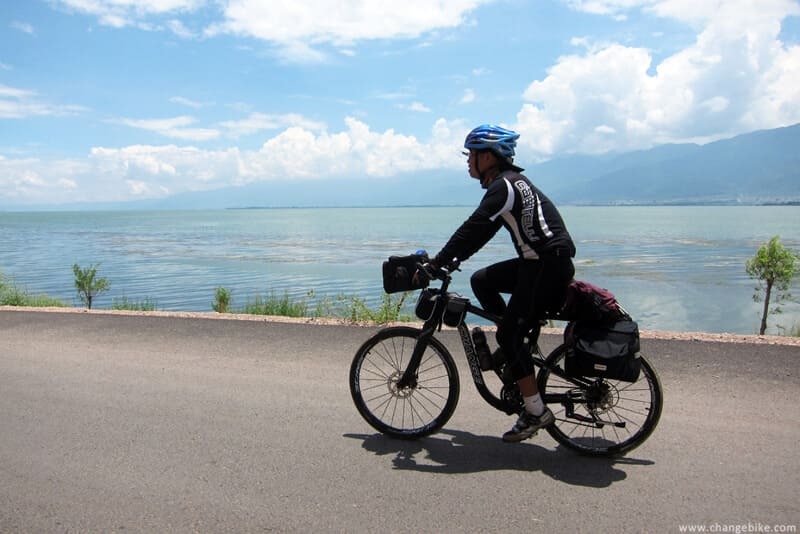 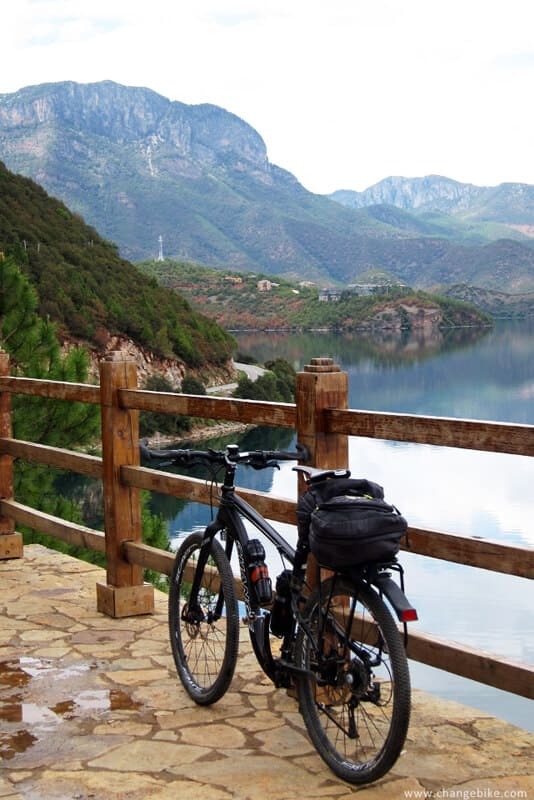 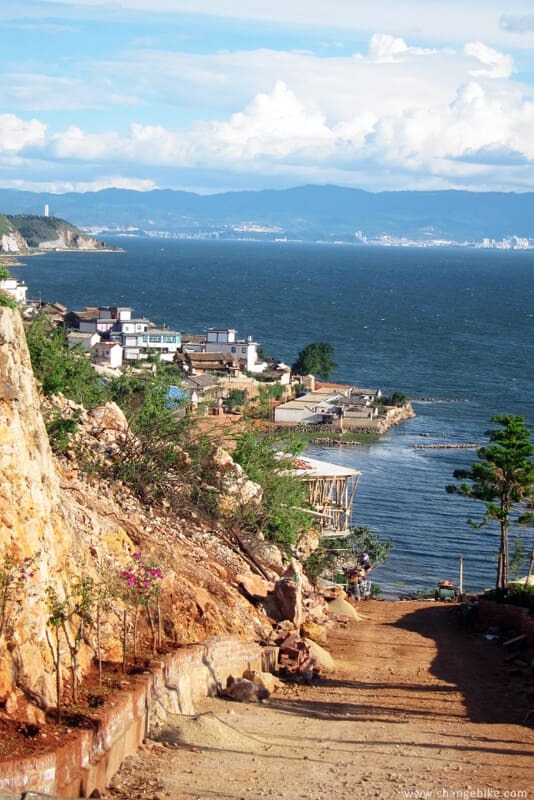 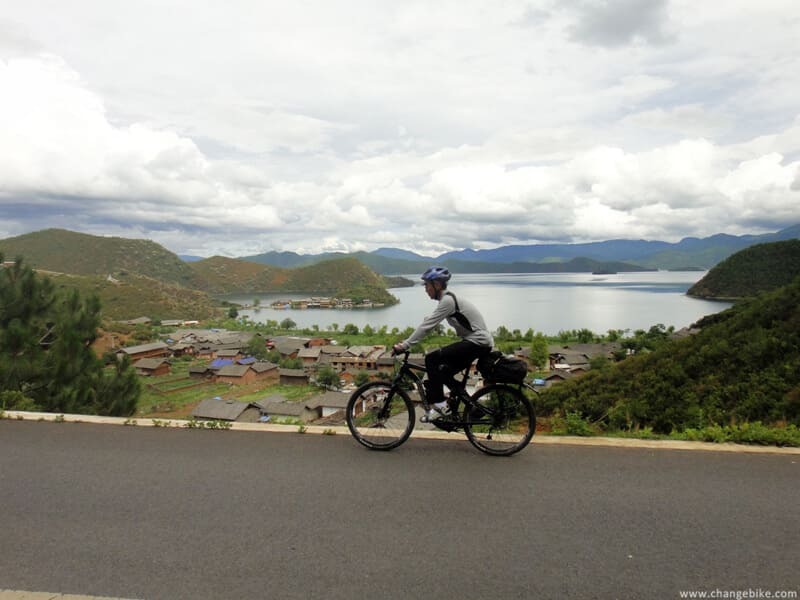 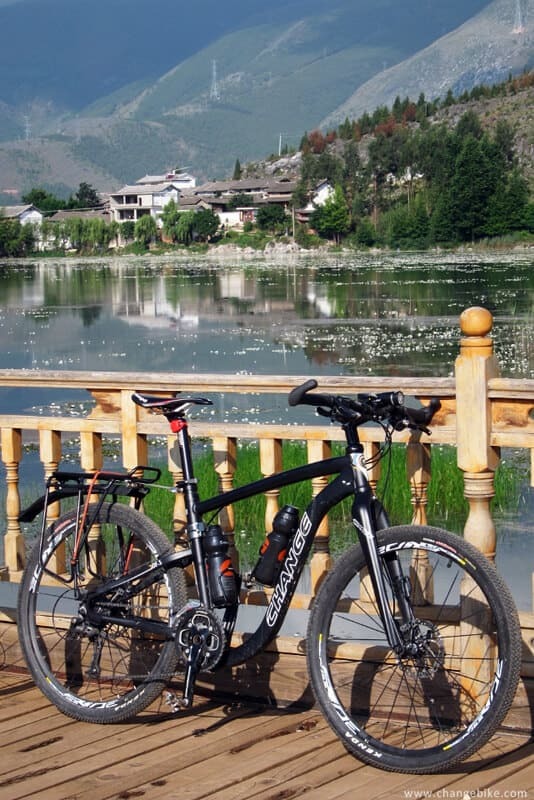 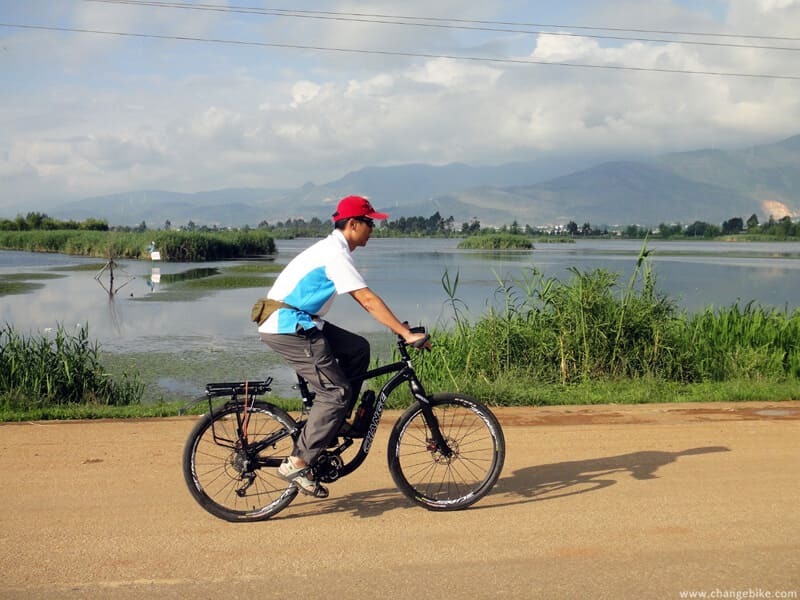 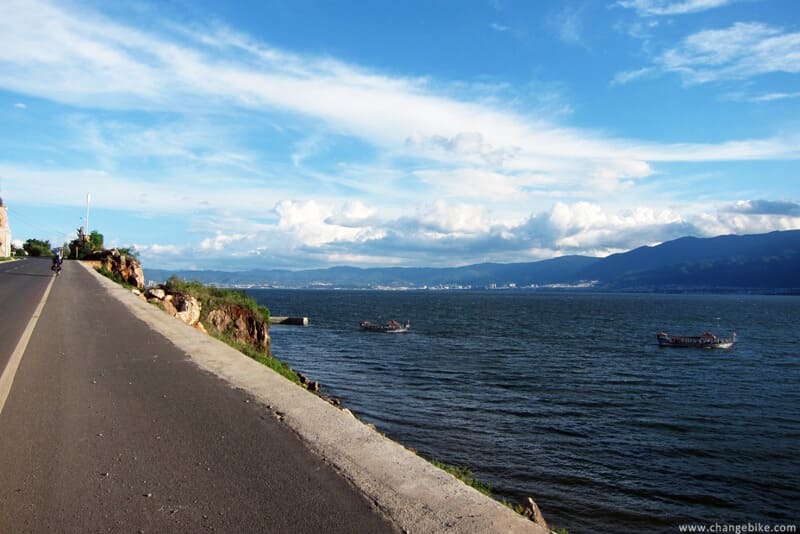 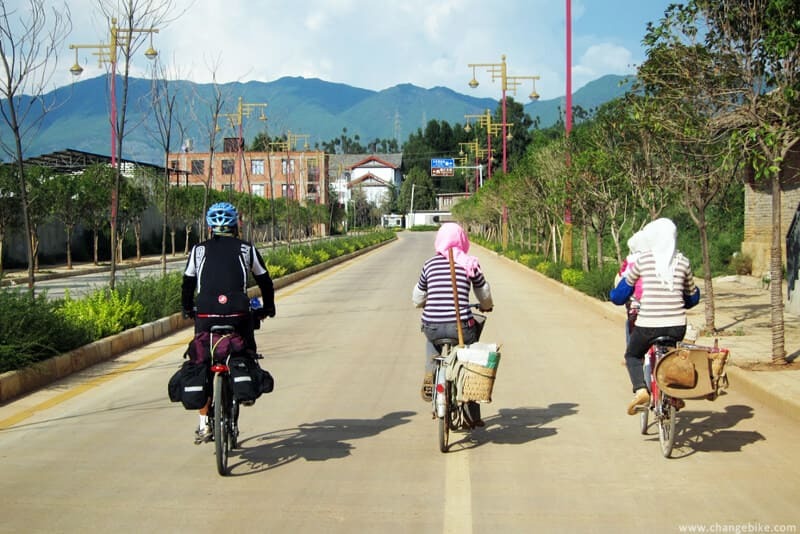 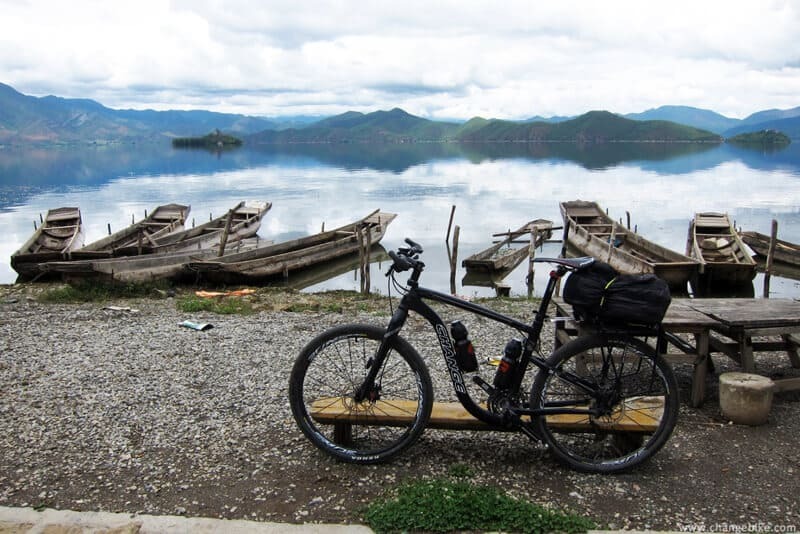 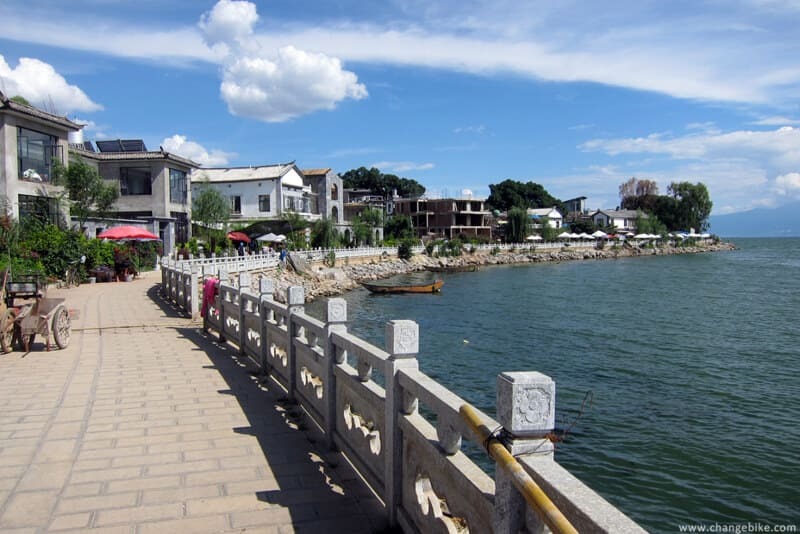 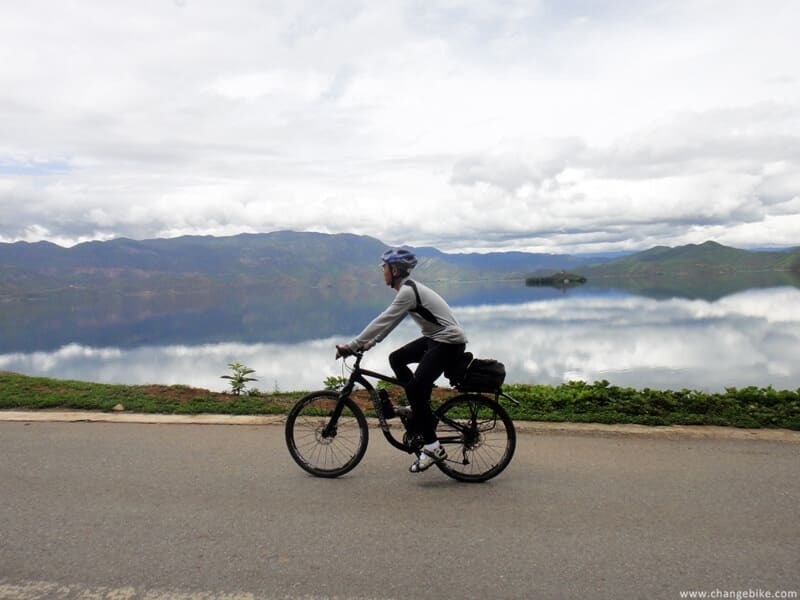 After arriving in Jiang Wei Township, we rode around the lake along Erhai East 1st Road. 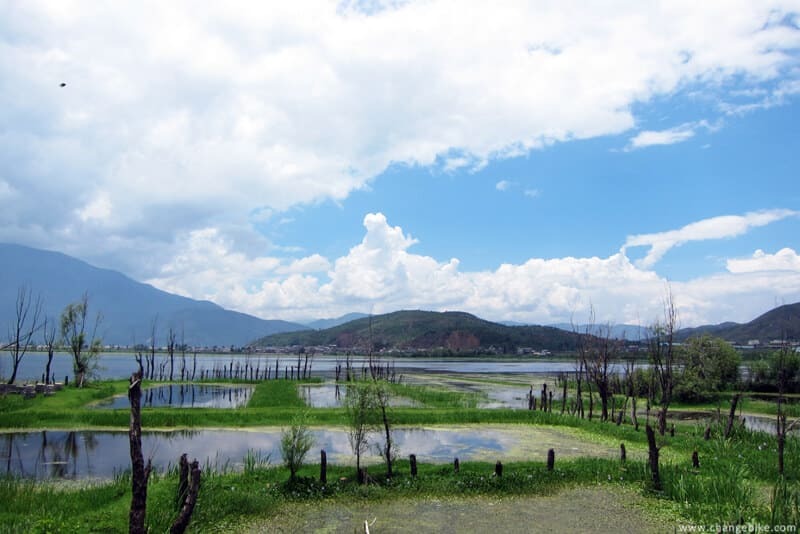 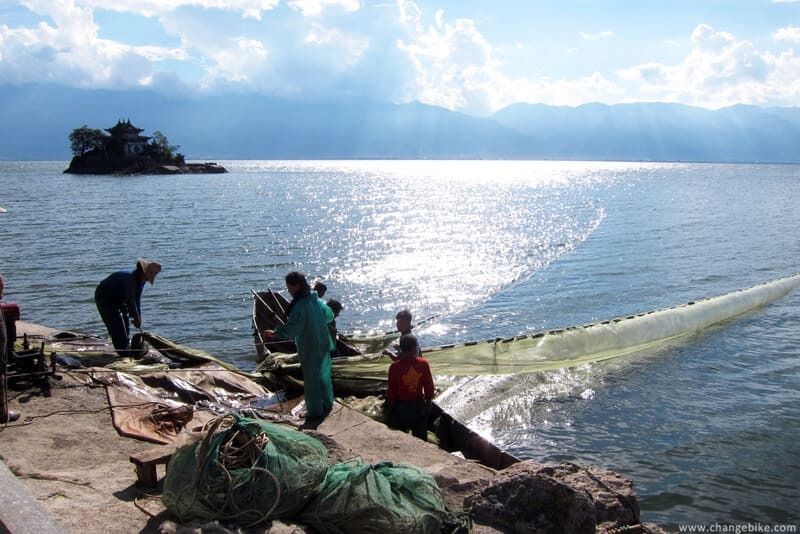 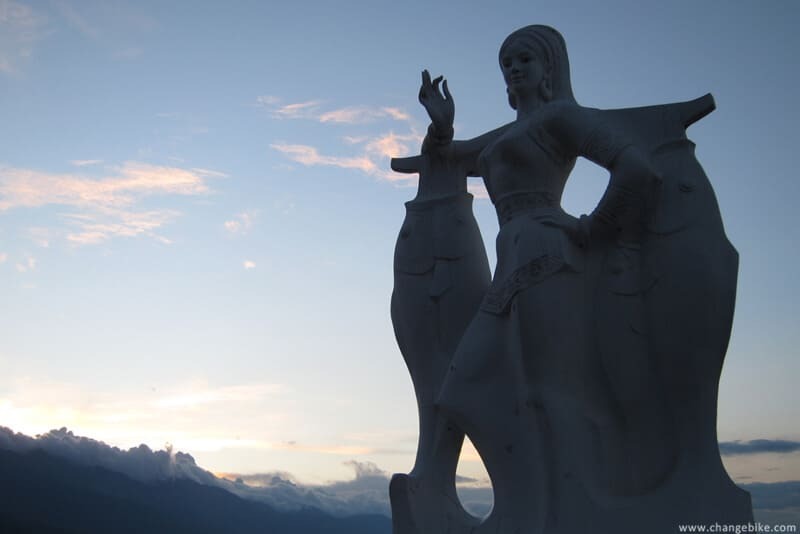 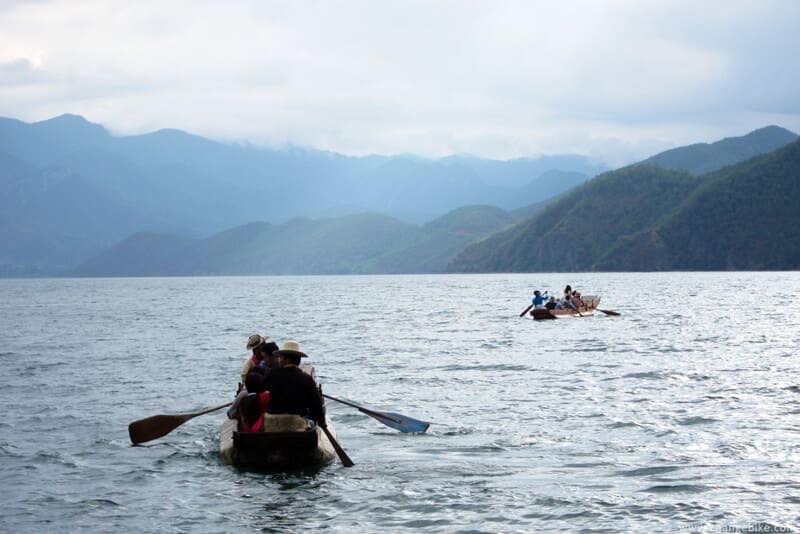 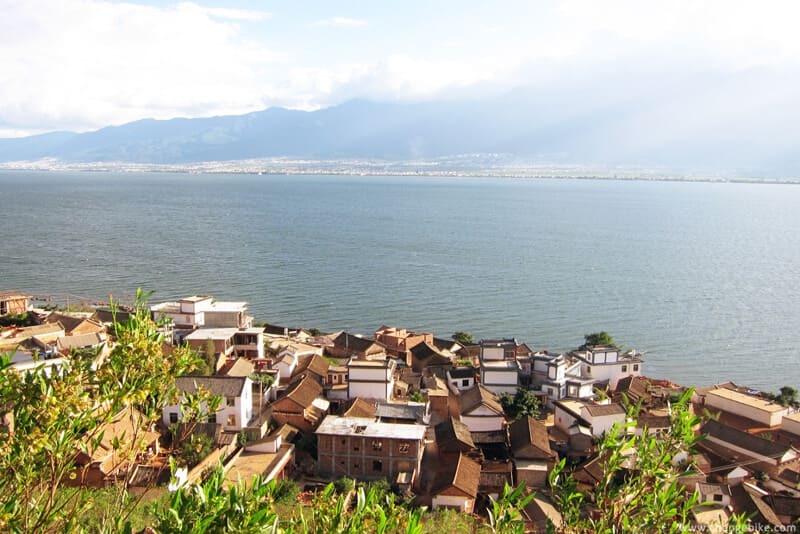 The cloudless Erhai Lake was separated by sea, and western Cang Mountain was on the other side. 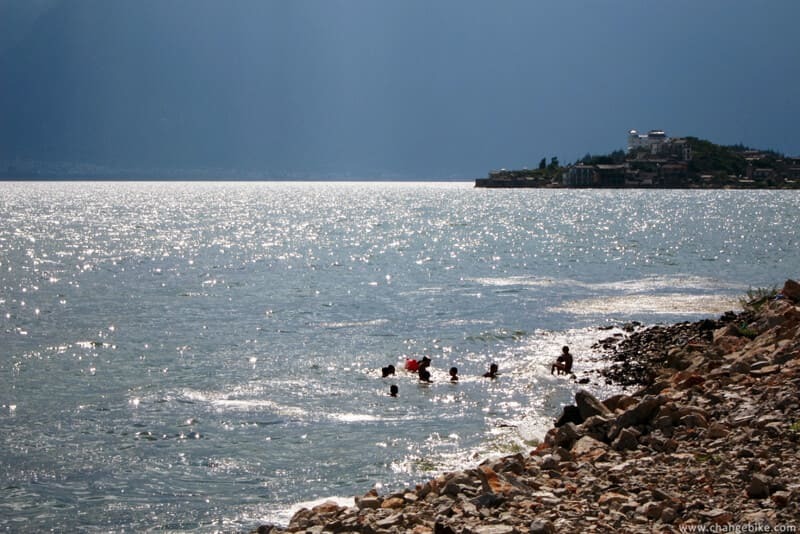 The waves on Erhai Lake were like a sea, and the sea wind slowly blew directly into our faces. 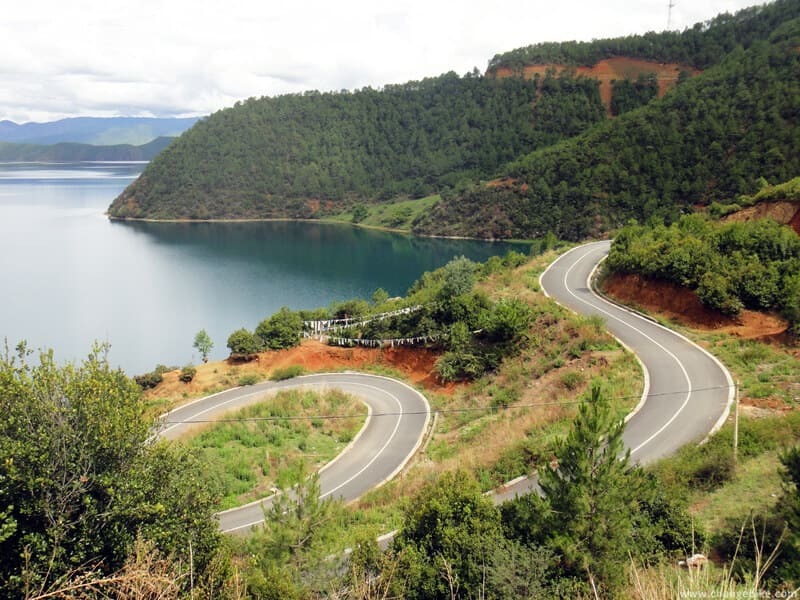 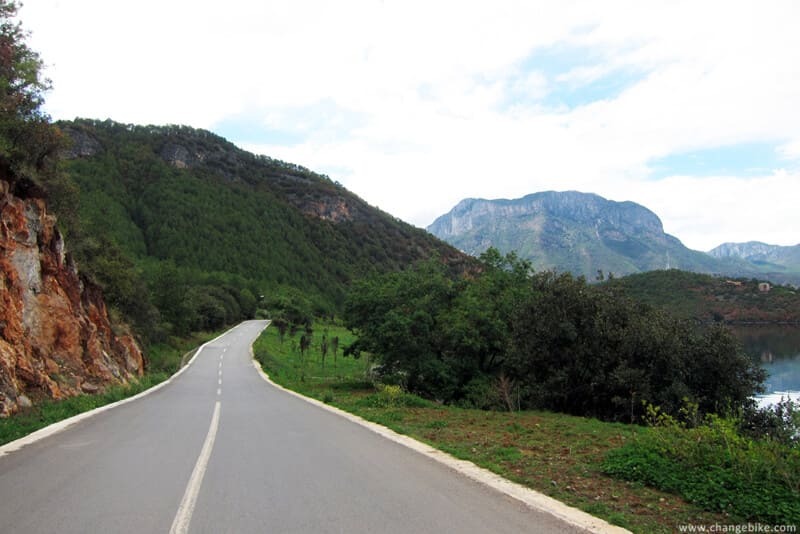 Additionally, the road around the lake between mountains and the lake extended continuously for 60 km, and all of these were so amazing! 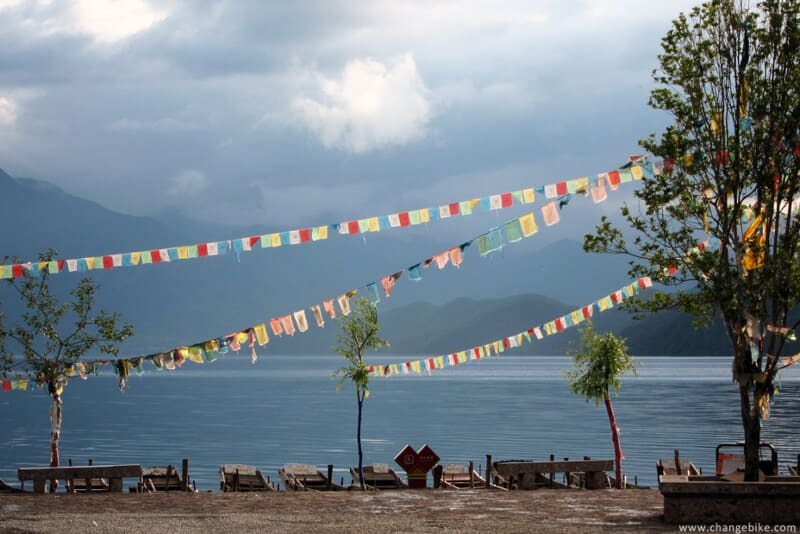 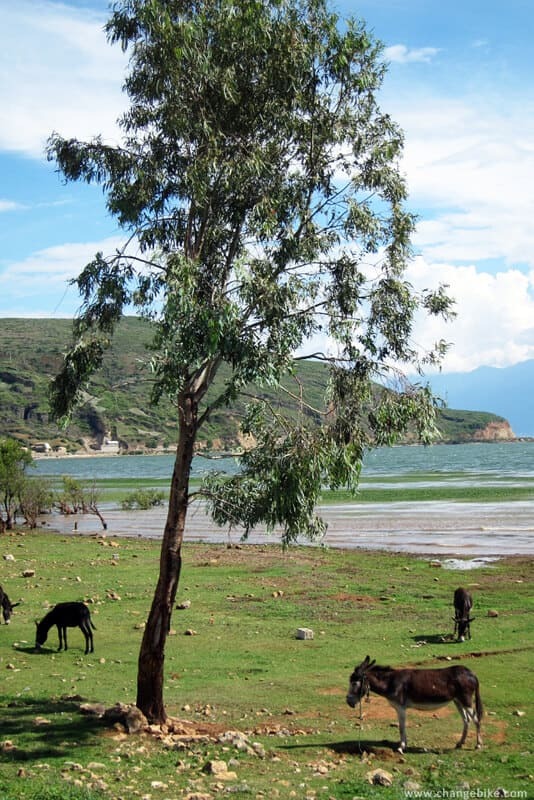 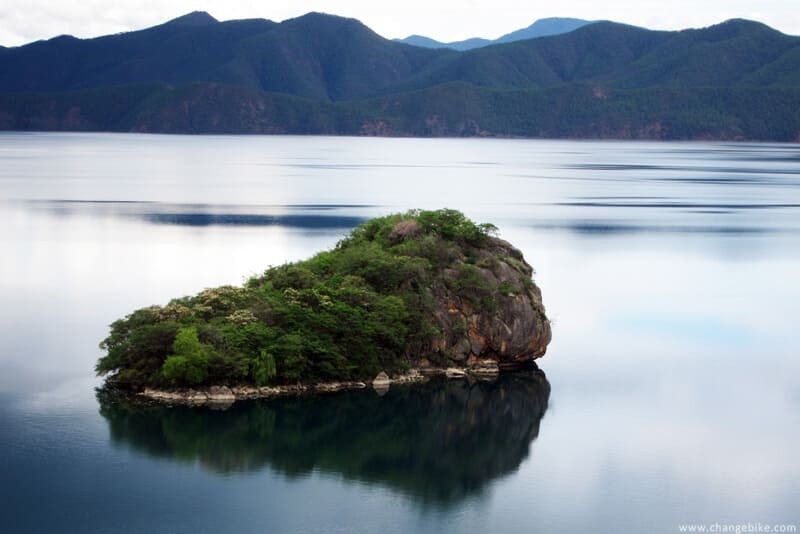 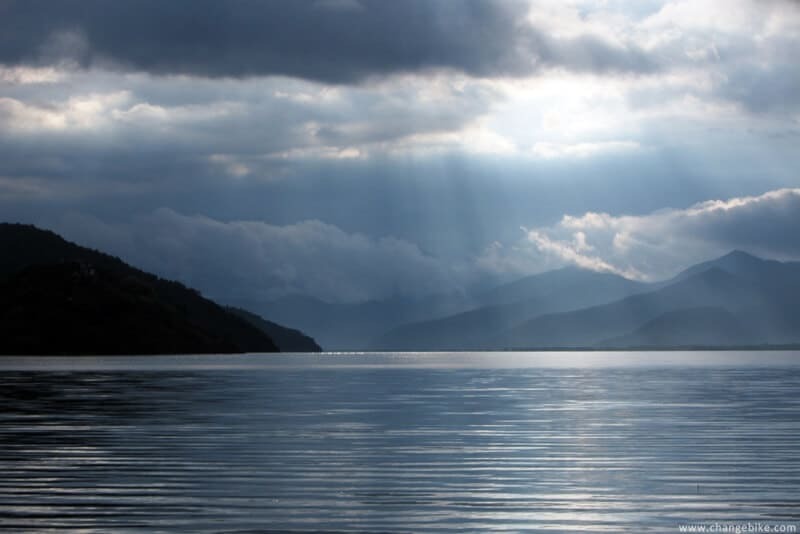 For me, the sensation of the Erhai Lake was more than Lugu Lake! 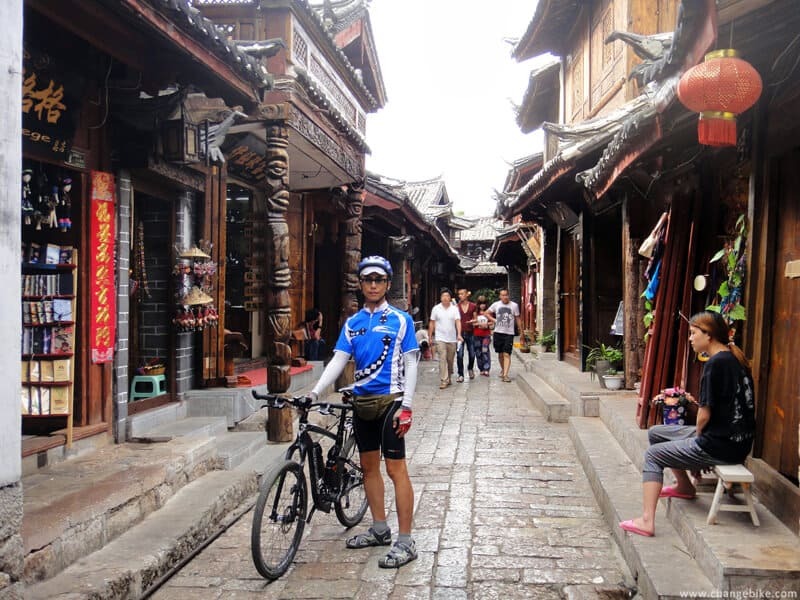 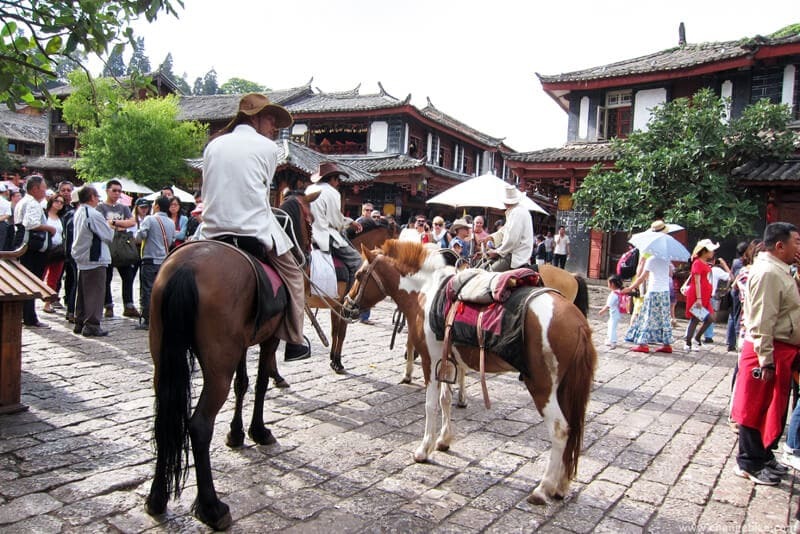 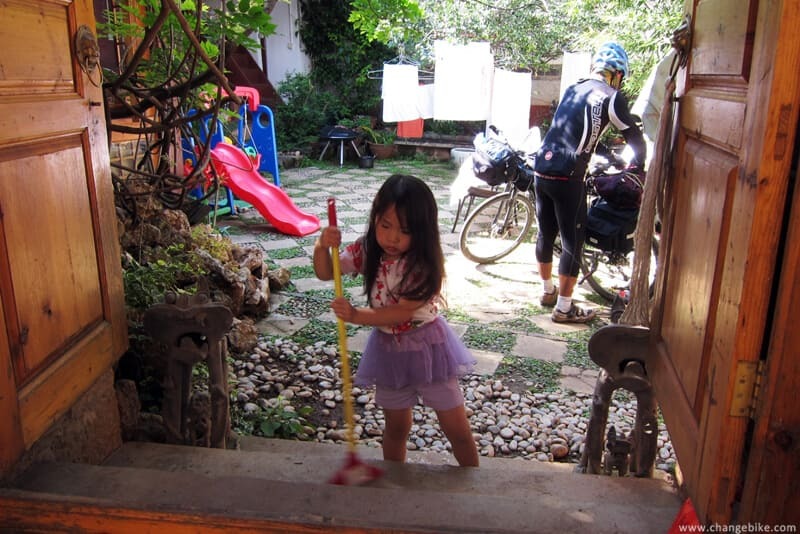 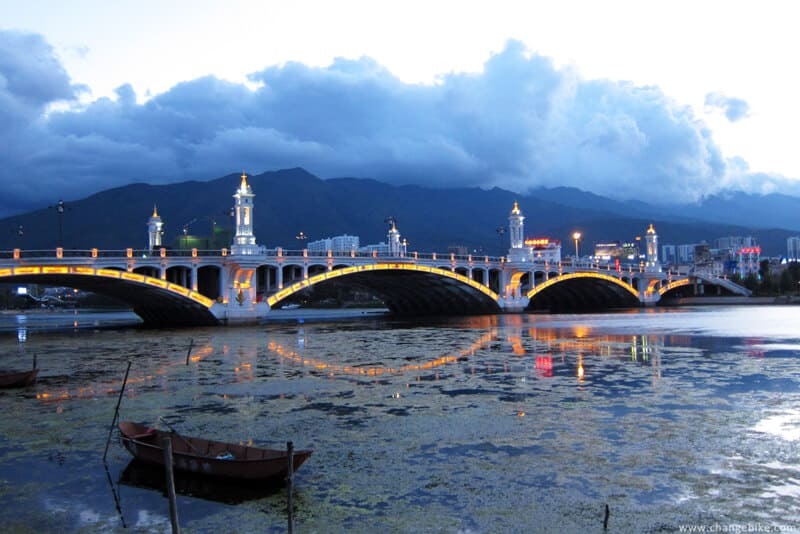 At 9:00 pm, we arrived in Dali Old Town, and we had ridden for 124 km today. 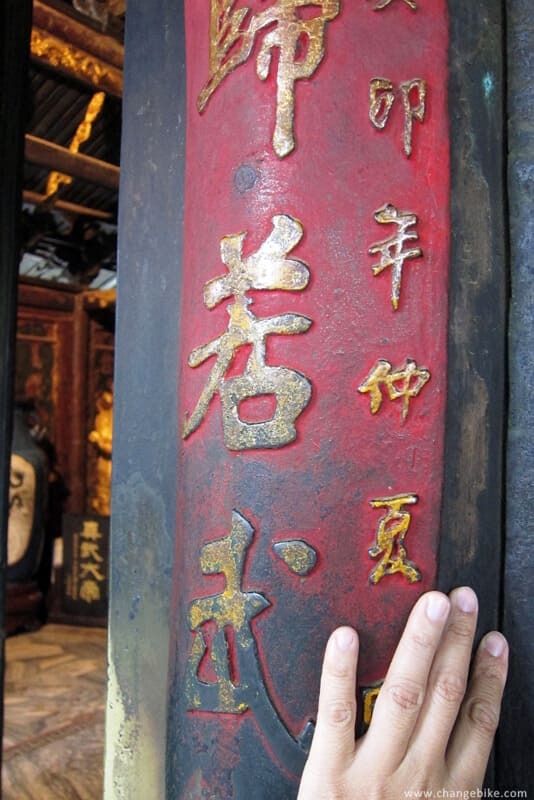 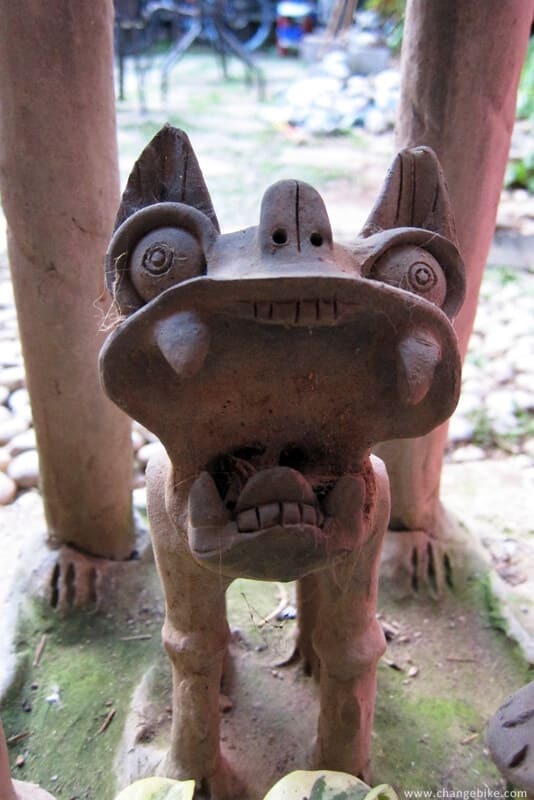 which must be photographed, on the south gate. 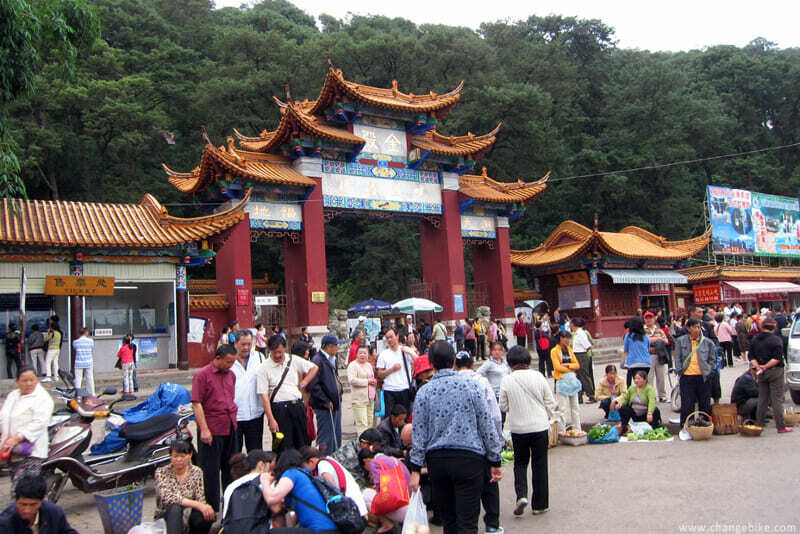 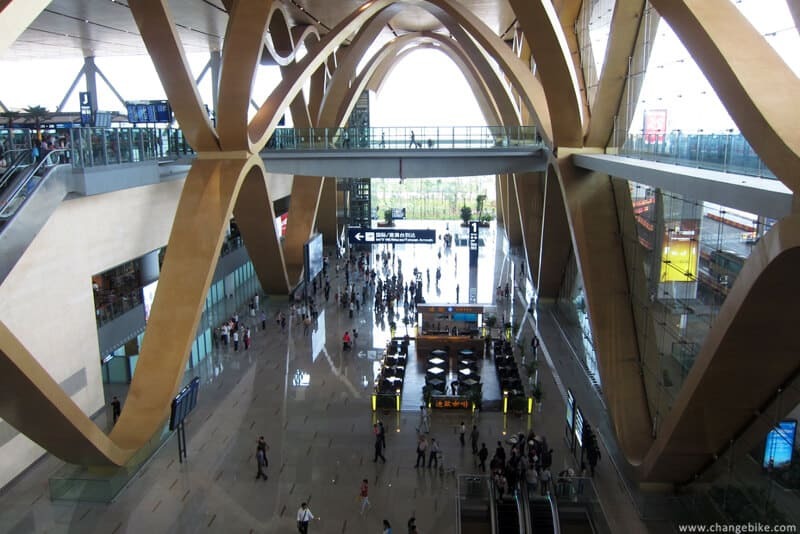 After that, we spent an hour buying tickets for leaving for Kunming. 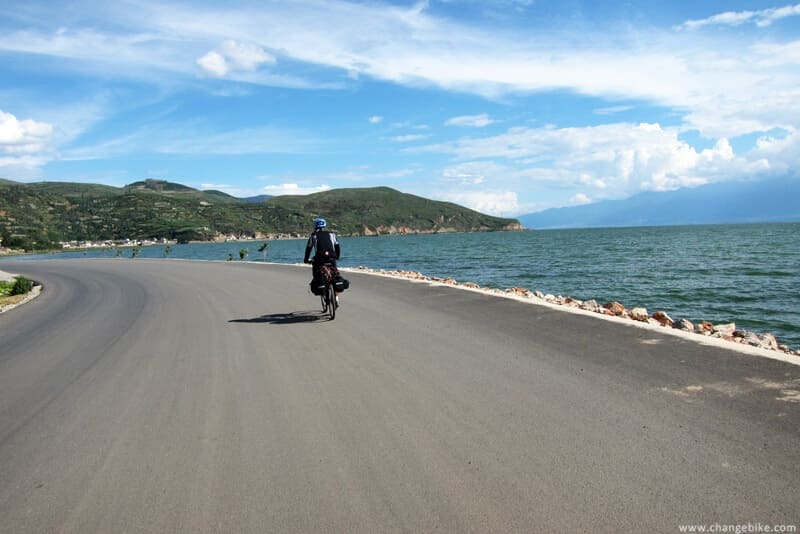 It was almost 11:00 am, and we were just getting started to ride north along the west of the Erhai Lake. 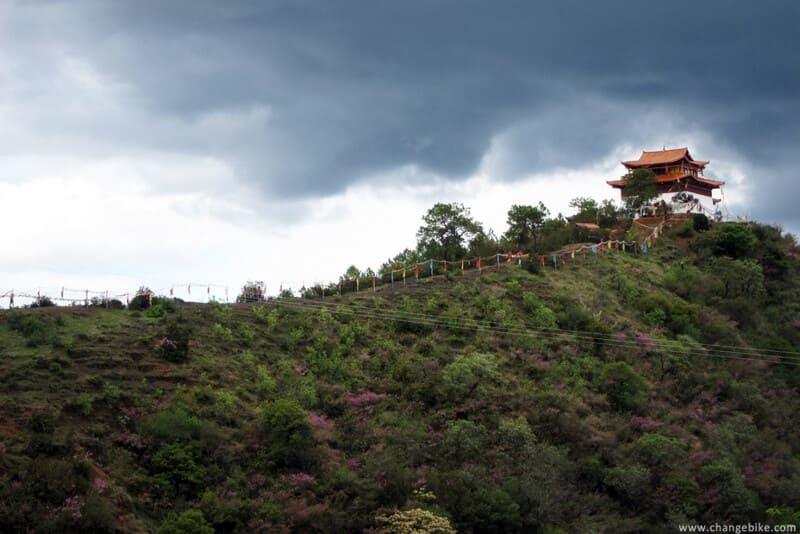 The weather was gloomy today, and I had no feelings about the scenery. 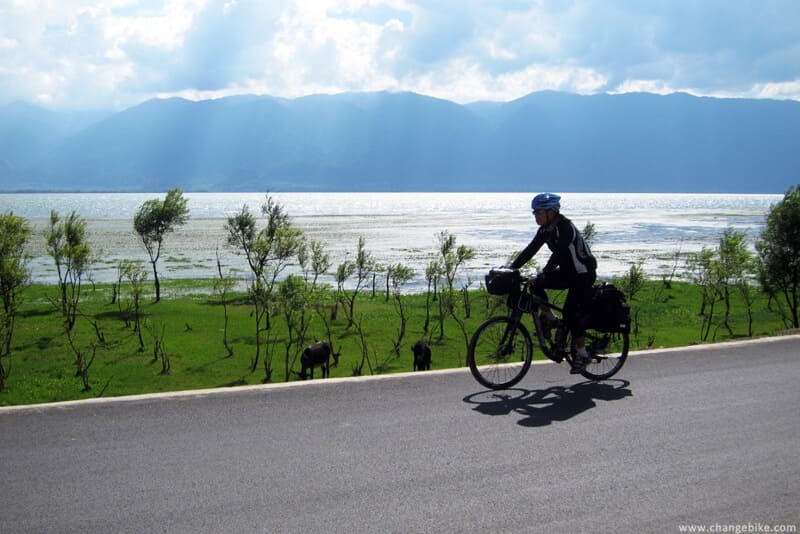 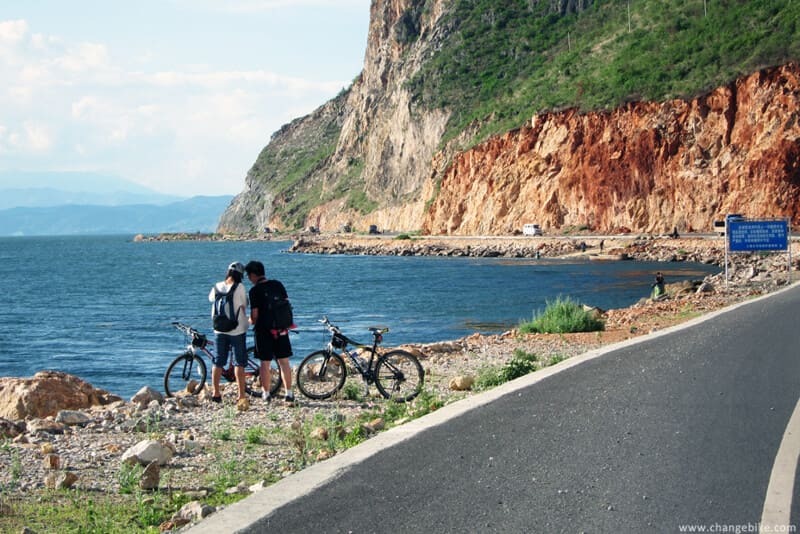 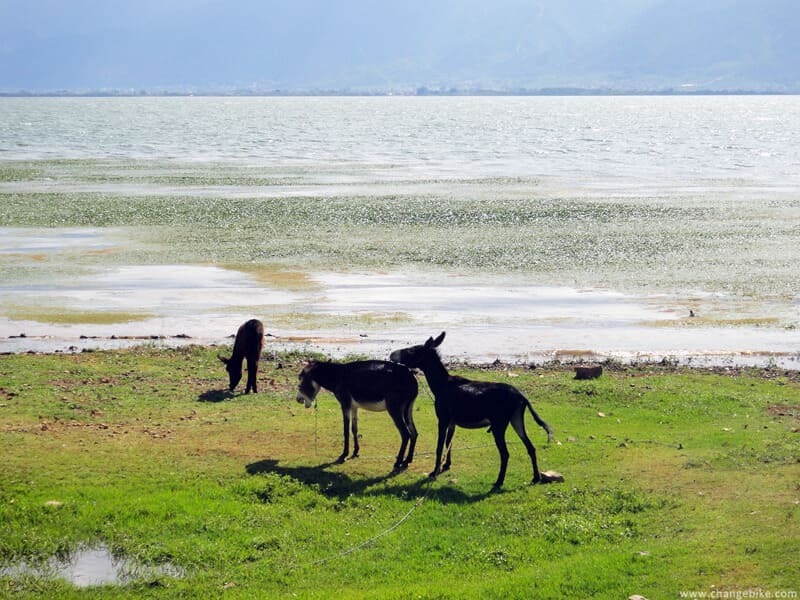 Fortunately, we had experienced the magnificent scenery of Erhai Lake in such mild wind and bright sun. 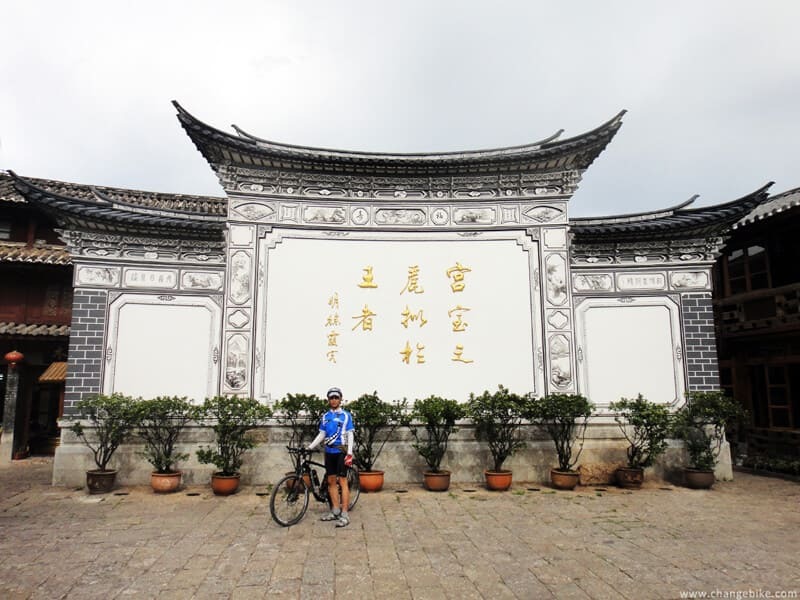 Only riding for a while, we arrived in the scenery spot of the Three Pagodas. 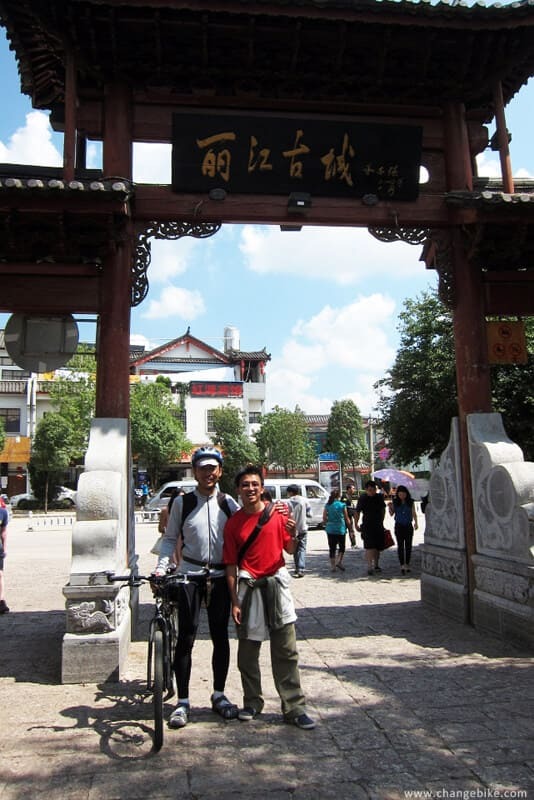 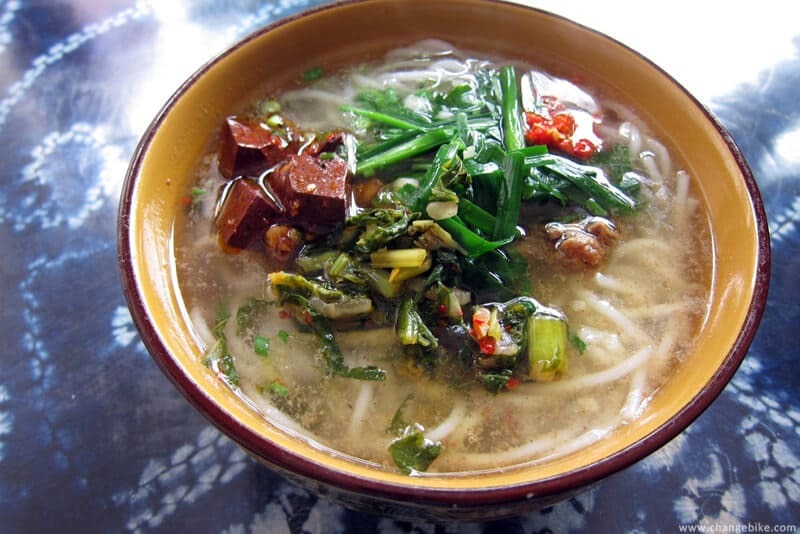 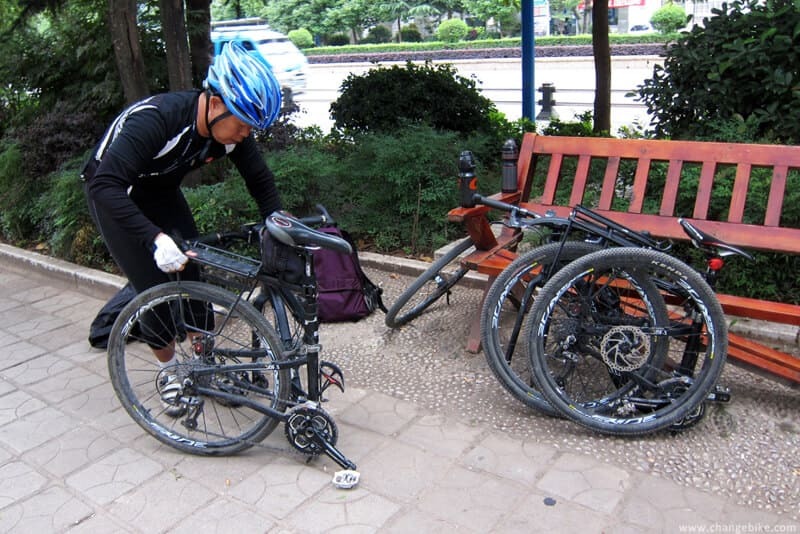 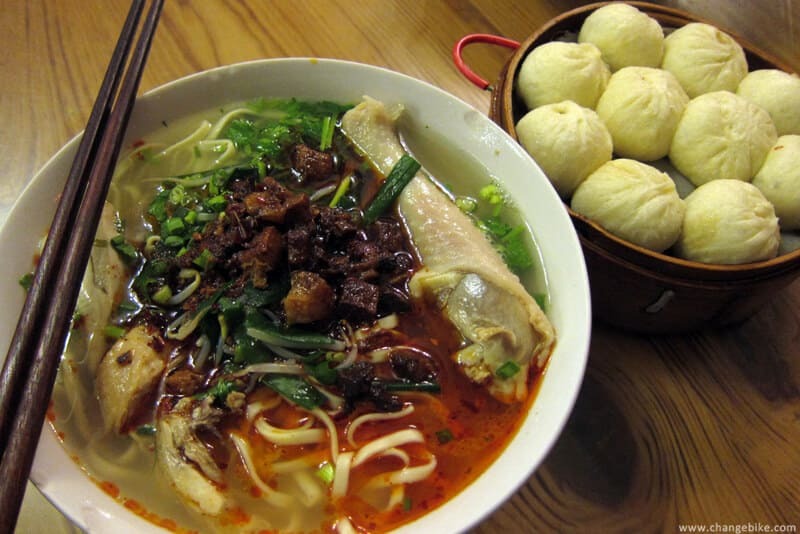 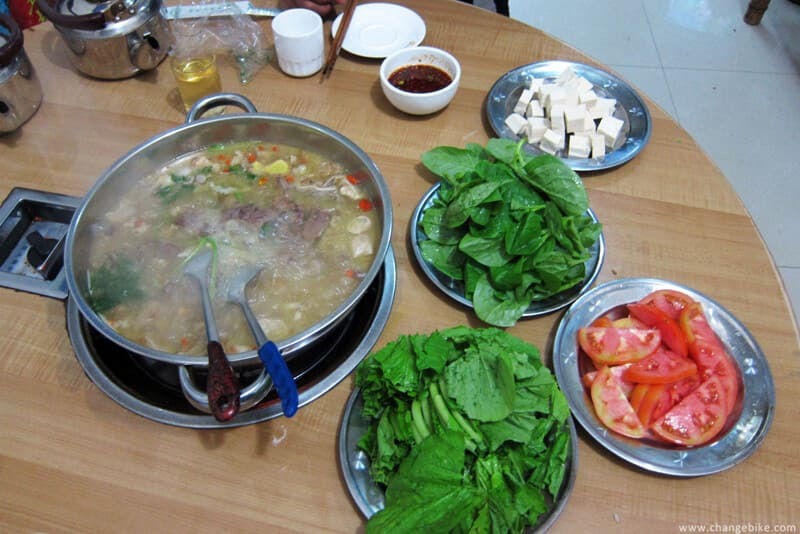 We kept riding north for 20 km, and then arrived in Xizhou Town. 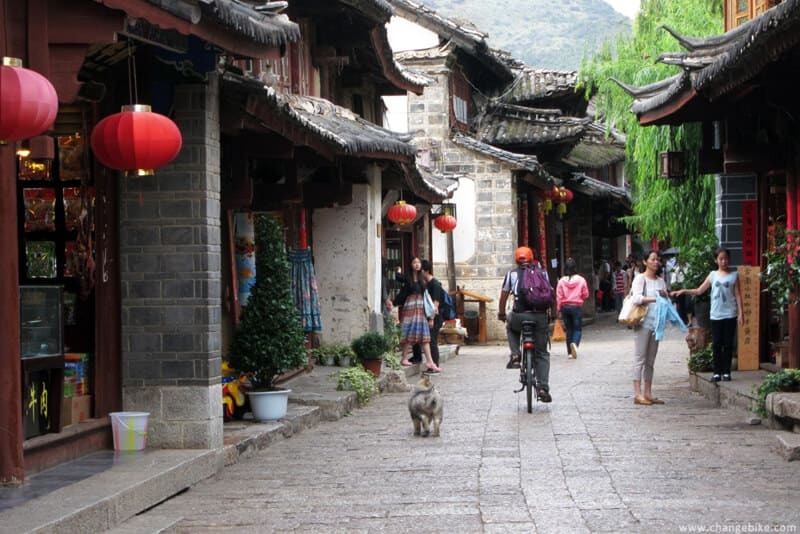 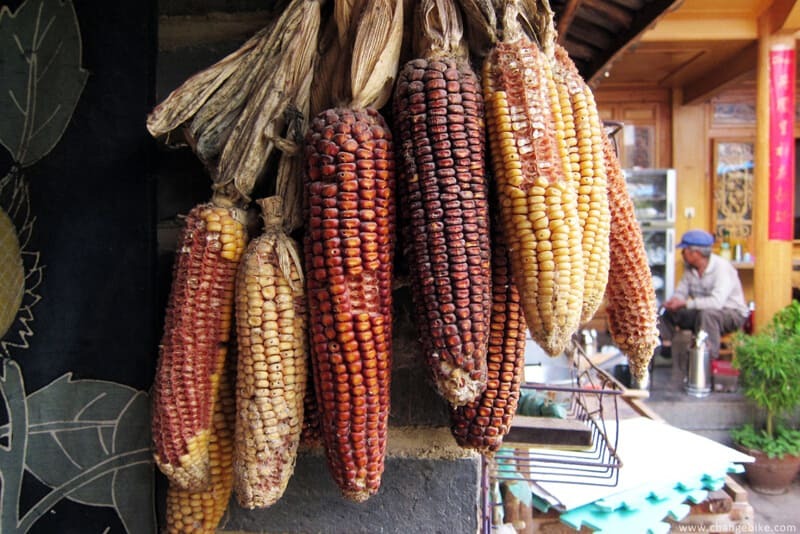 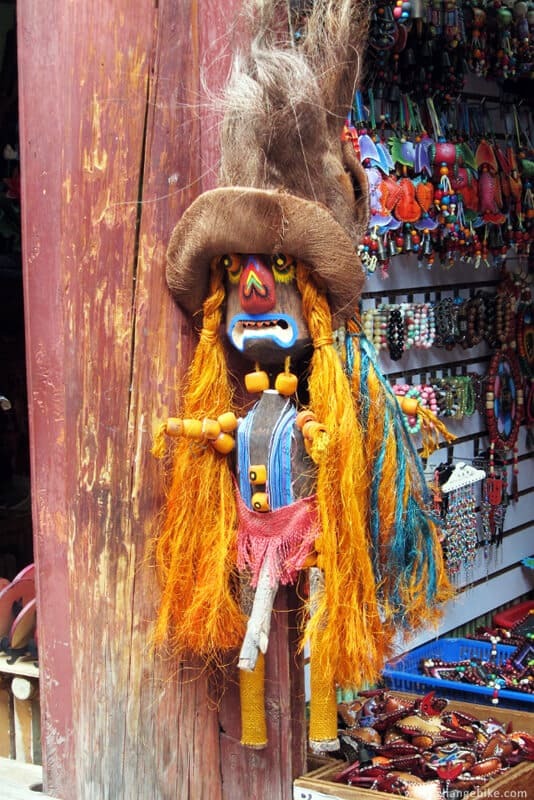 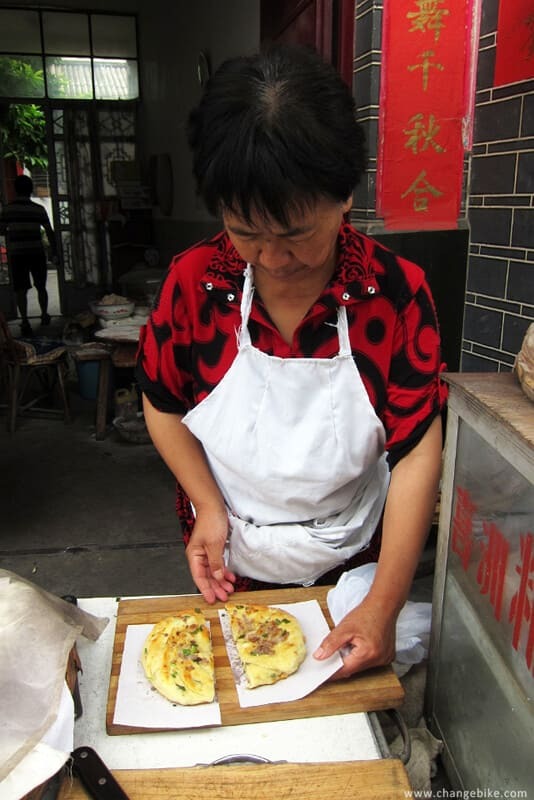 It was much less commercialized here than the towns in Dali Old Town. 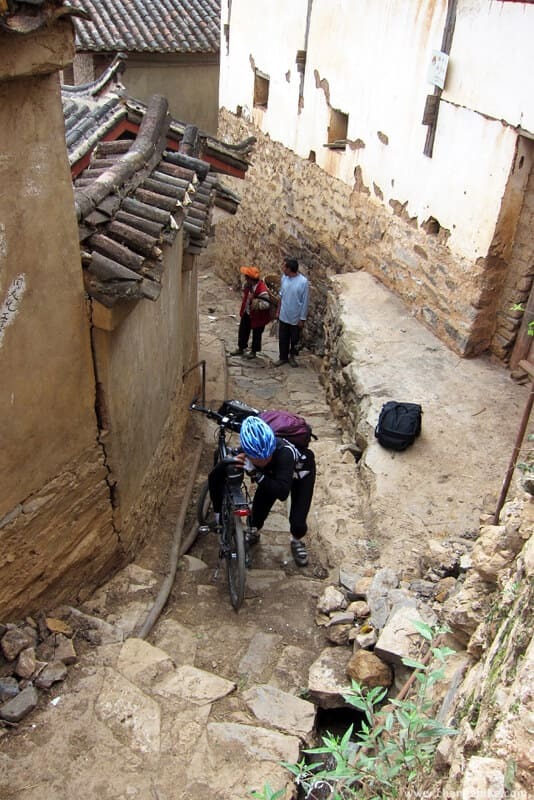 We desperately rode bikes in alleys. 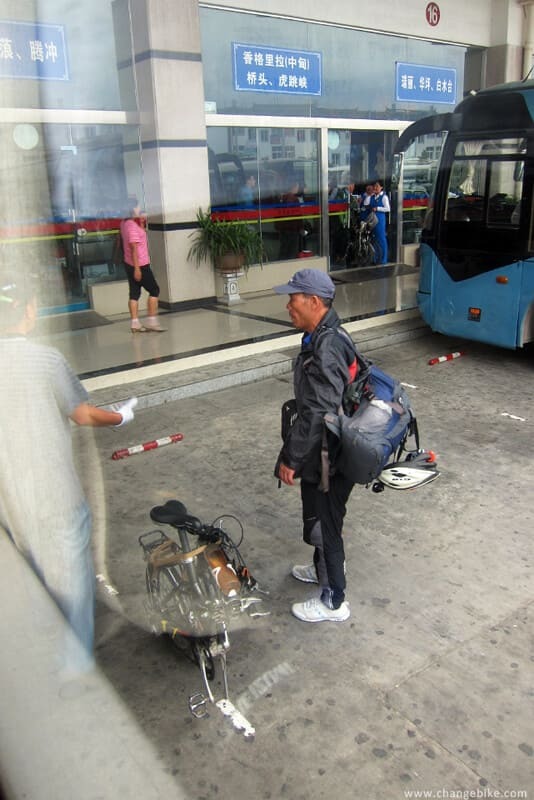 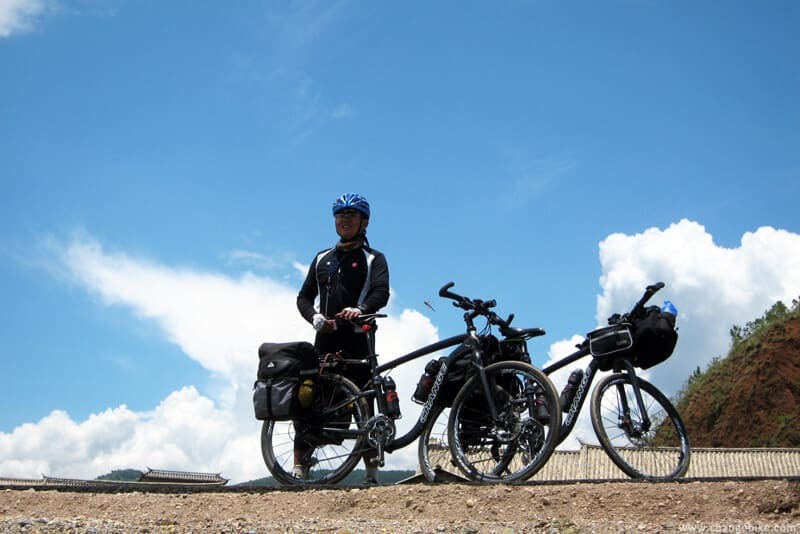 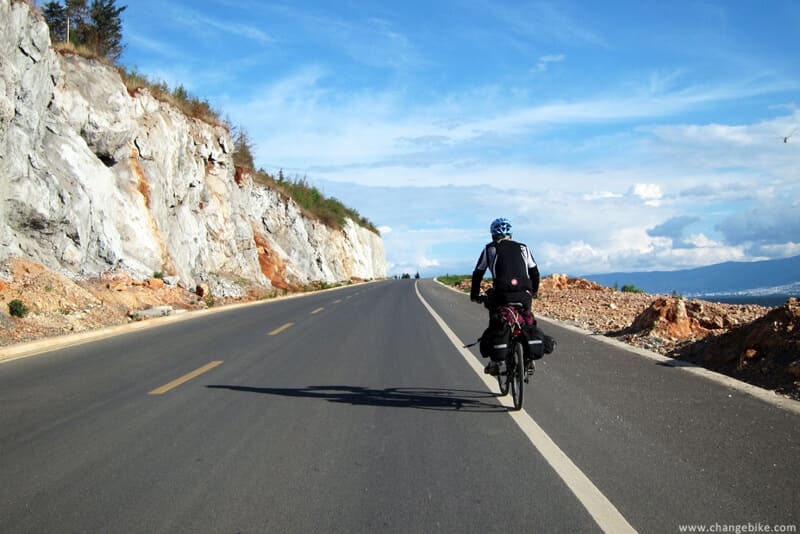 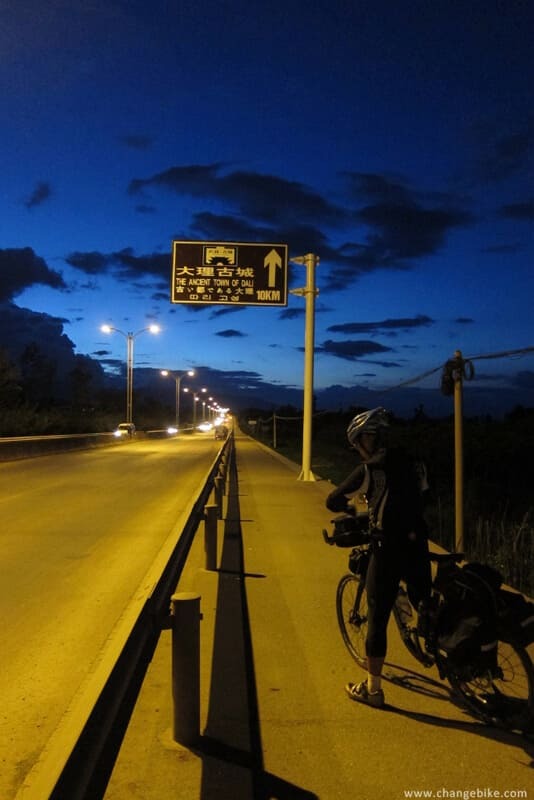 At 4:30 pm, we took a bus to Kunming, and I was thinking the bike trip in the past thirteen days, which I felt like a dream. 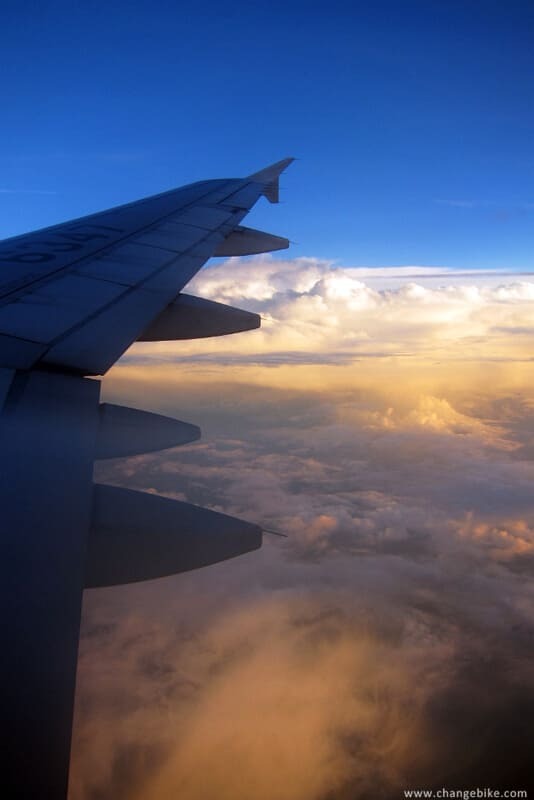 I really thought this was an amazing dream. 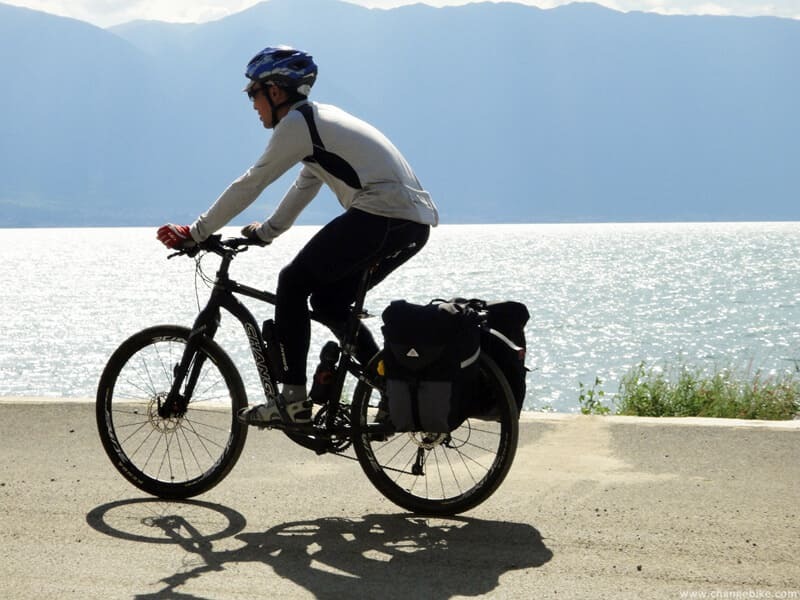 I would satisfactorily complete the mini grand tour of the bike before forty years old! 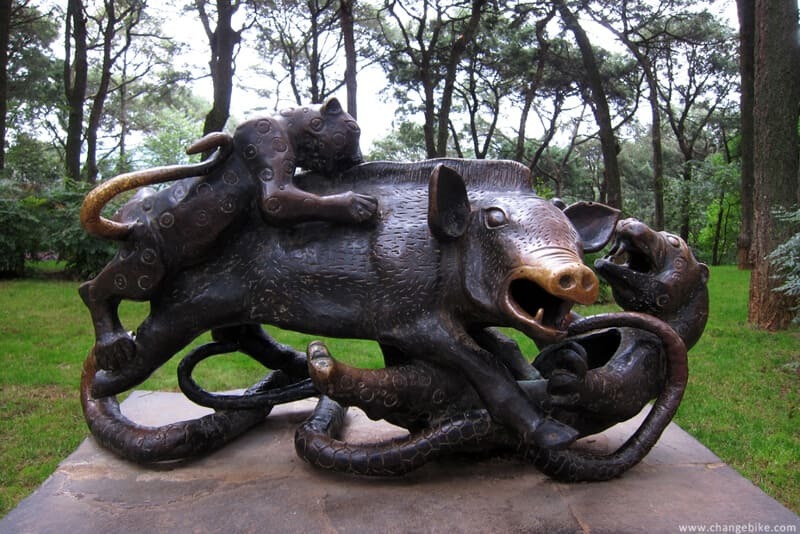 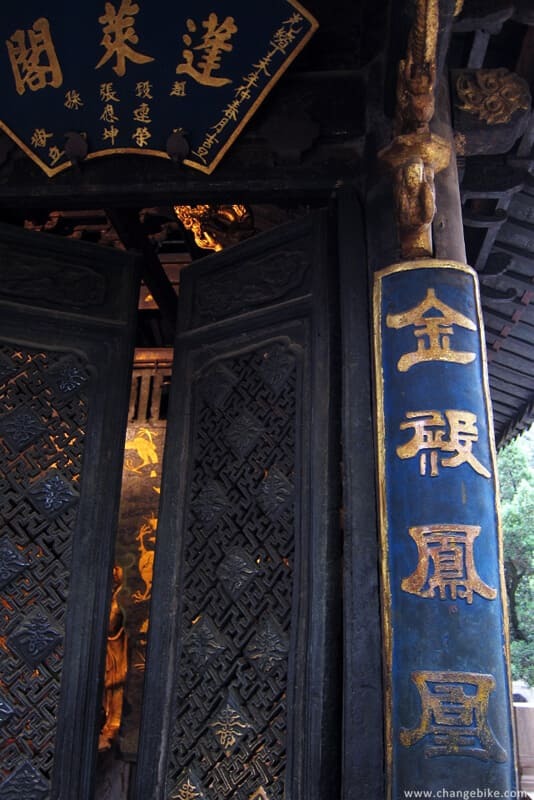 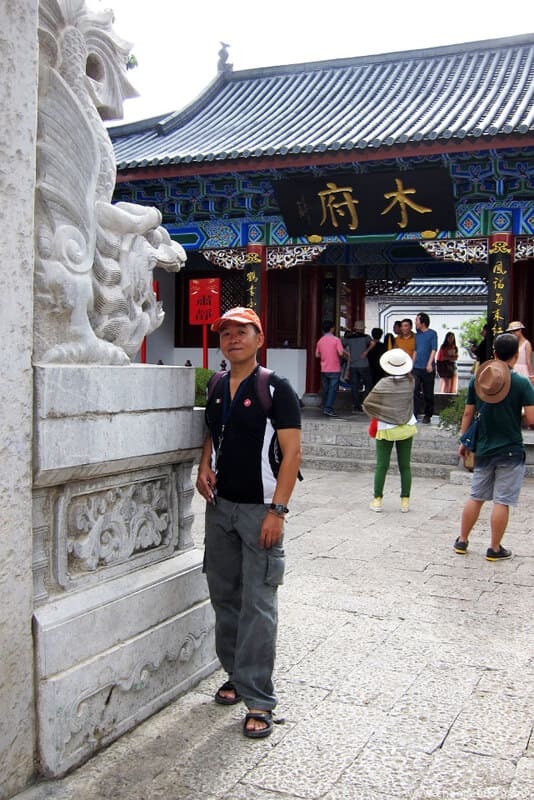 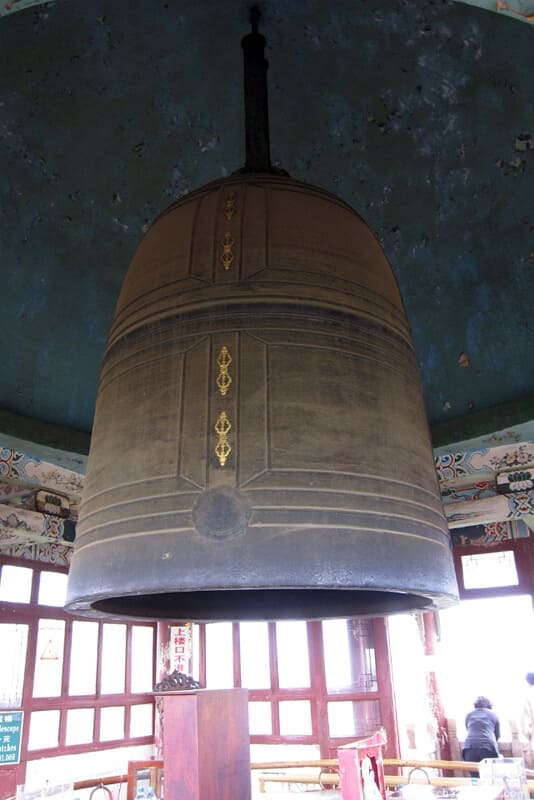 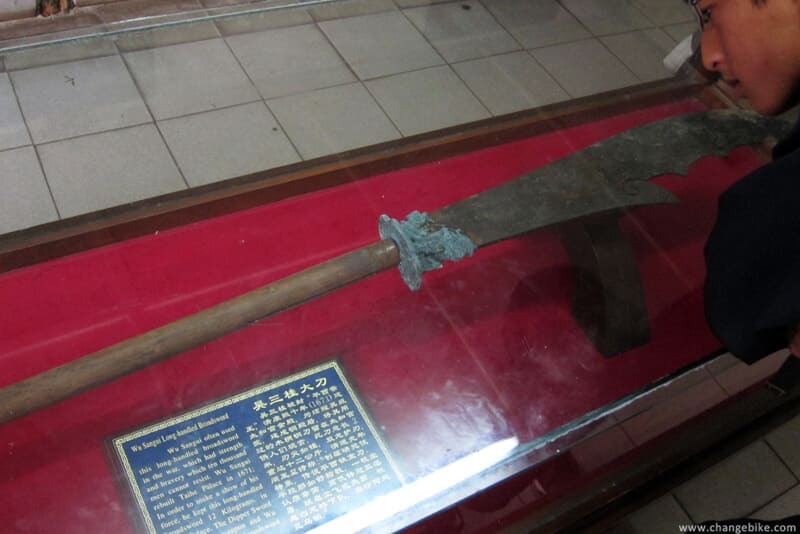 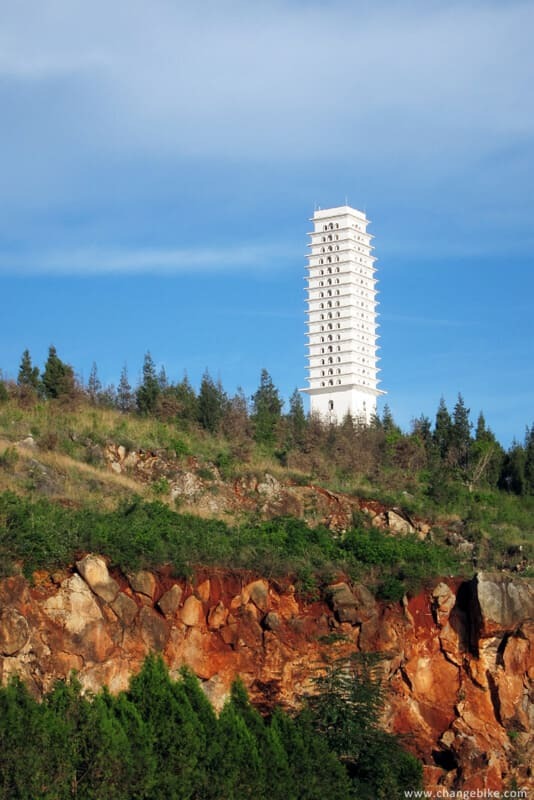 so we had enough time to visit Bronze Hall located in the northeast of Kunming City. 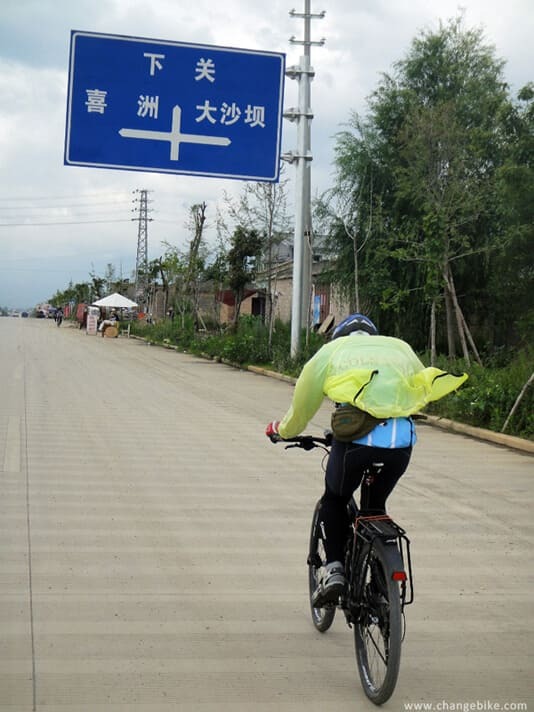 Just 12.5 km, we spent 70 minutes riding to Bronze Hall yet because the subway was being constructed and people were rushing to work. 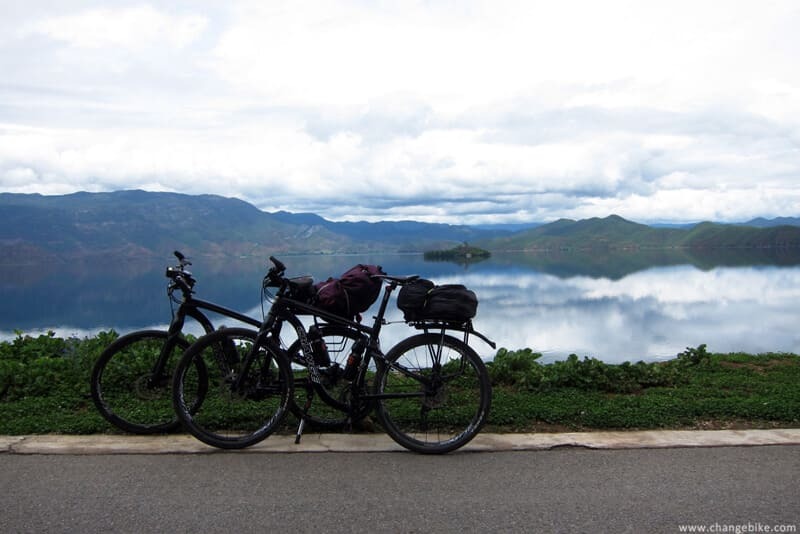 Luckily, we would have regretted if we missed the scenery spot. 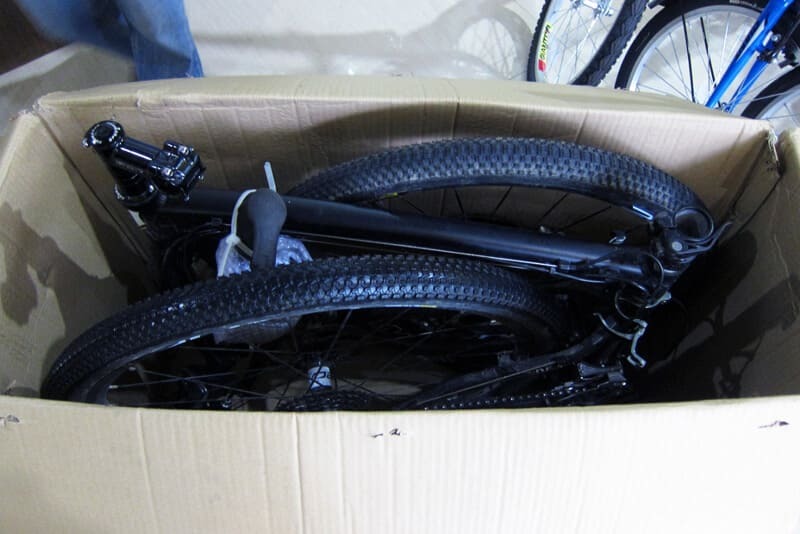 At about 12:00pm, luckily, we found suitable boxes for our bikes (not as high as 10cm). 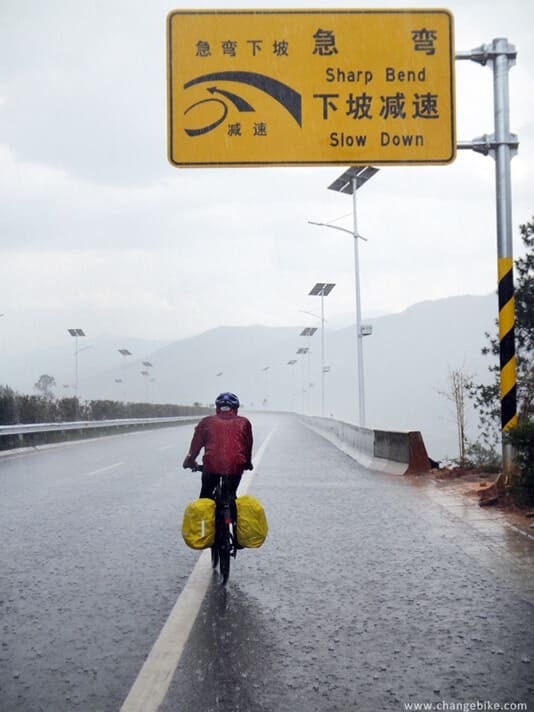 Now, it rained a lot, and we spent almost twenty minutes finding a taxi driver. 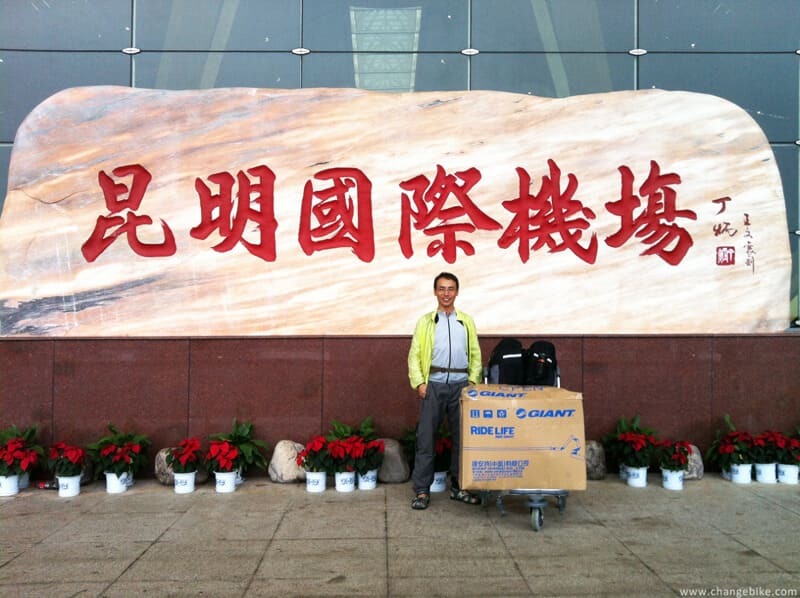 We asked him to drive us to Changshui International Airport, which was just open less than a week. 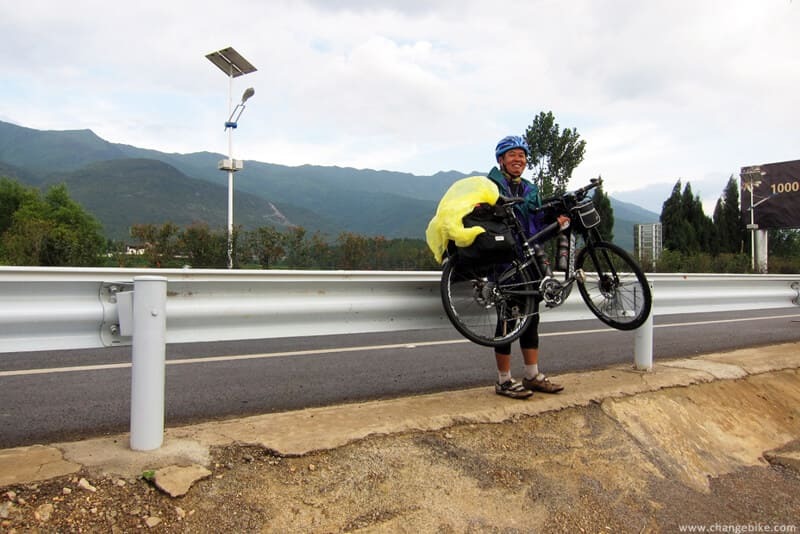 I returned to Taiwan safely, and I satisfactorily complete the mini grand tour of the bike before forty years old!